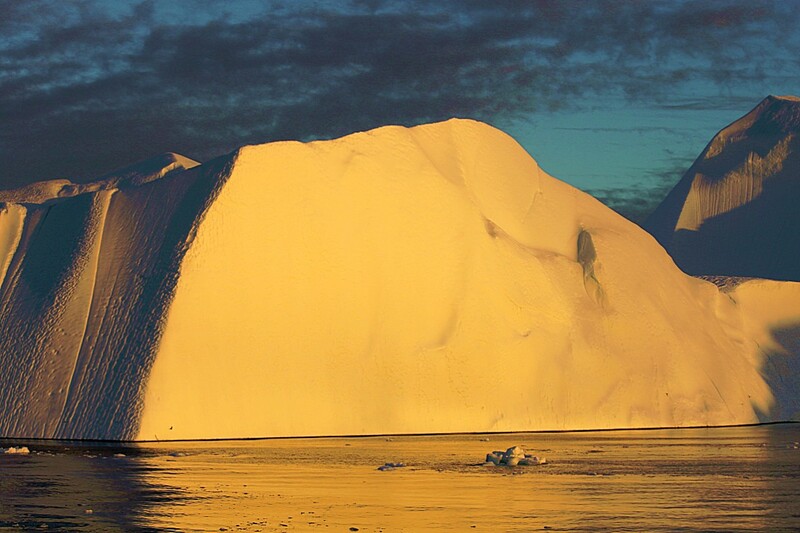 If, for a scientific experiment, you’d ask a large group of toddlers: “What color is the color of ice?” You’ll probably get an overwhelming group of toddlers answering: “White”. 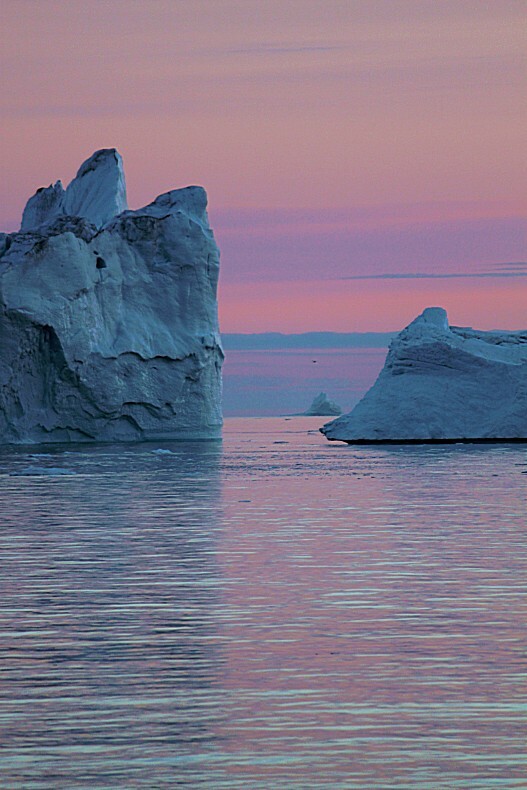 Maybe a few think of Italian gelato and mention pink or orange, but I’m guessing they will be in a slim minority. 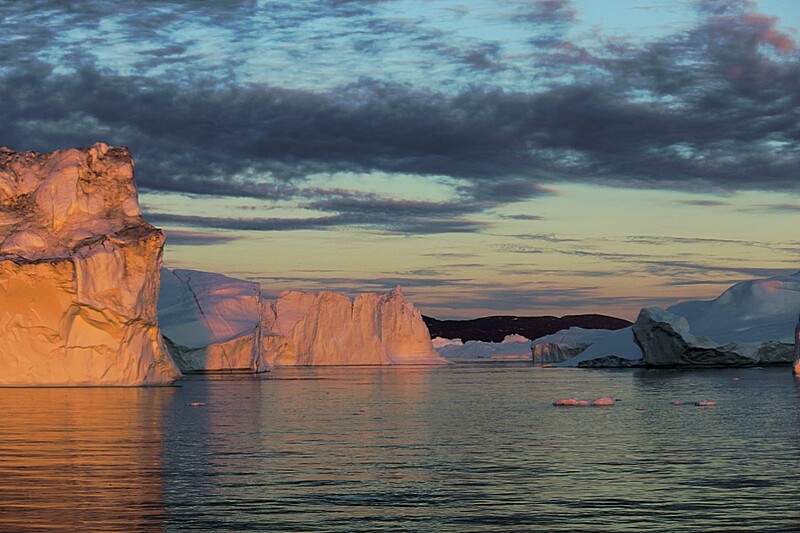 The icebergs gather at the end of the fjord, from where they start spreading over Disco Bay providing a great opportunity to sail among them. 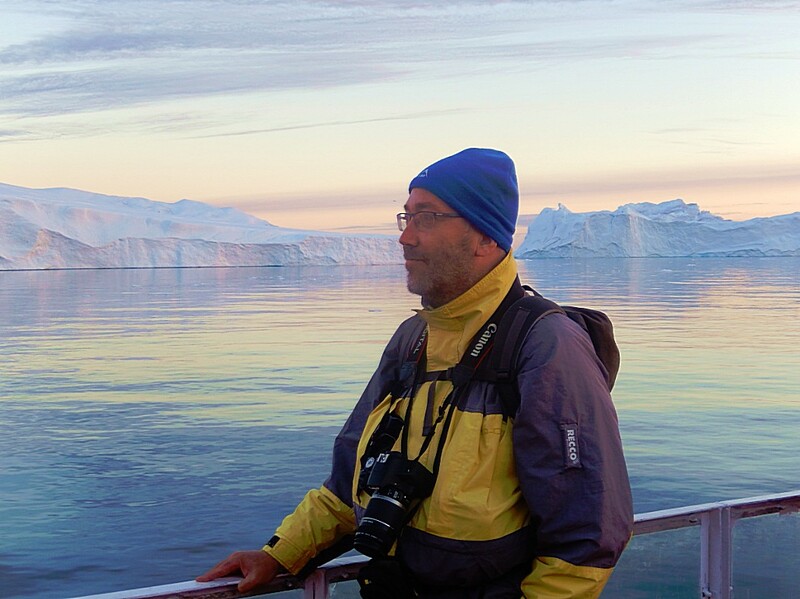 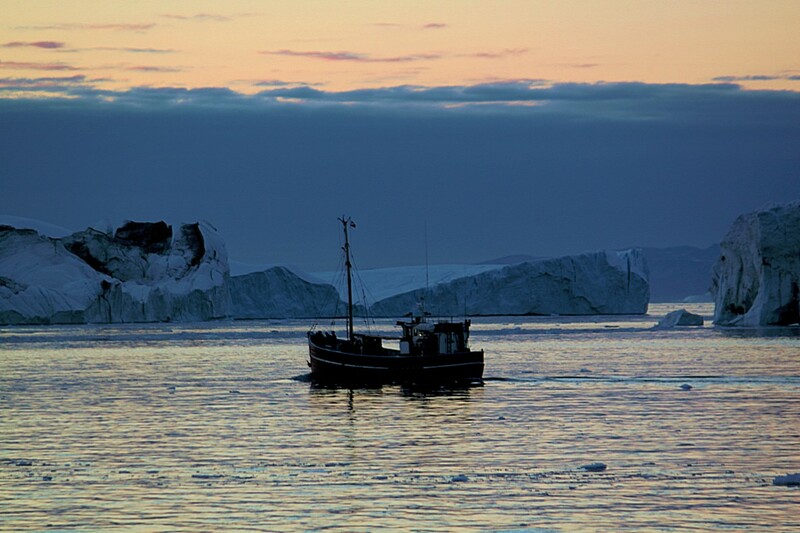 After leaving the small harbour of Ilulissat, the ship turned south, towards the end of the fjord and immediately the icebergs came in to view. 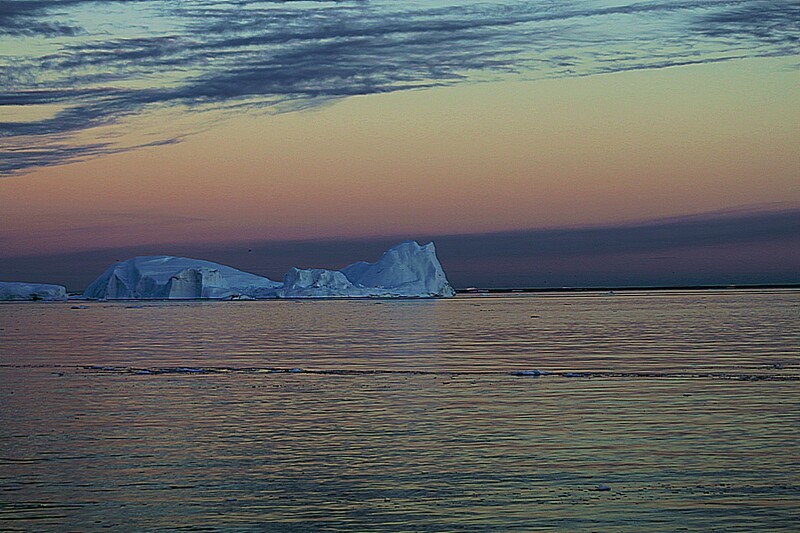 The waning light of the setting sun was getting more and more a red light, and that was what the icebergs in front of me were reflecting. 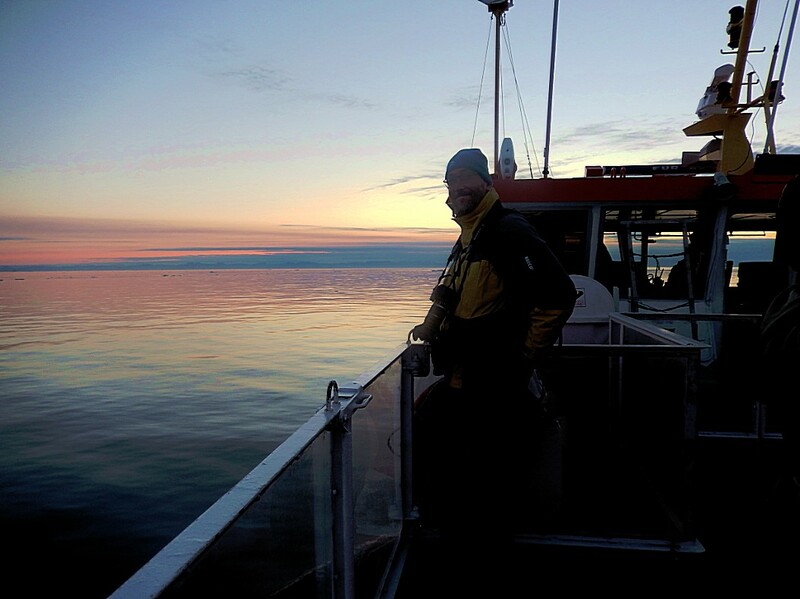 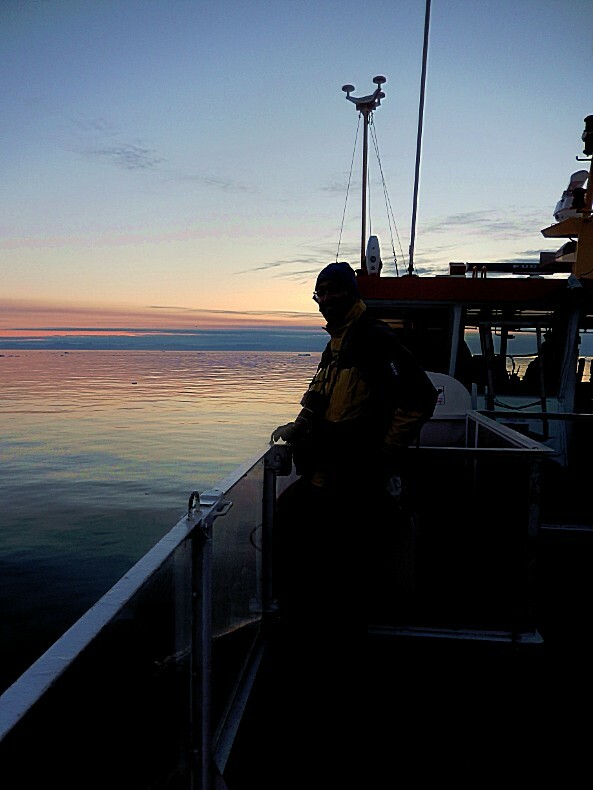 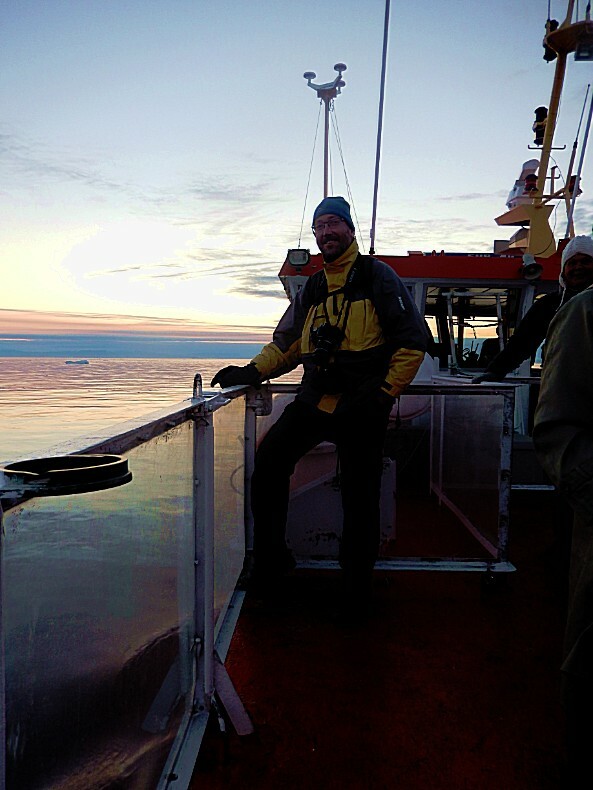 Our captain said that we were very lucky because there were lots of low clouds hanging above us, which according to him, would considerably enlarge the spectacle we were going to witness. 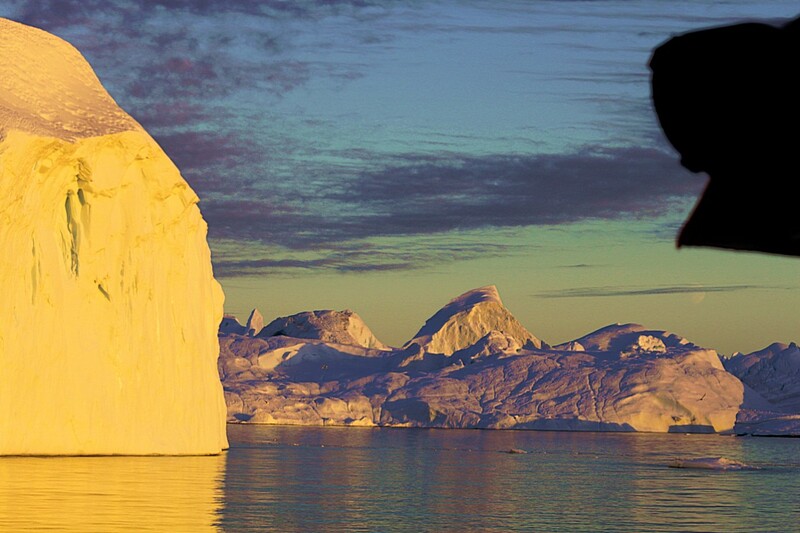 And he was right! 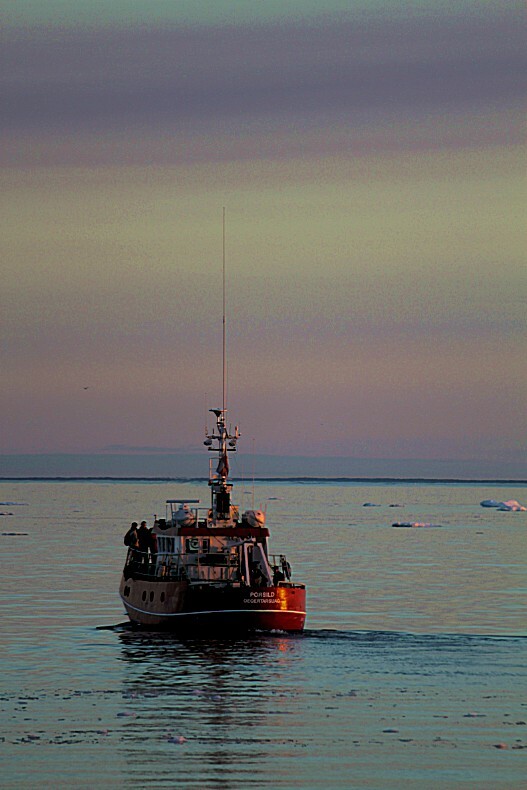 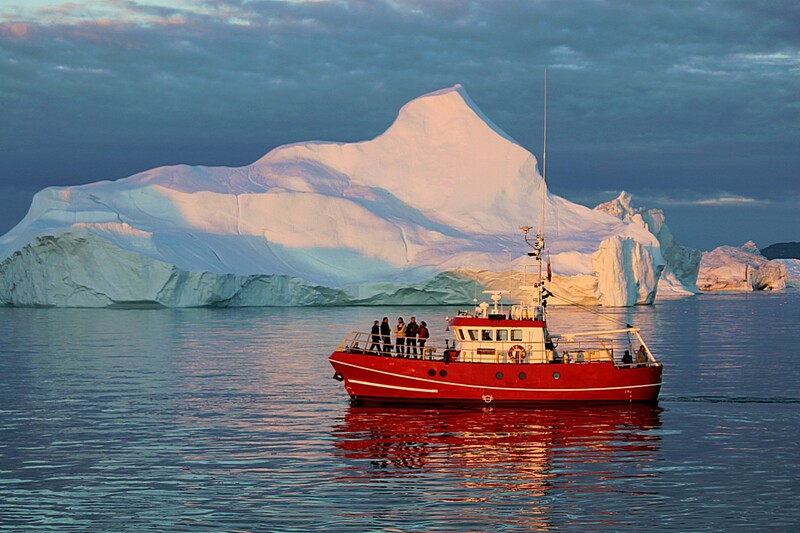 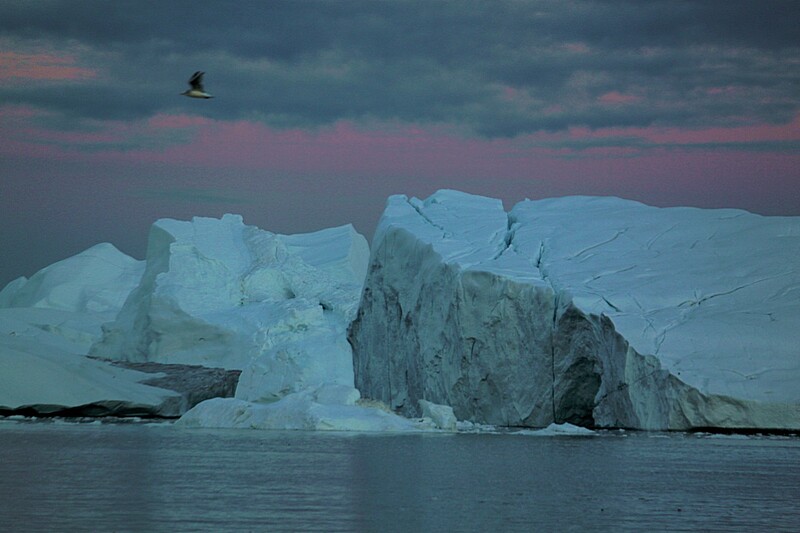 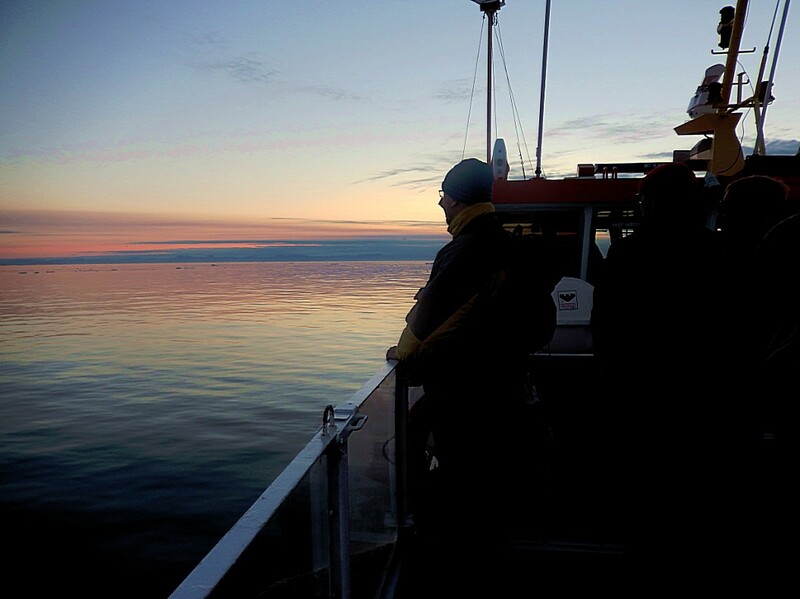 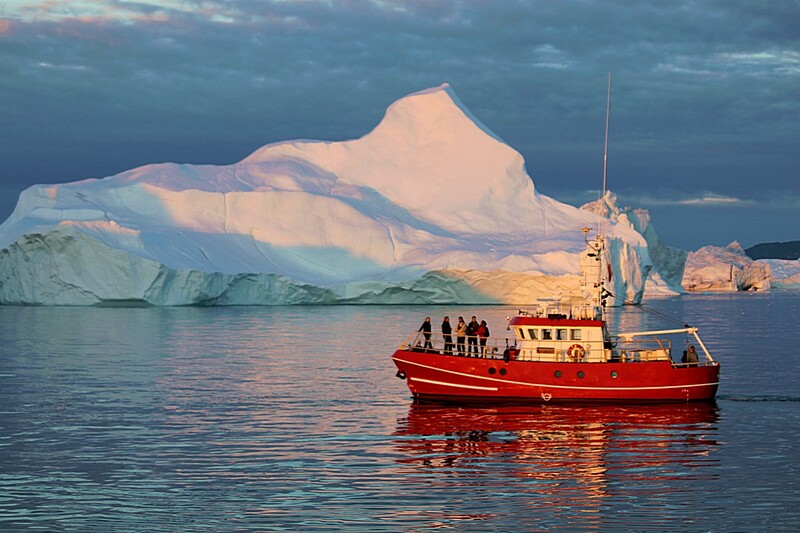 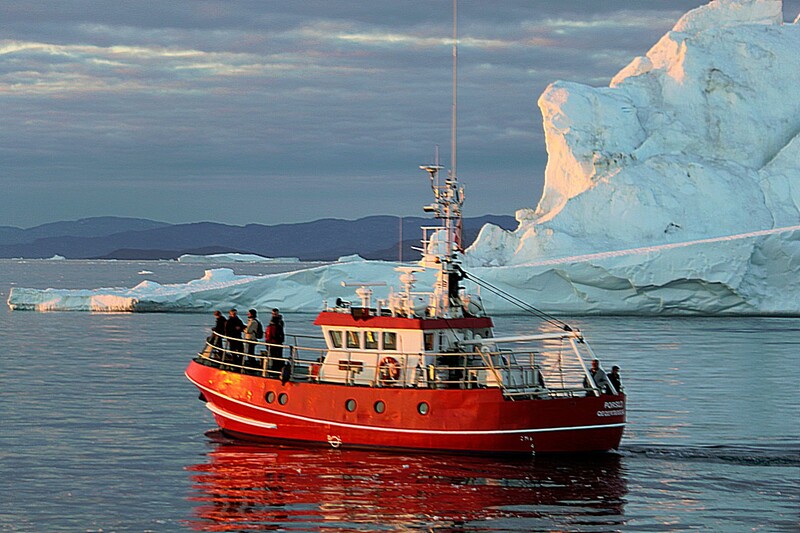 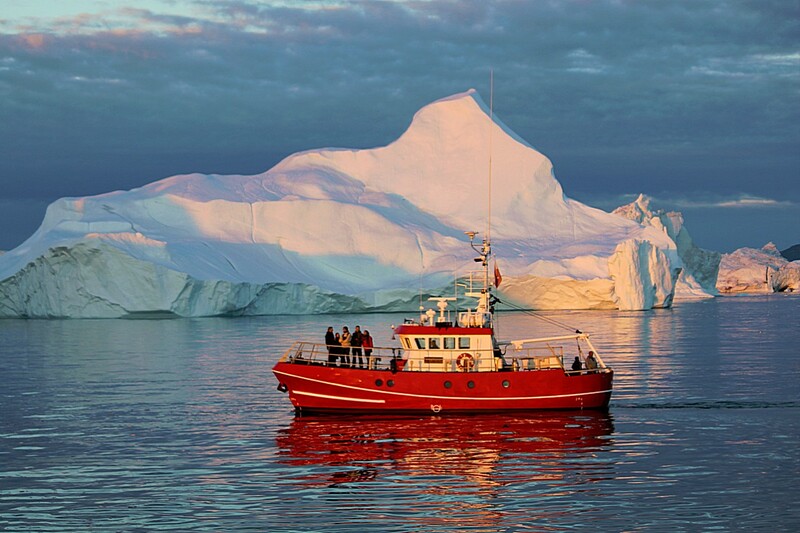 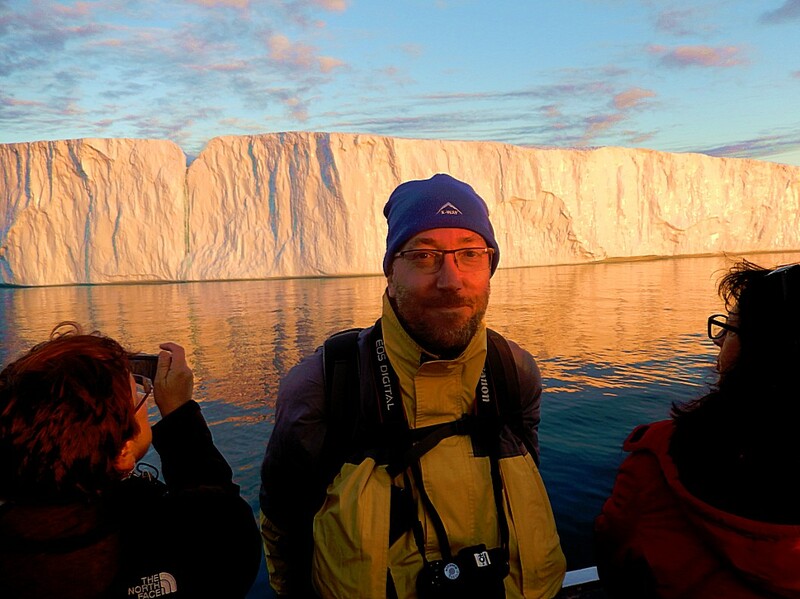 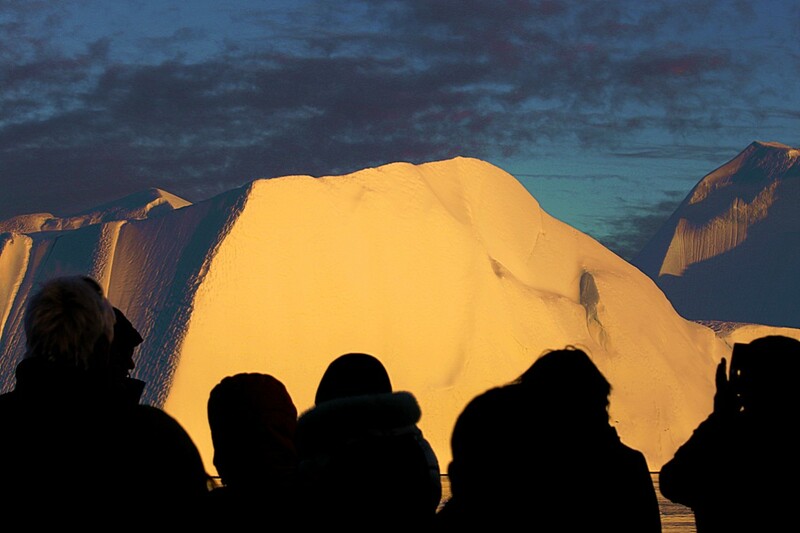 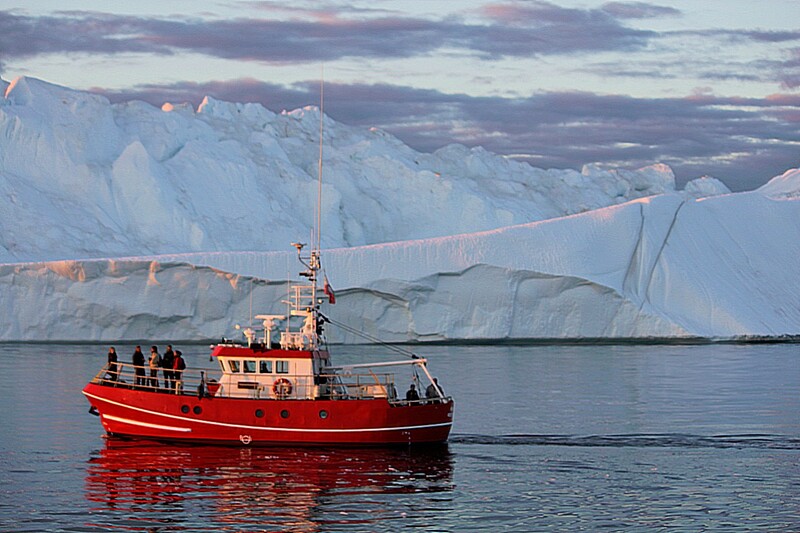 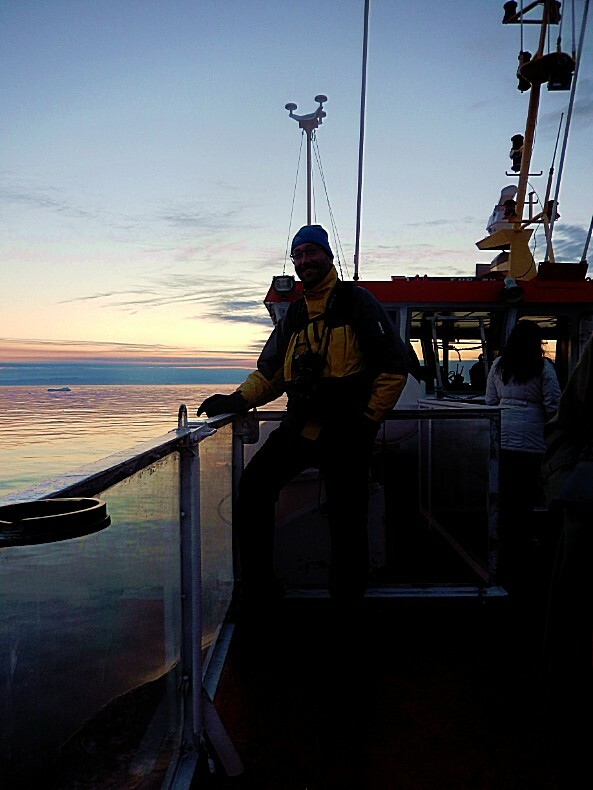 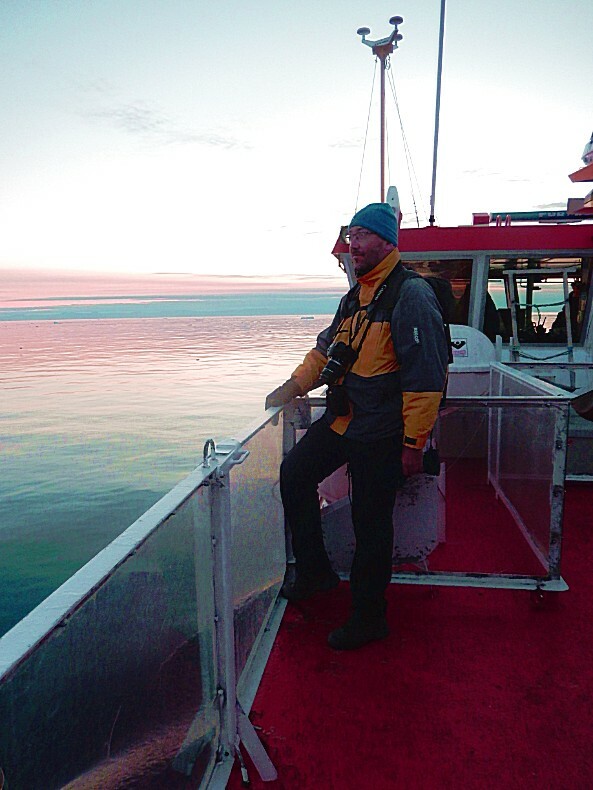 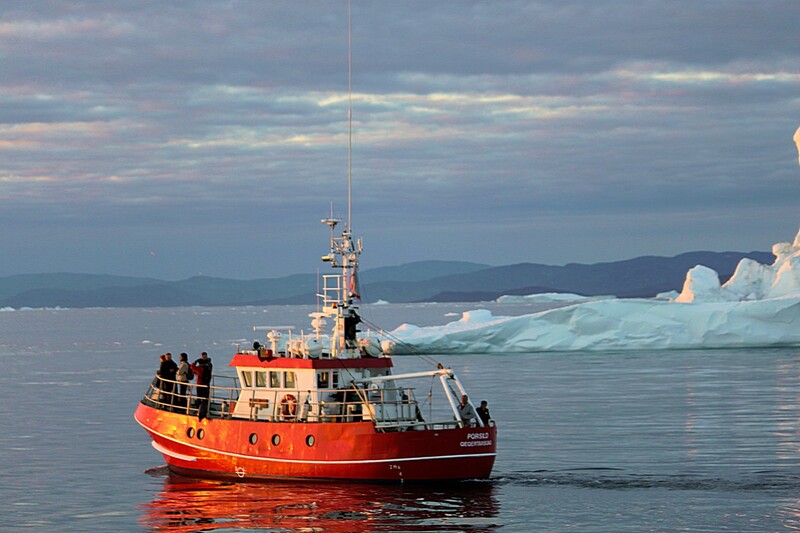 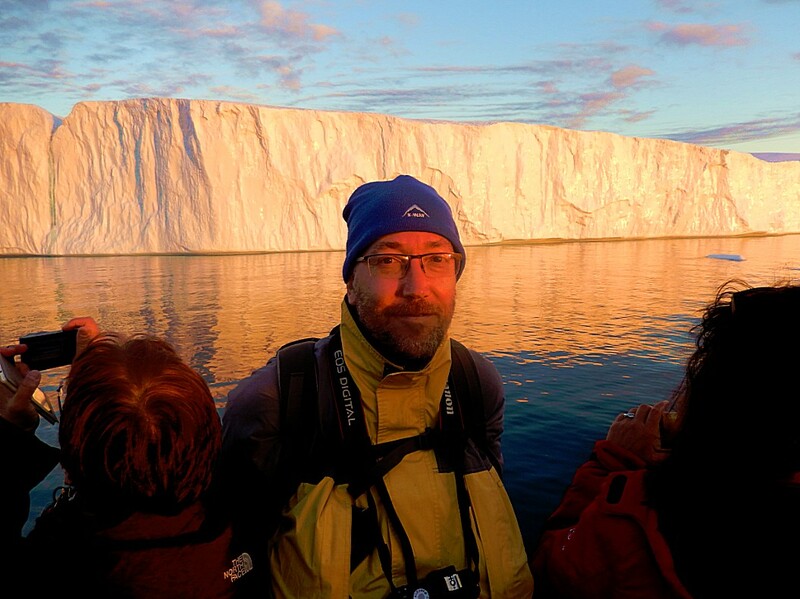 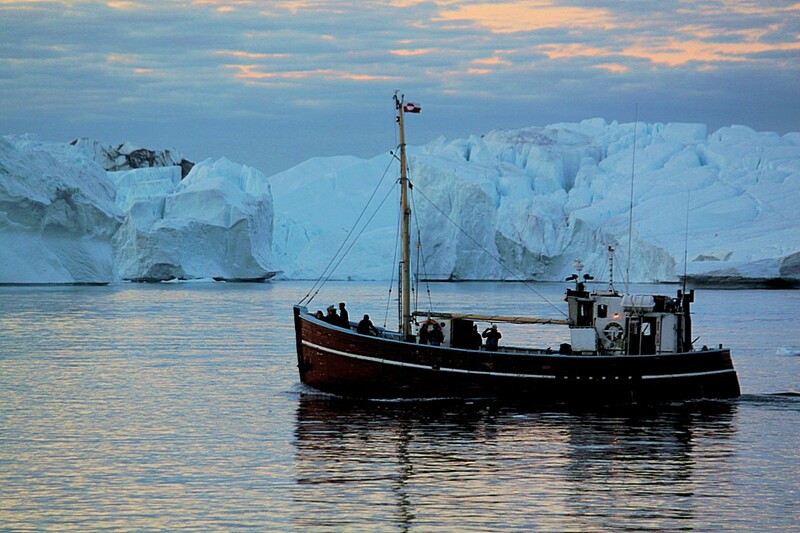 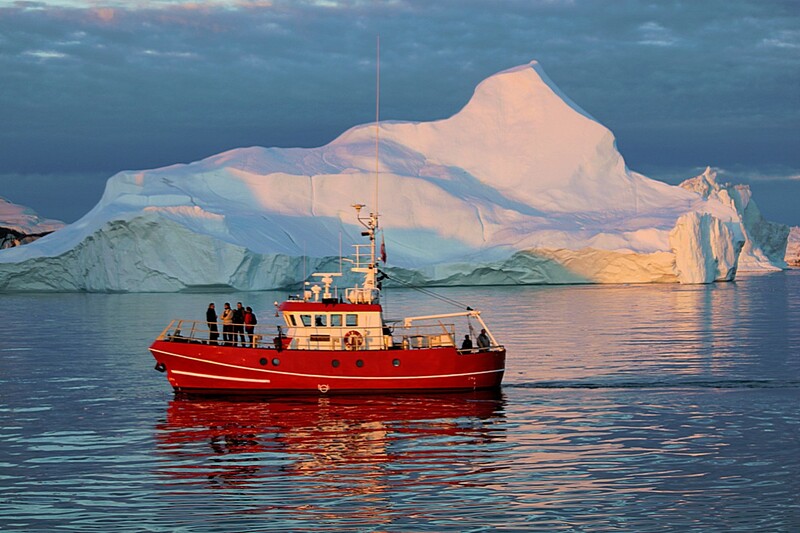 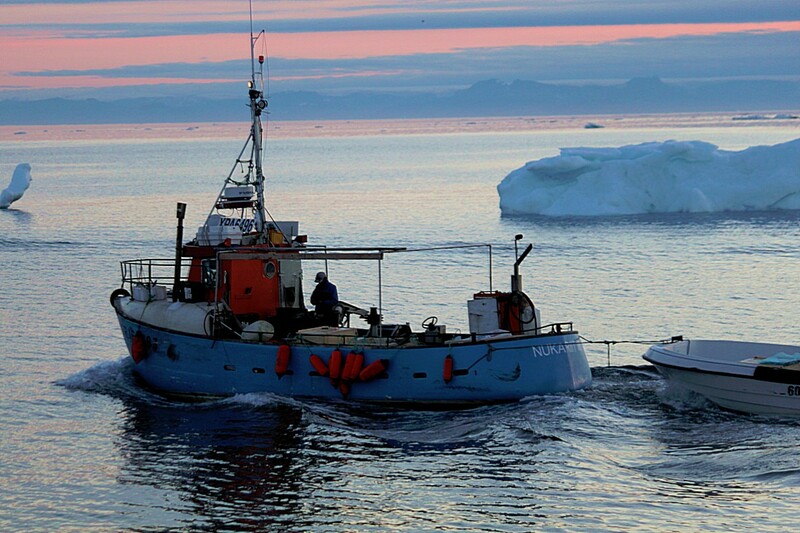 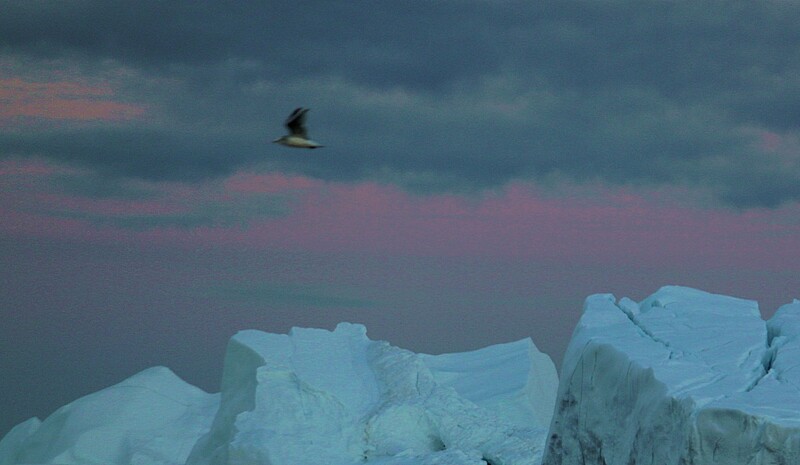 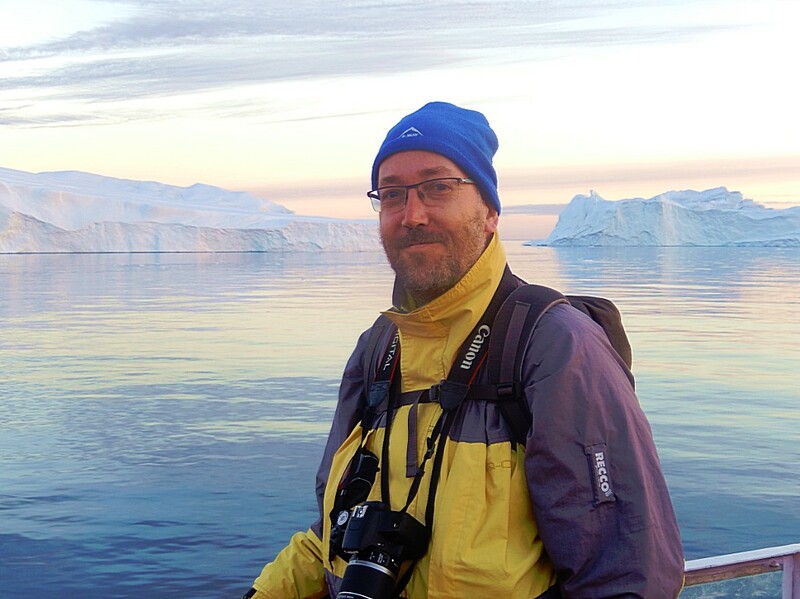 The tour I had enlisted on was an evening/midnight sailing among the icebergs. 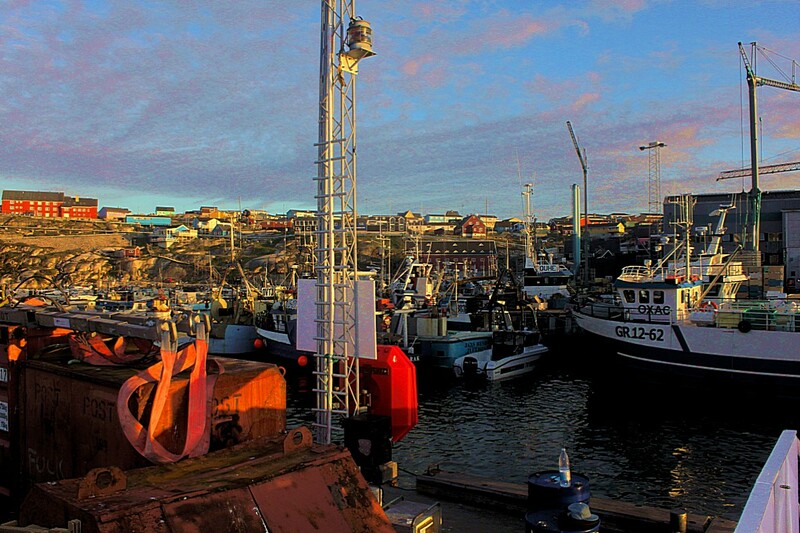 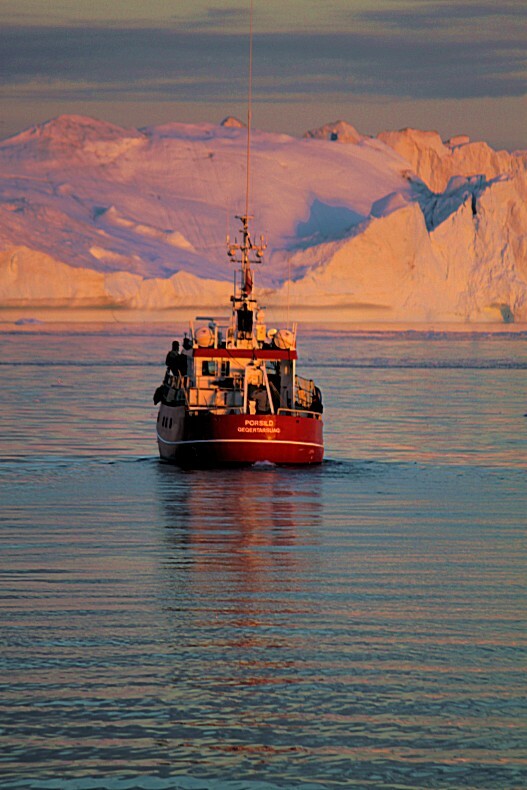 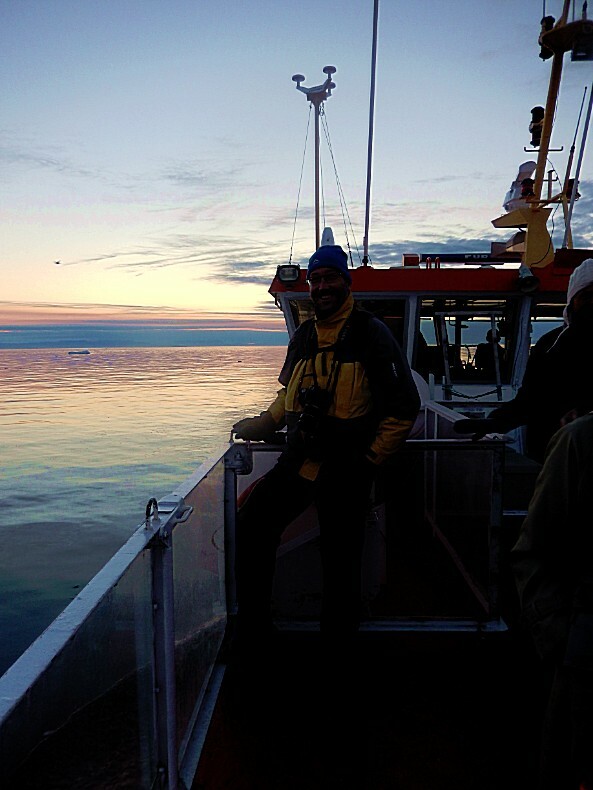 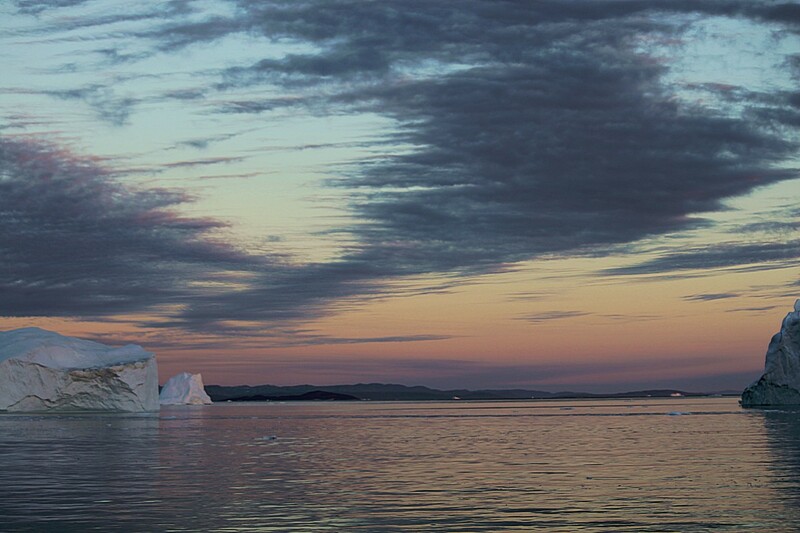 The actual midnight sun in Ilulissat lasts from May 21st to July 24th, so I was a little late for that (I took this trip on August 1st), but having said that, I can assure you that it doesn’t really matter. 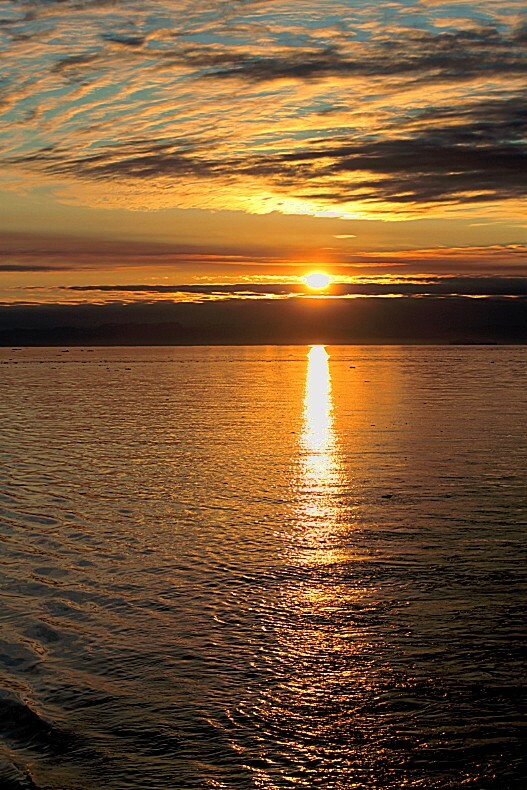 It might even be better that the sun is really setting, because it only sets a little bit and sky stays filled with twilight and never grows dark. 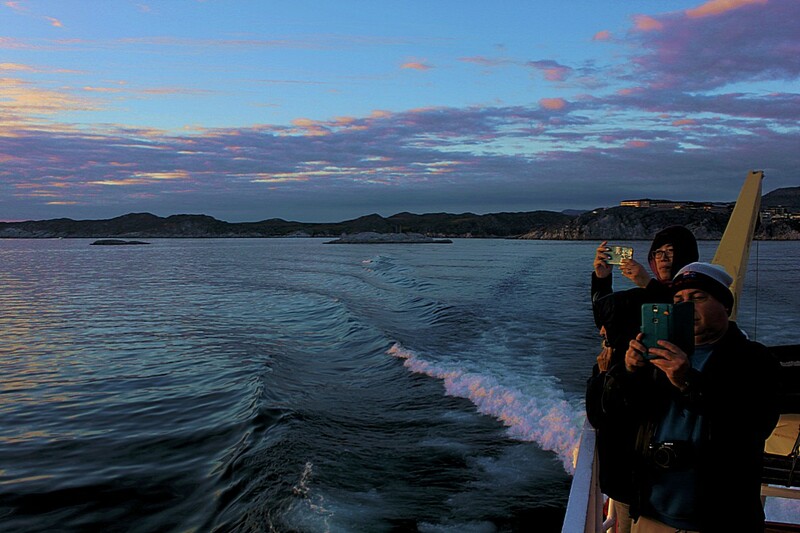 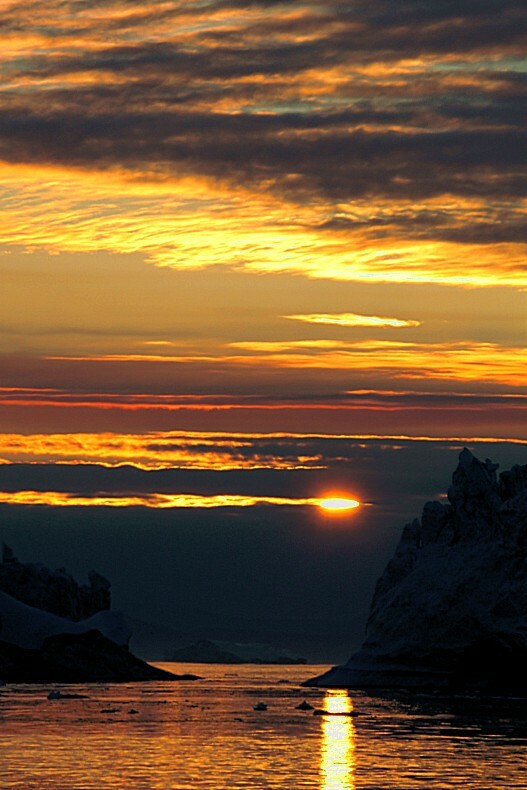 So it adds an experience that you won’t have when the sun doesn’t set at all. 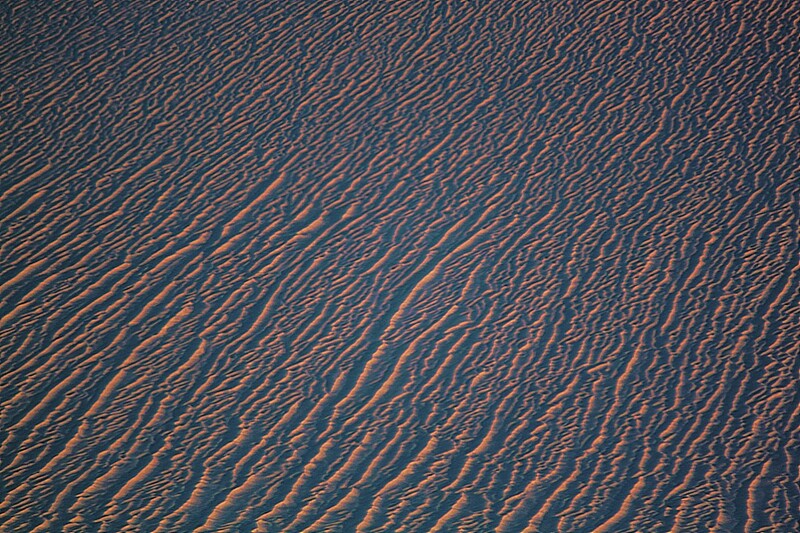 I mean, as a photographer I love to experience as much as possible the variations in light and with a setting sun, there is more variation. 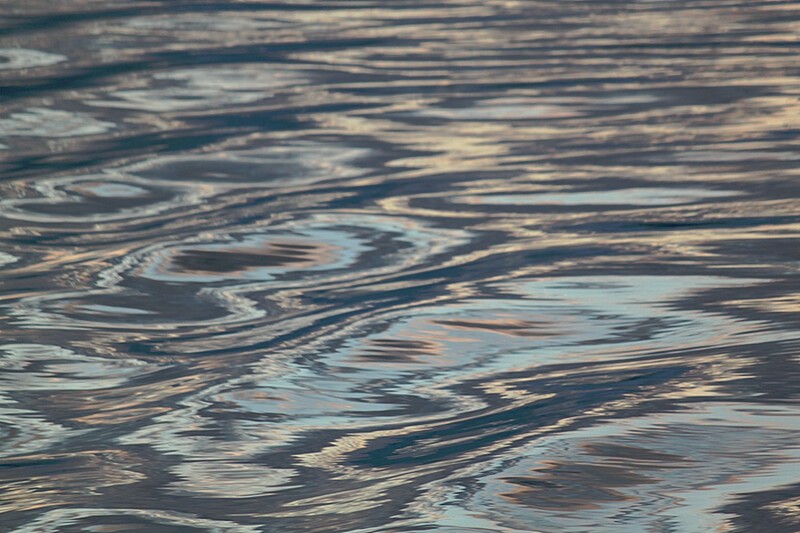 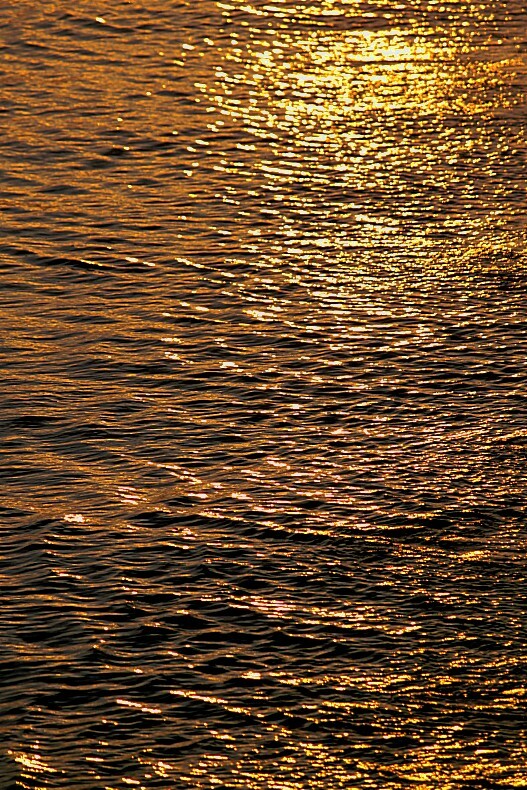 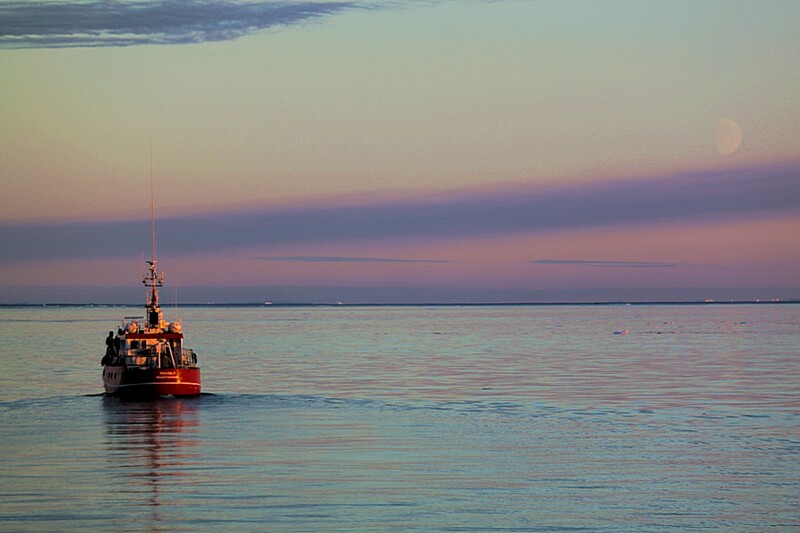 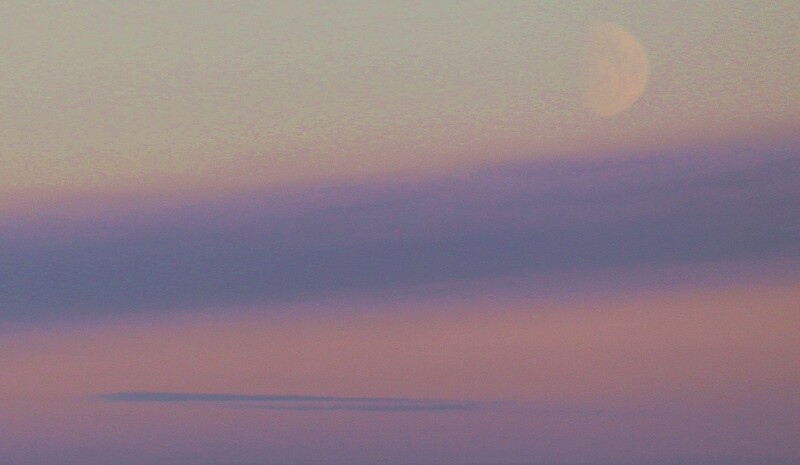 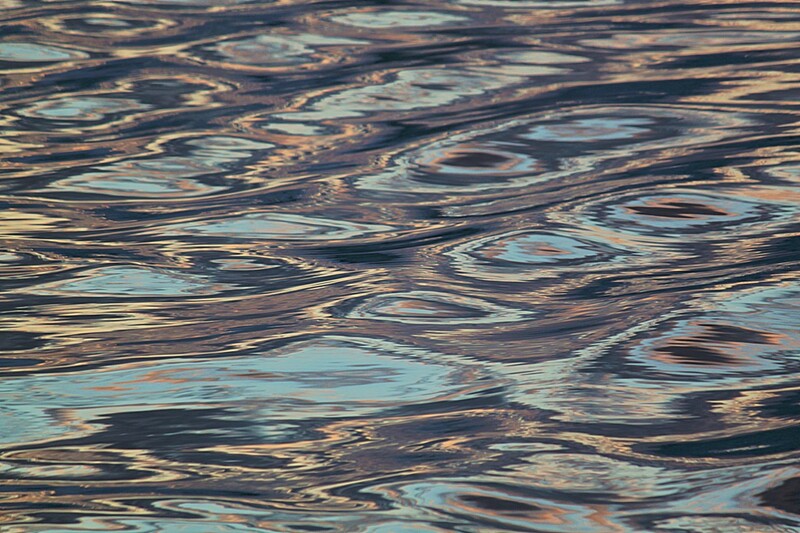 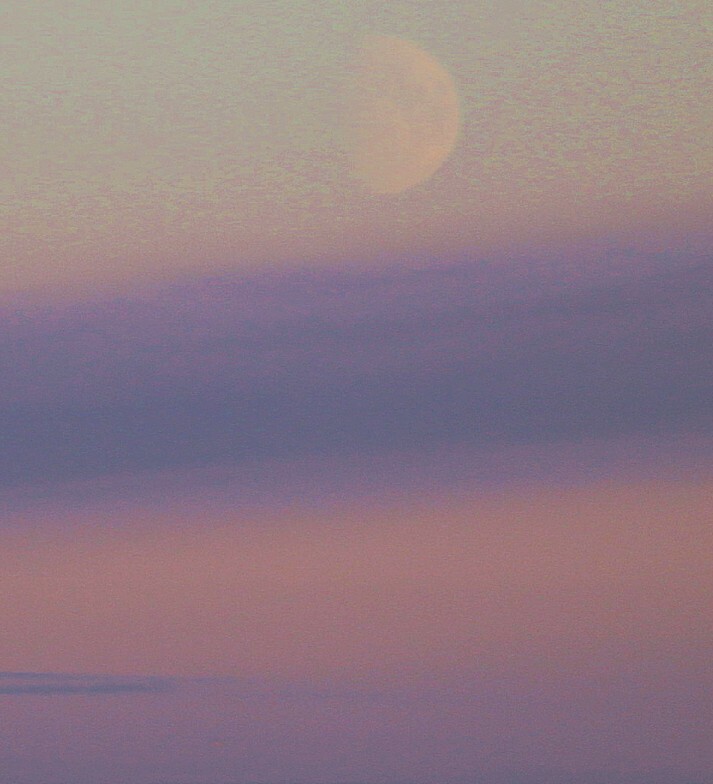 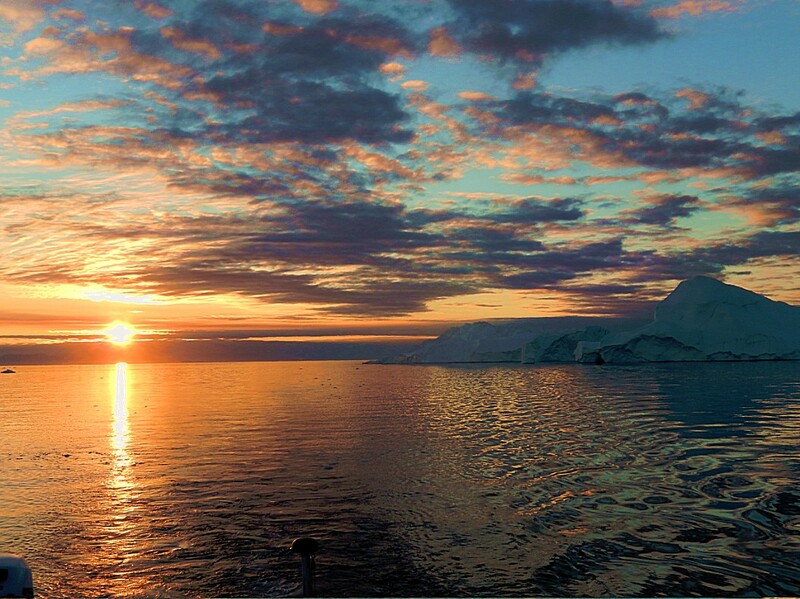 Sailing during the night with the sun still shining is a fantastic and unusual experience. 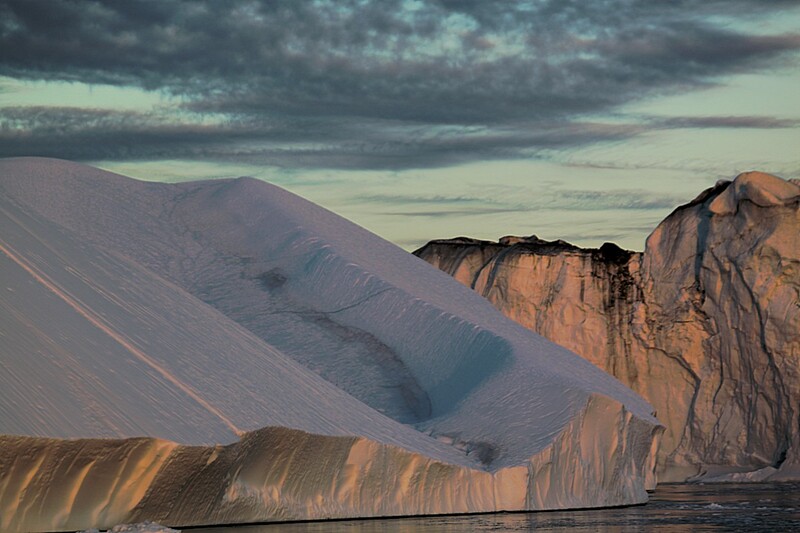 Every day 40.000.000 (yes, 40 million) ton of ice flow out into the fjord. 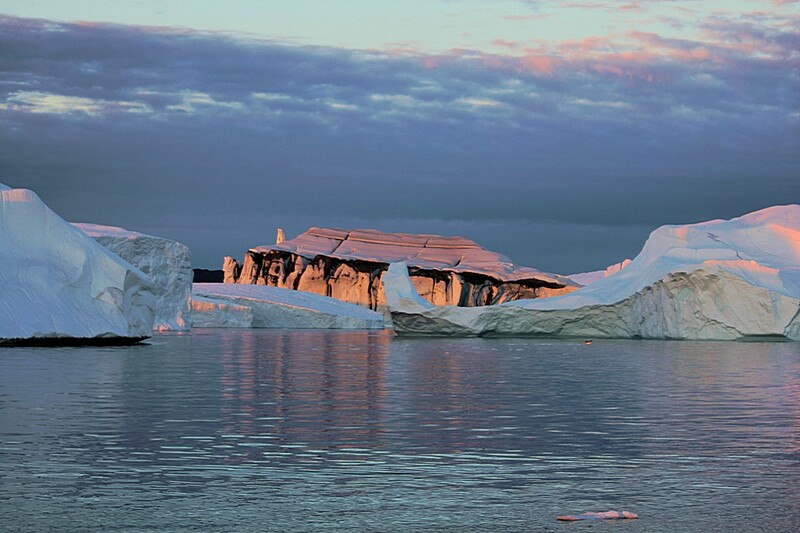 The floating icebergs are gigantic, sometimes measuring more than 100 metres wide and long – and with a height of more than 100 metres above the water surface as well…. 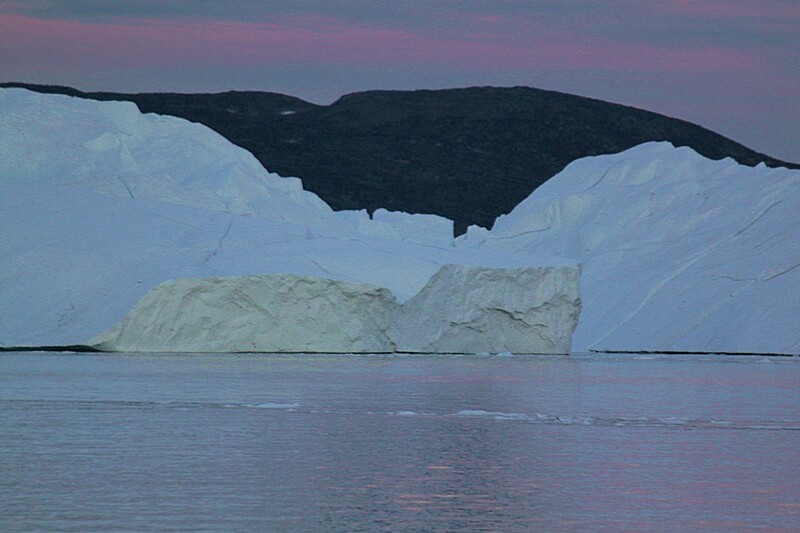 1st you need to know that icebergs are actually pieces of inland ice. 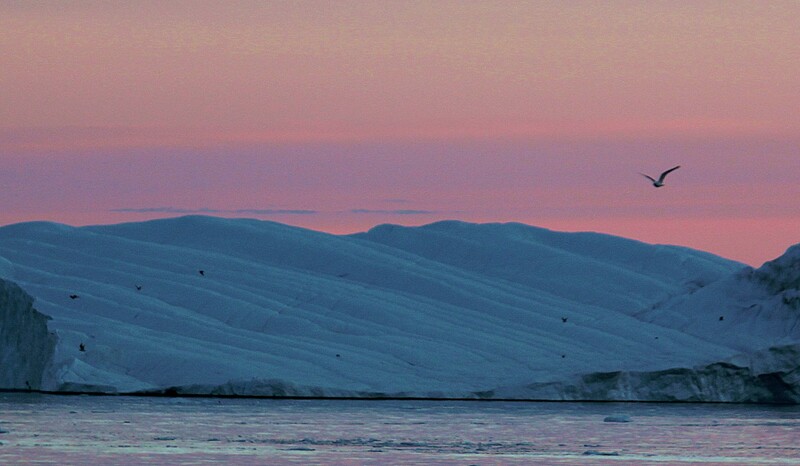 On our planet there are two large inland ice areas. 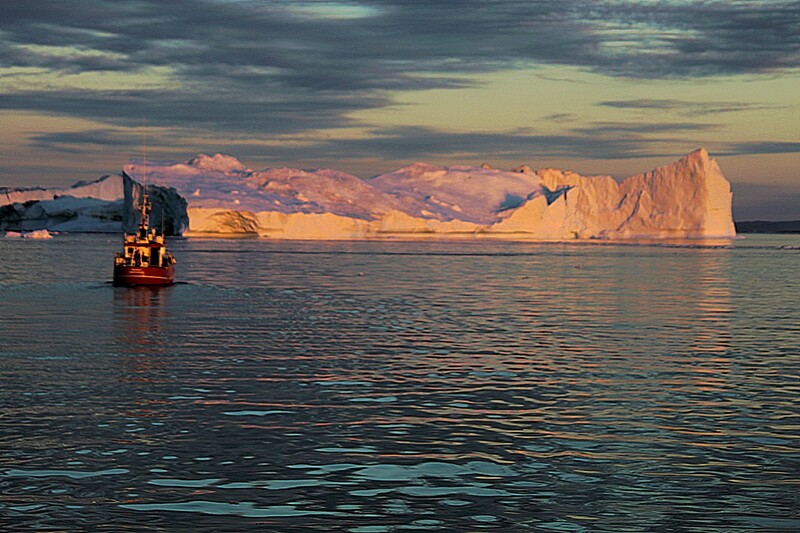 Latrgest is the surface of Antarctica, 2nd largest is the surface of Greenland. 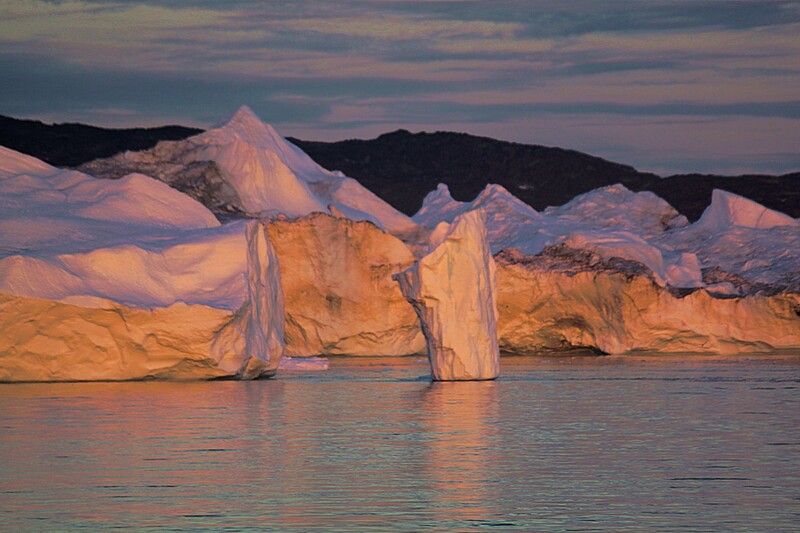 There are some smaller areas too where smaller icebergs are born, like the pieces breaking from the glaciers in Iceland. 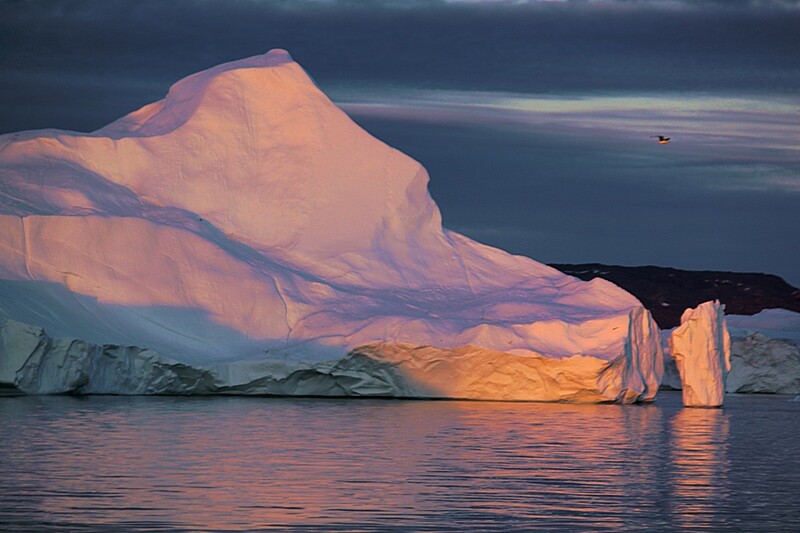 The icebergs in Greenland are the largest on the northern hemisphere due to the icecap being between 3 and 4 kilometers thick…. 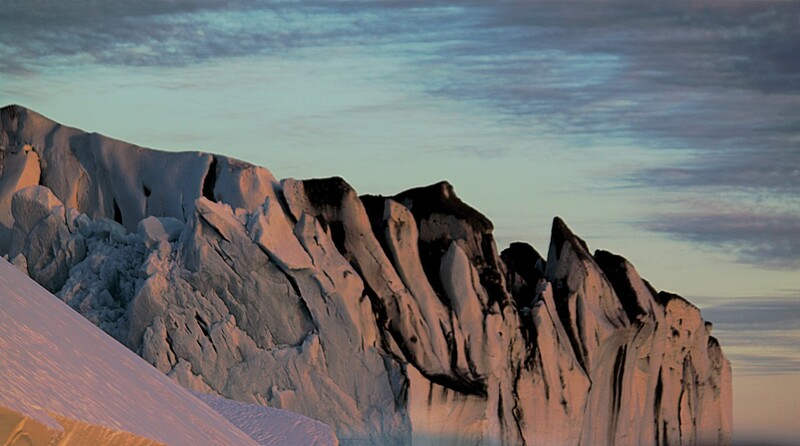 Actually the inland ice consists of multiple layers of snow which have been compressed by new layers of snow on top over a period of several thousands of years. 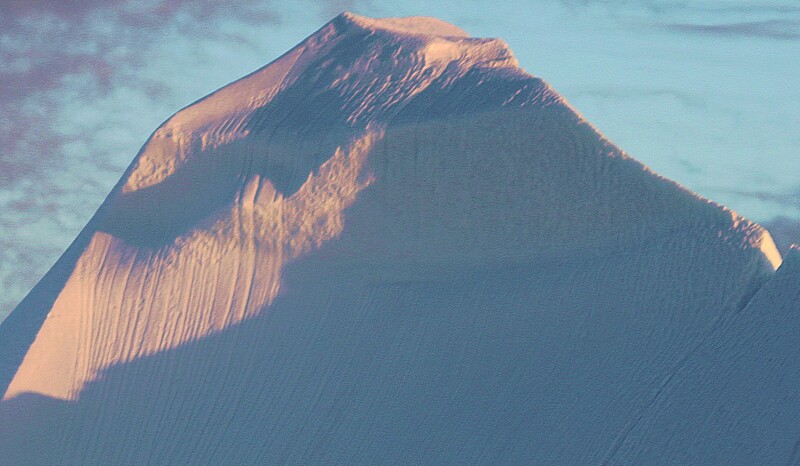 The lowest layers of snow get compressed into ice. 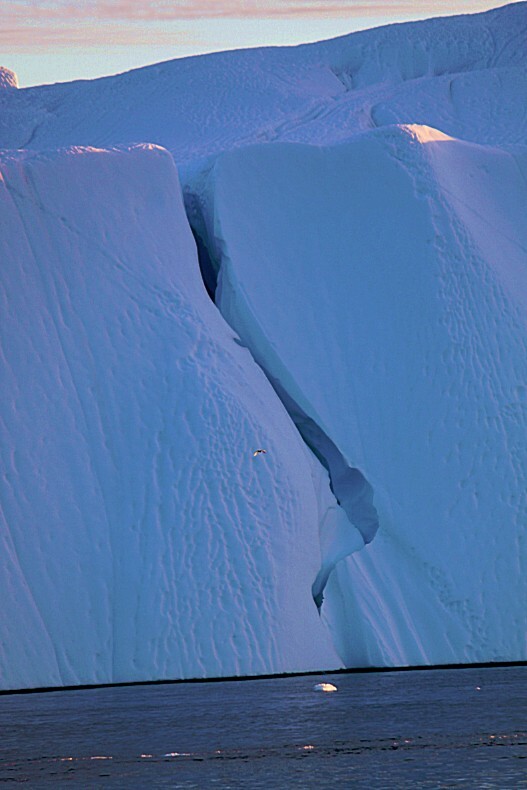 This causes the air being captured in tiny pockets in the ice. 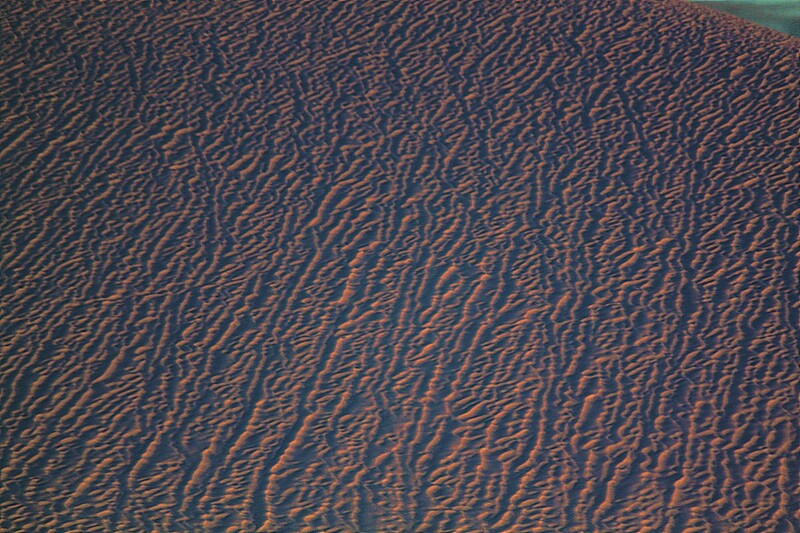 These arir pockets can bare a pressureof 4 to 5 atmosphere. 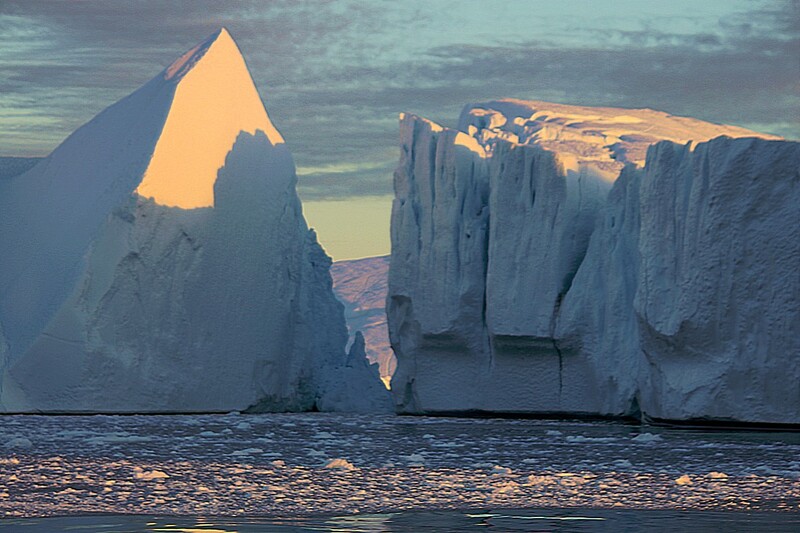 If you would pick a small piece of ice, broken from an iceberg near your ear, or when you put it into your mouth, it will sparkle like carbon oxide in a glass of coke, because the encapsulated air is freed because of the warm temperature of the air or sea water, causing the ice to melt. 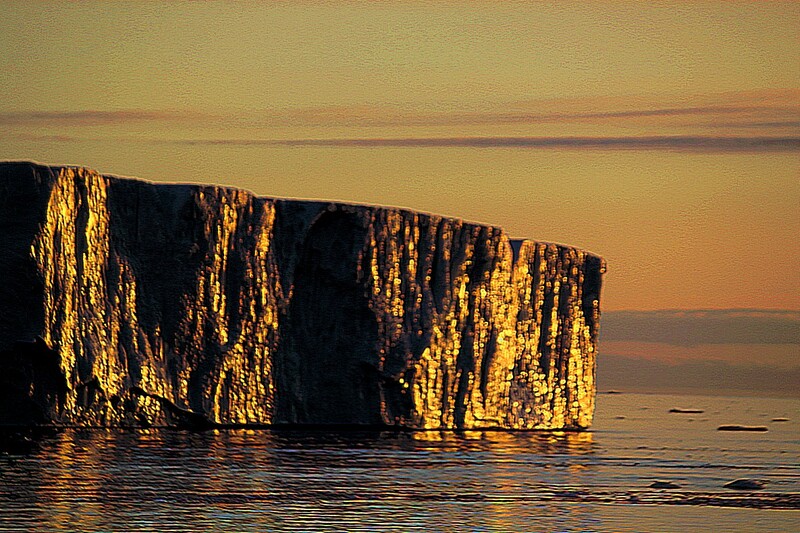 In thory, this ice could be over 200.000 years old. 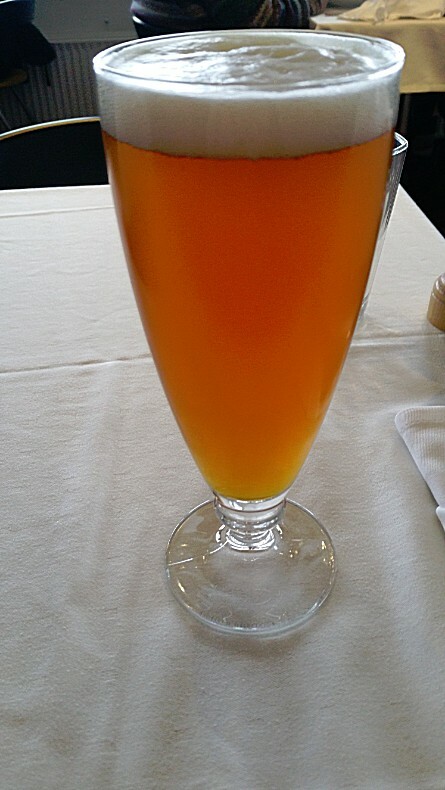 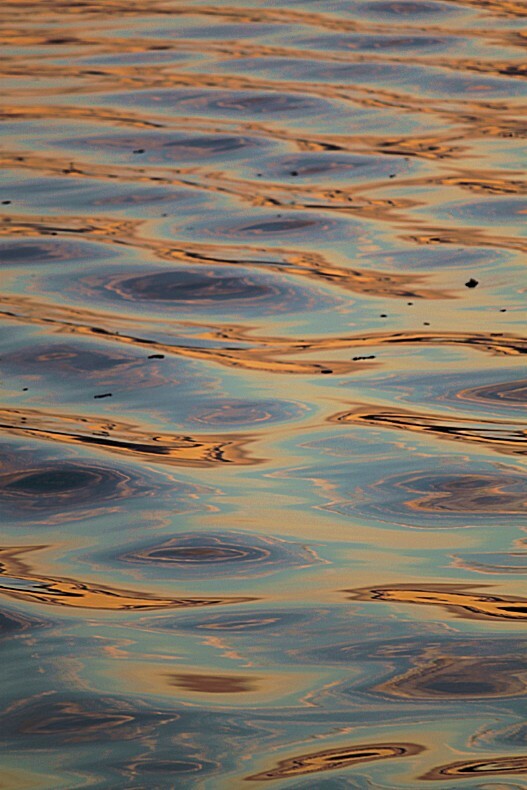 It is used as drinking water (privat and commercial) and it is used in the production process of alcohol. Only 10 to 15% of an iceberg is visible above the water surface. 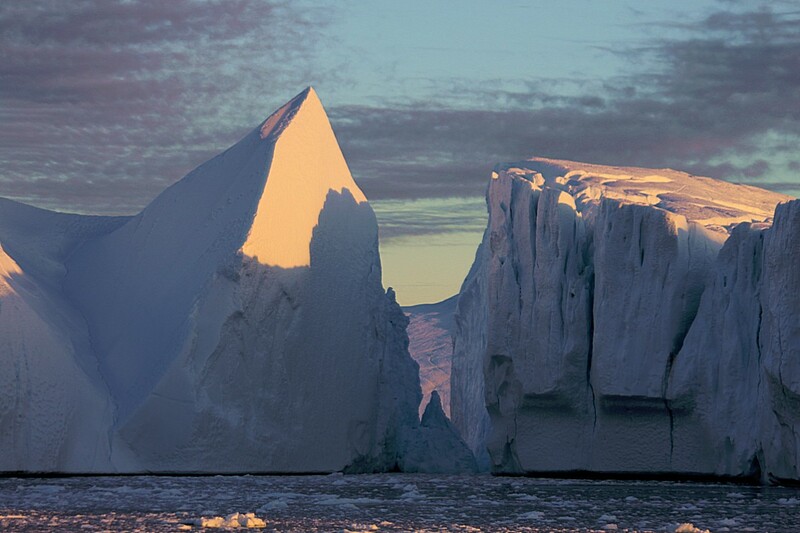 If the water contains more salt, the iceberg will drift higher and show more of its tip. 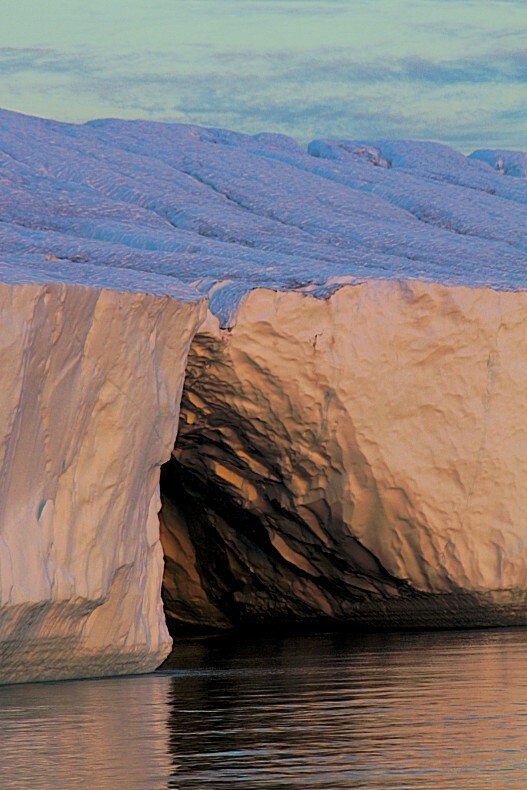 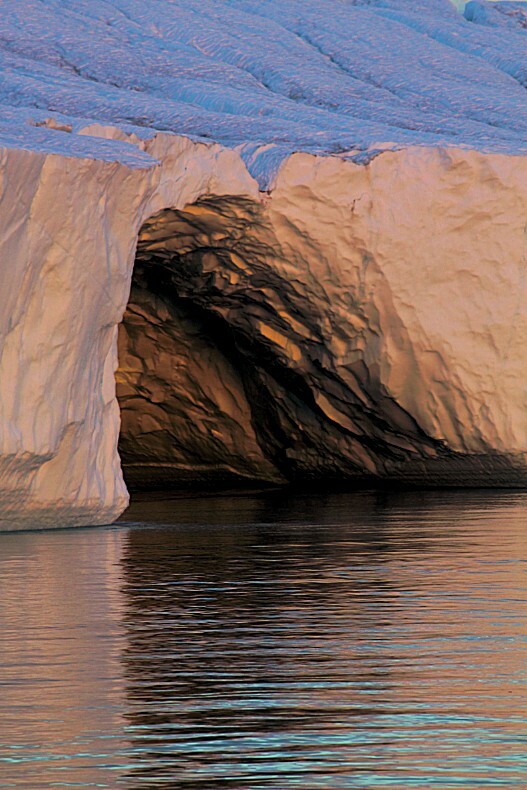 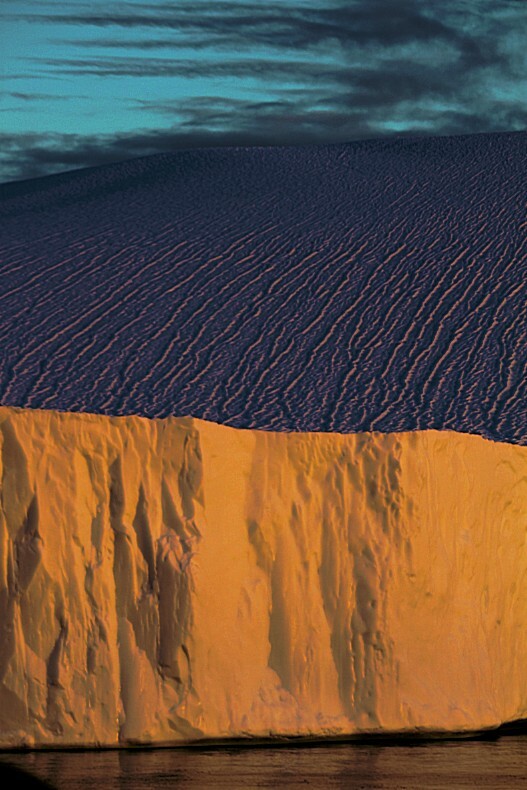 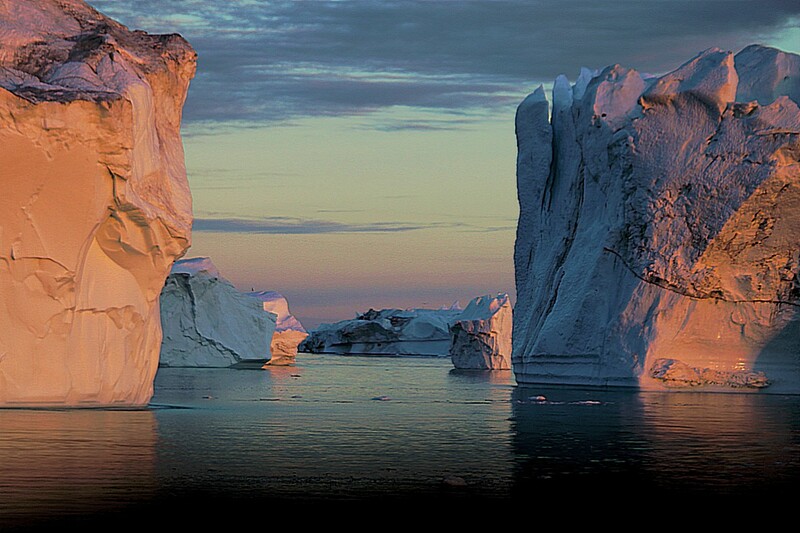 Icebergs containing stones and sand will drift deeper in the water because of a larger density. 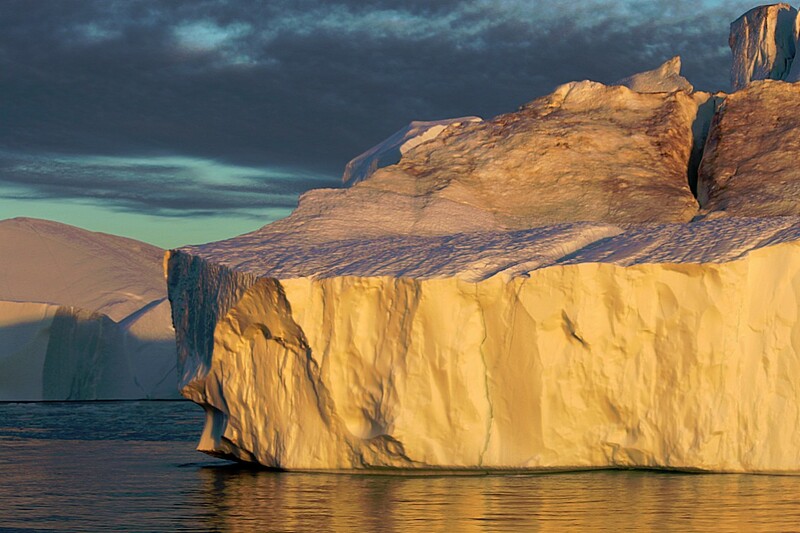 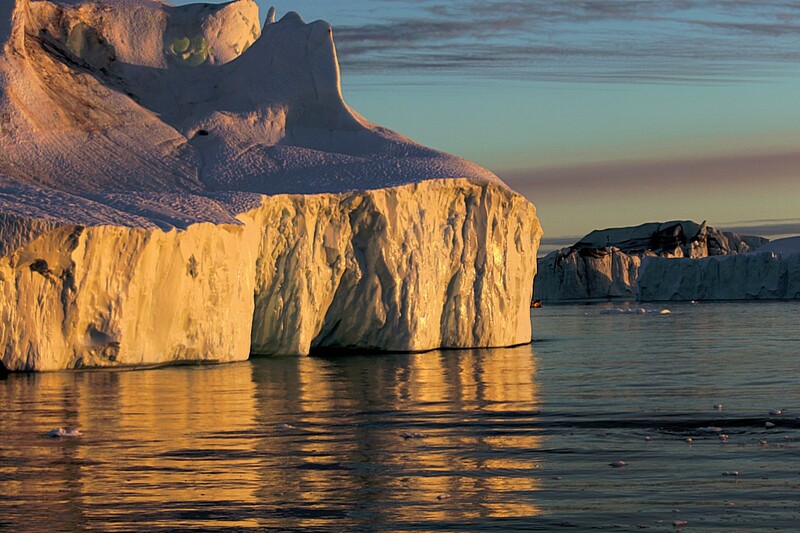 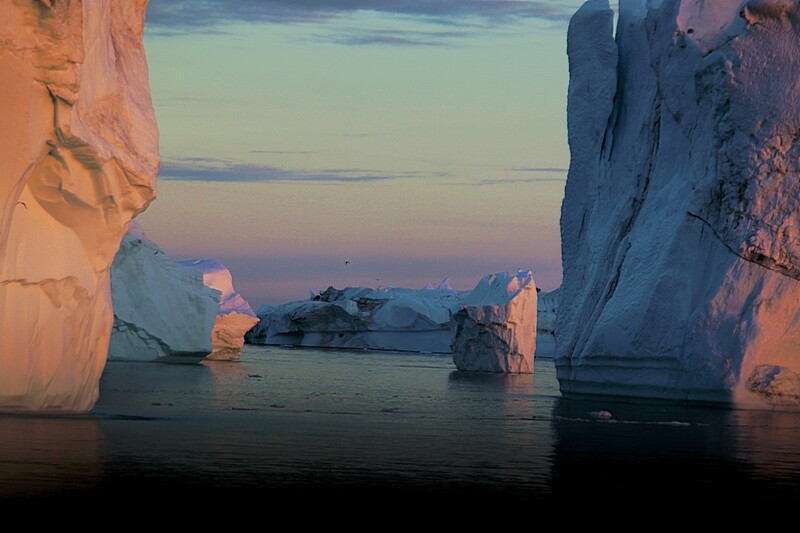 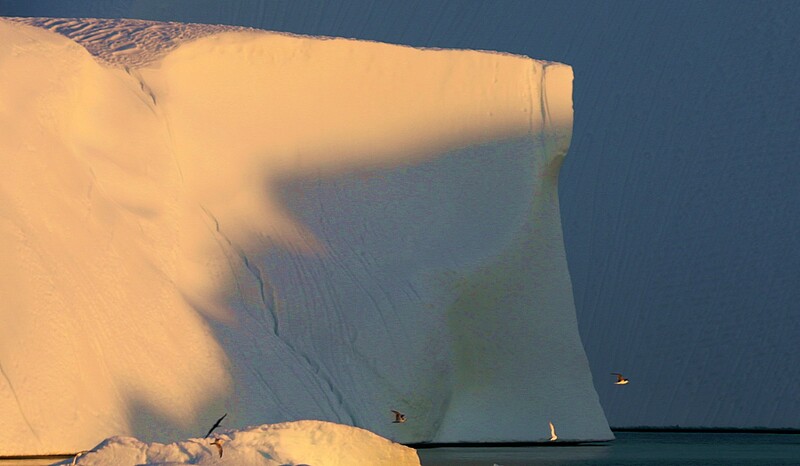 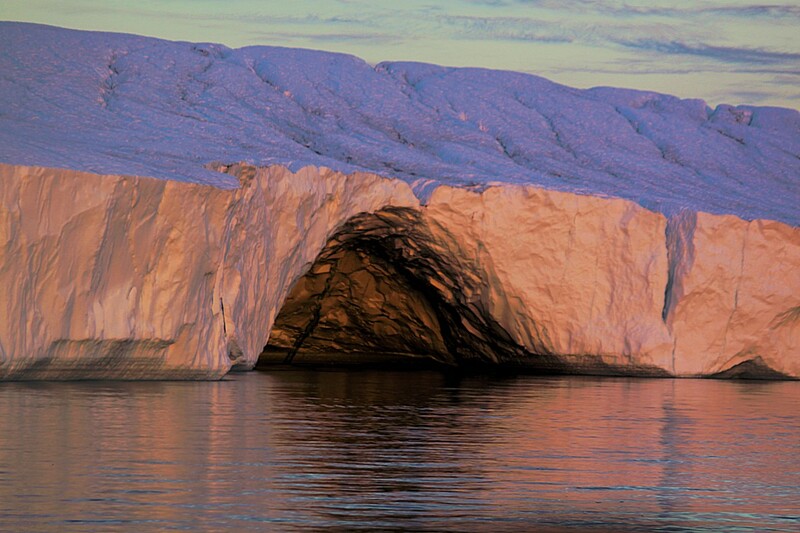 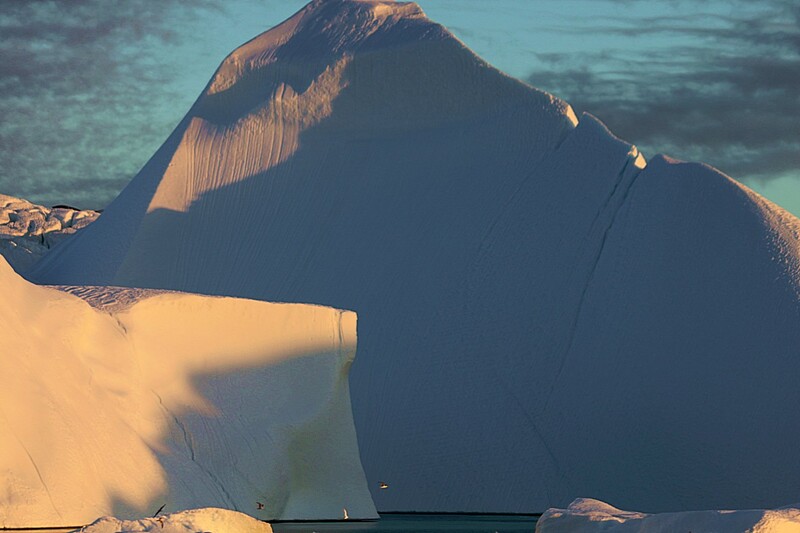 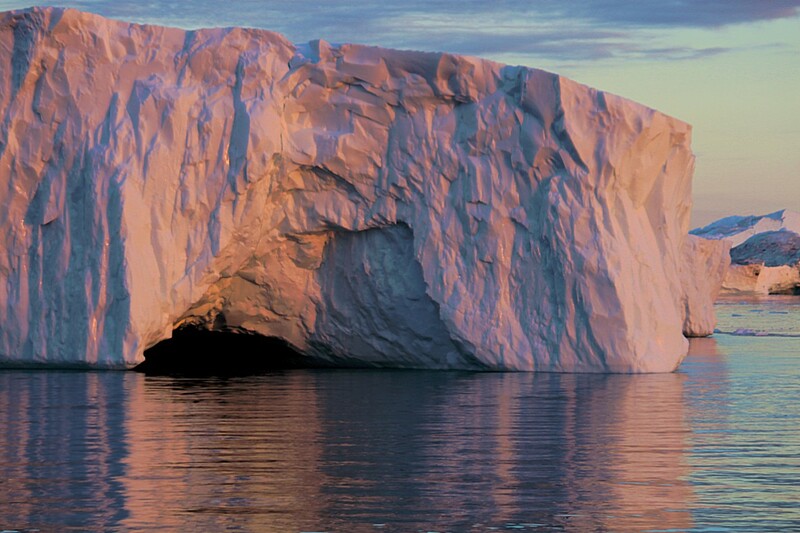 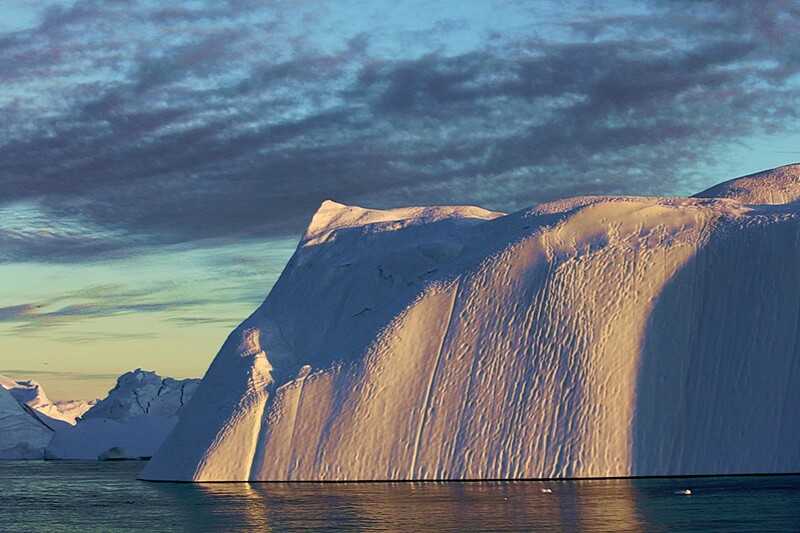 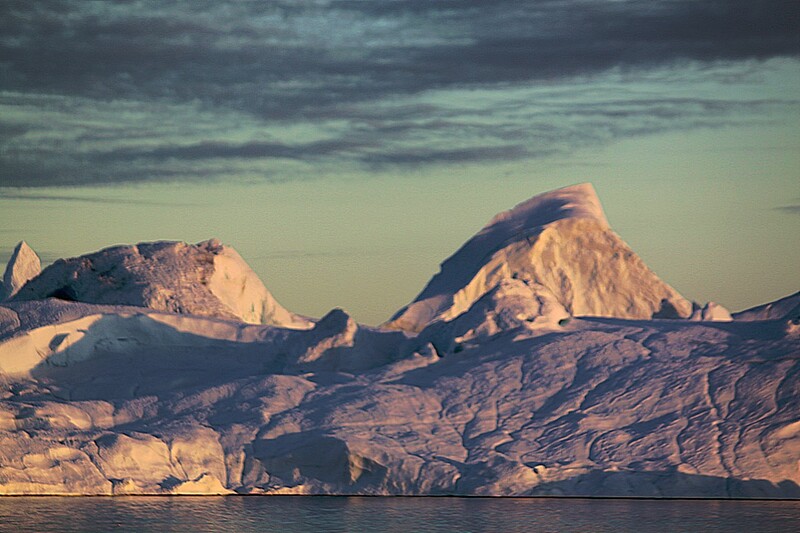 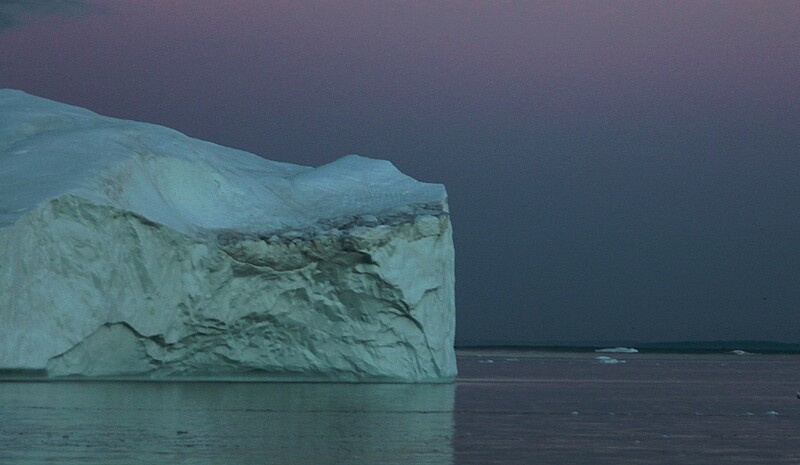 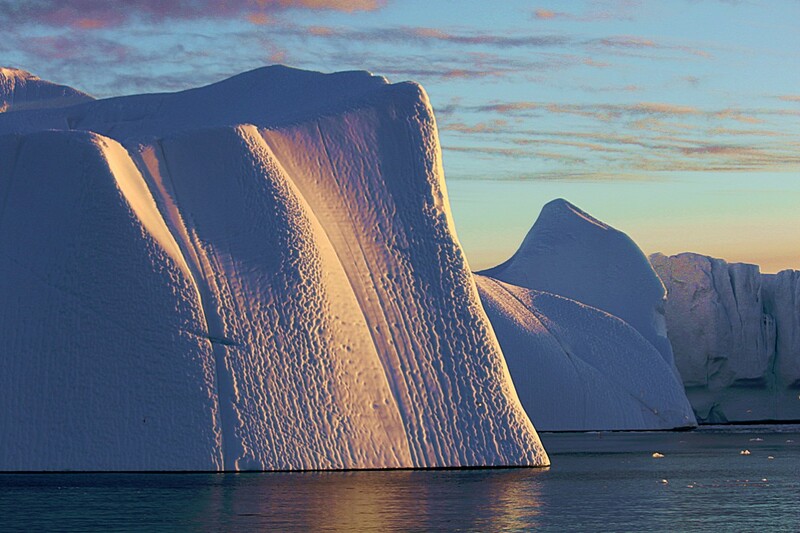 The largest icebergs are over 1.5 km³ large. 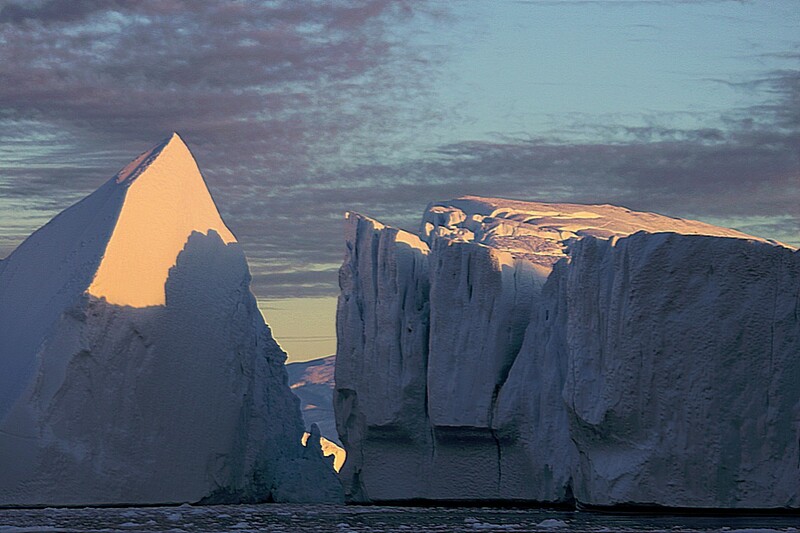 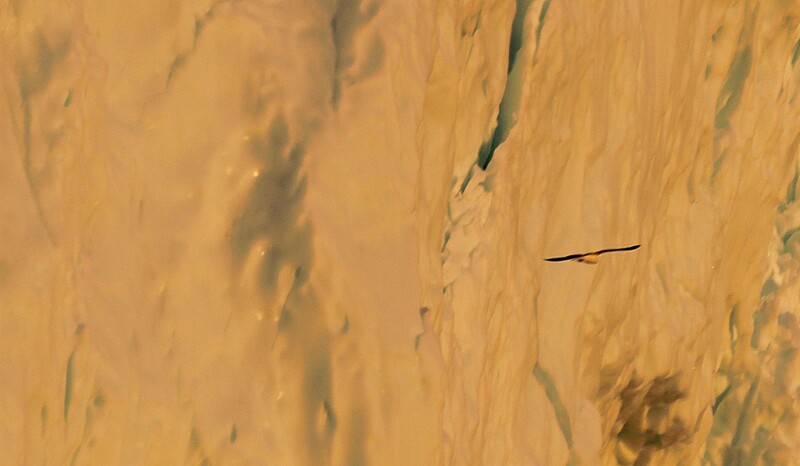 Most icebergs will reach about 50 metres above sea level, which is as high as a 15 floor skyscraper building. 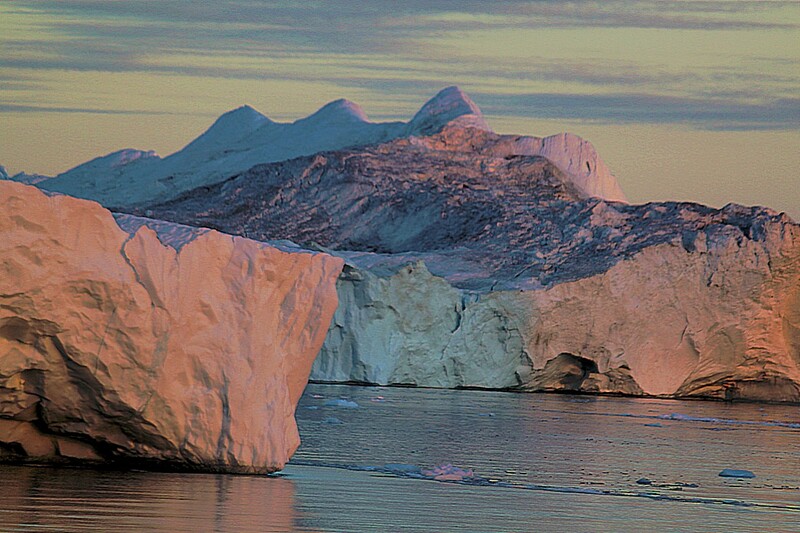 But in the Kangia icefjord you’ll find icebergs up to 150 metres above sea level! 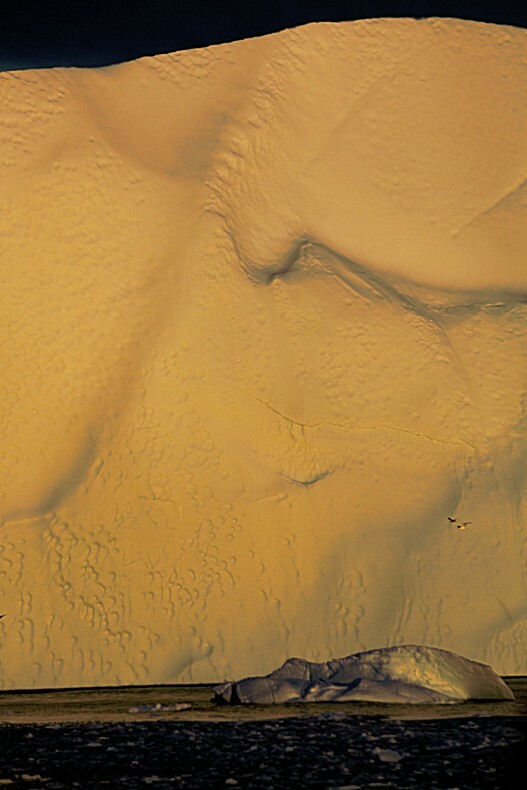 (a 45 floor Skyscraper). 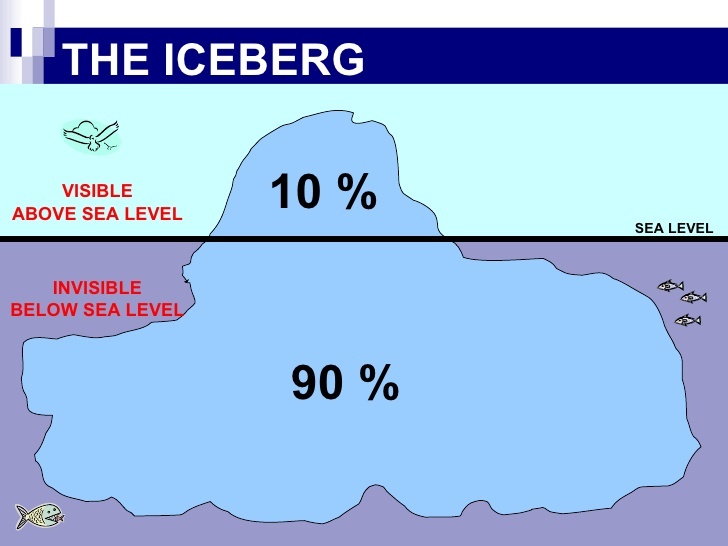 And that’s only the 10% above water level!!! 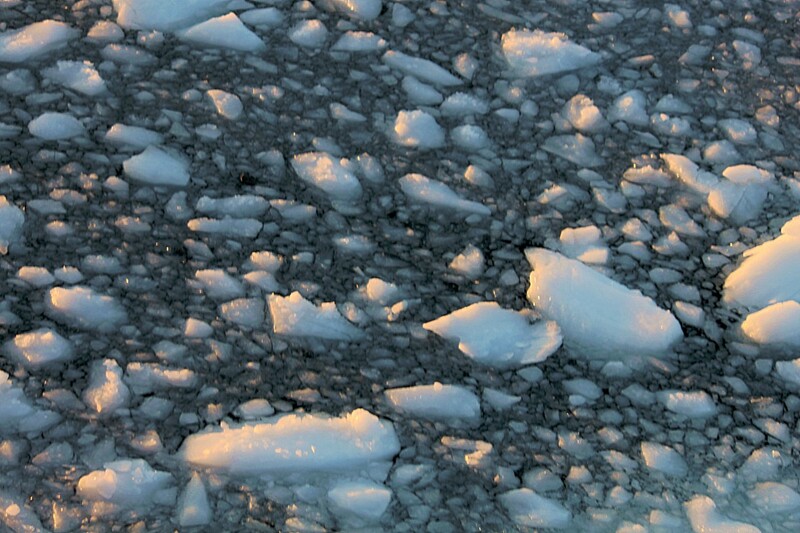 Sea ice, is something completely different. 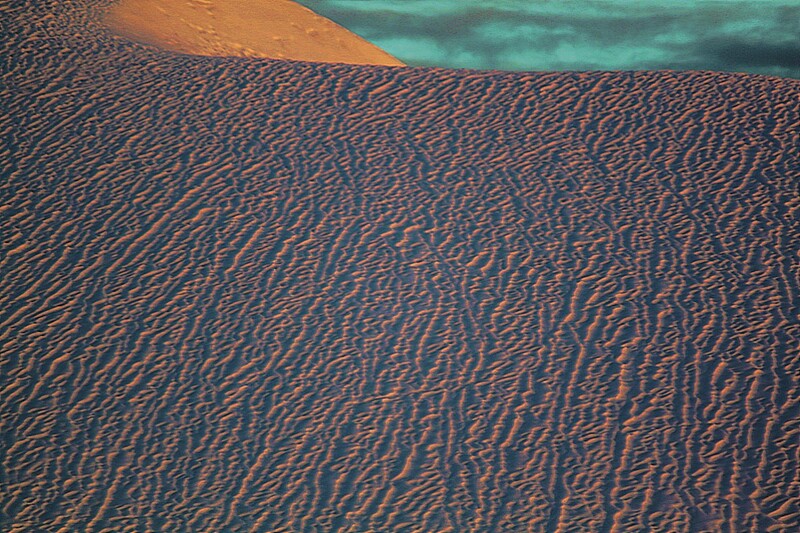 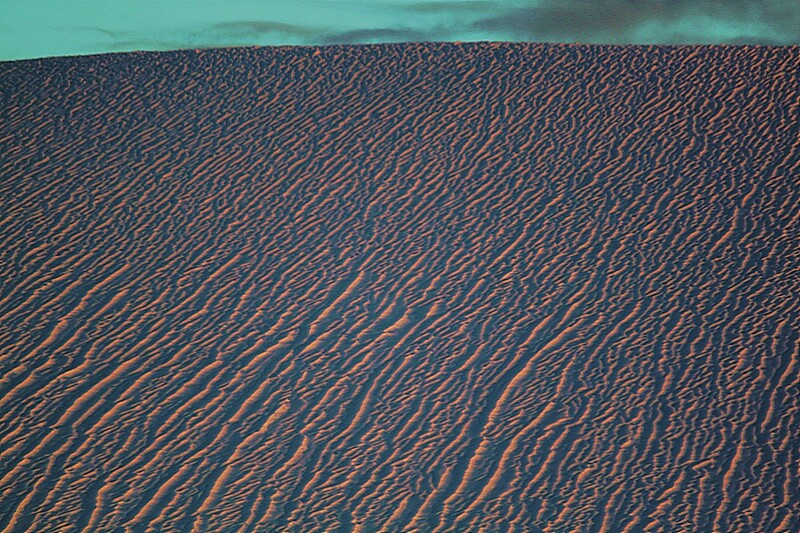 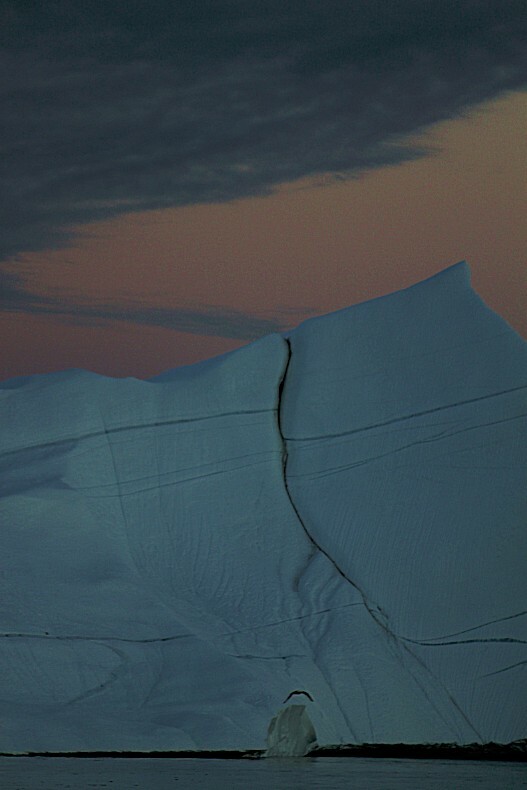 It is frozen sea water, which can get covered by layers of snow. 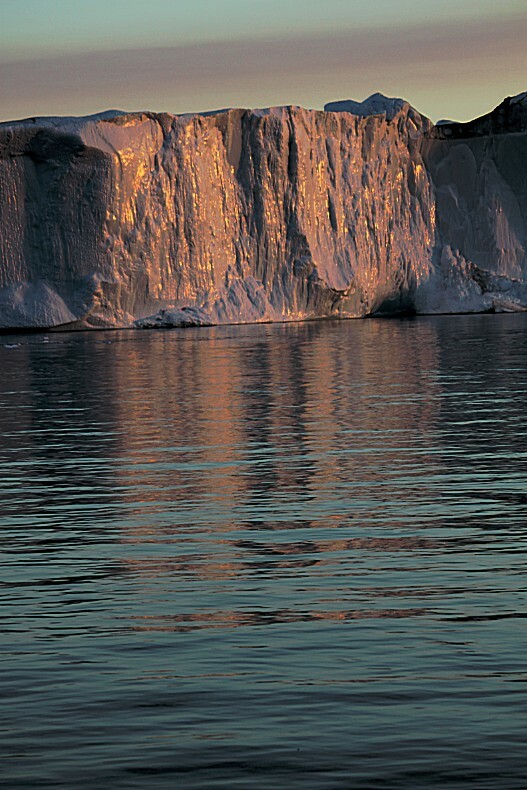 After a piece of ice has calved from a glacier, it falls into the water of the Kangia icefjord and after it spins and wobbles a bit it will find balance and starts to float towards the end of the fjord. 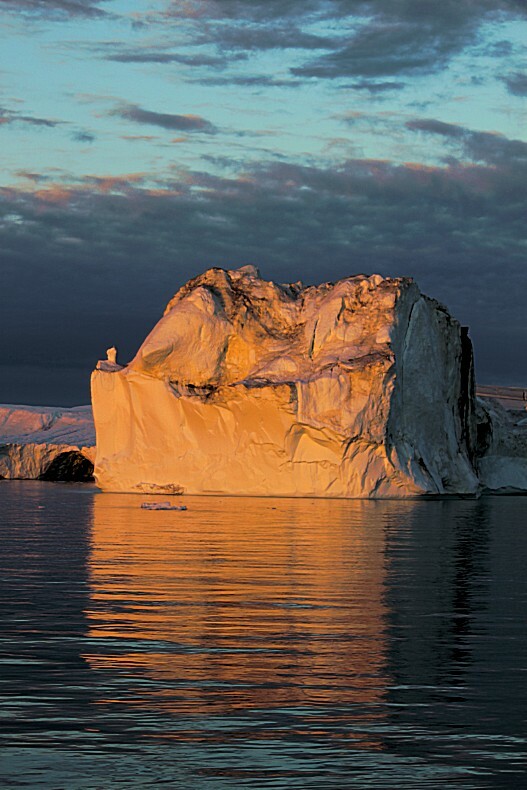 The water in which an iceberg floats however is relatively warm, in winter, but specially in summer and this will cause the iceberg to melt under water and this proceeds until balance is broken and the iceberg will turn over. 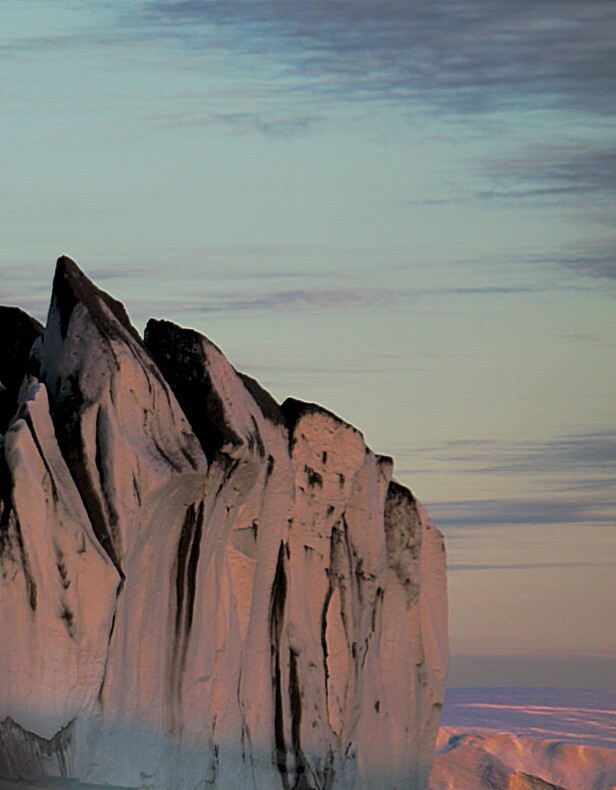 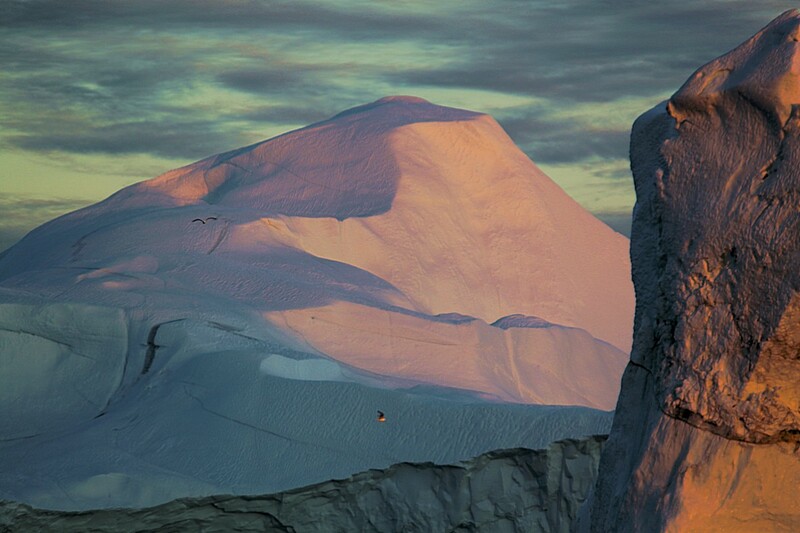 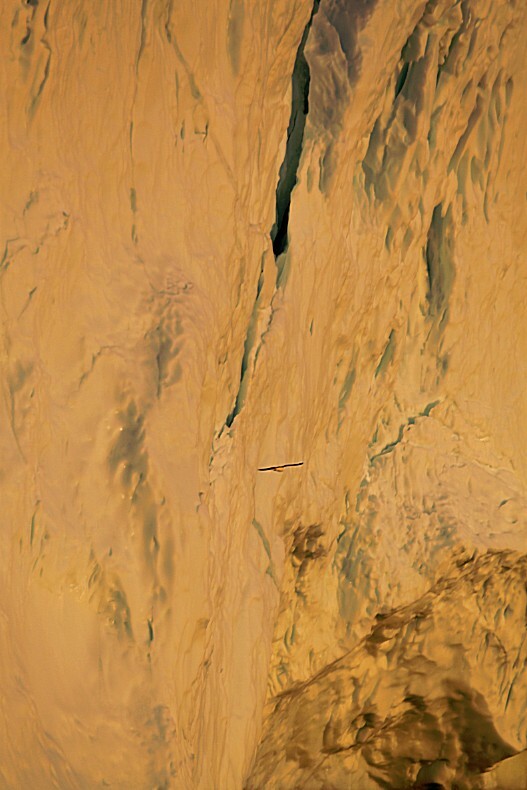 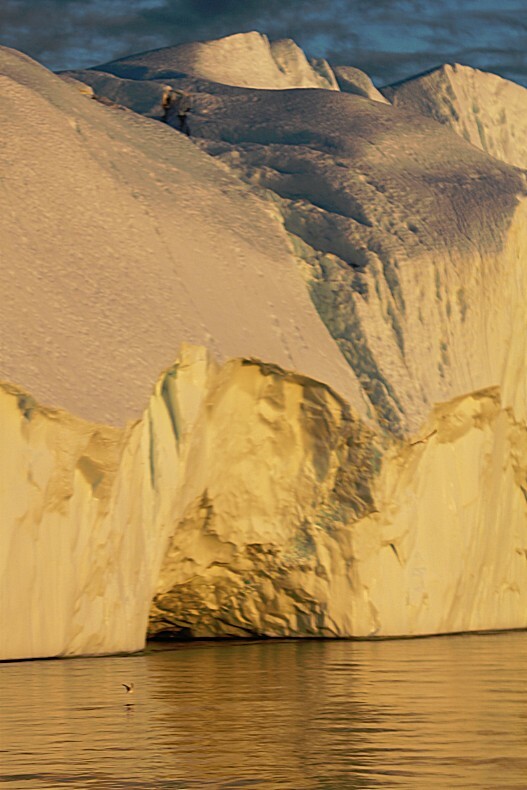 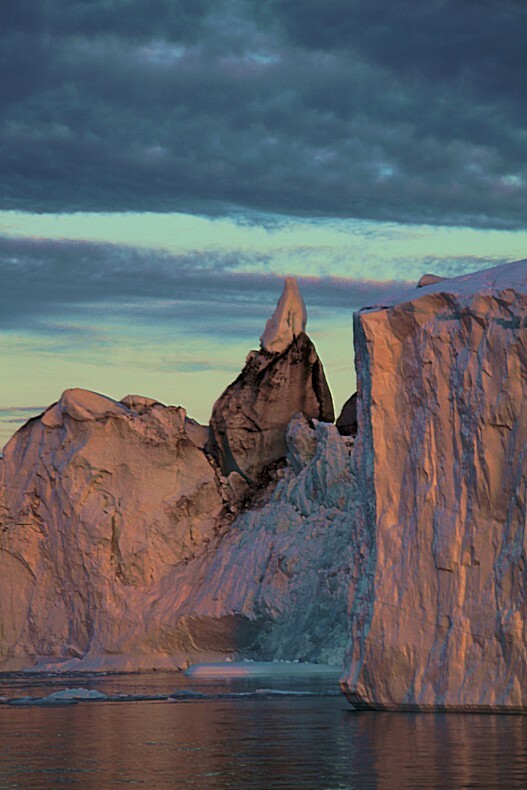 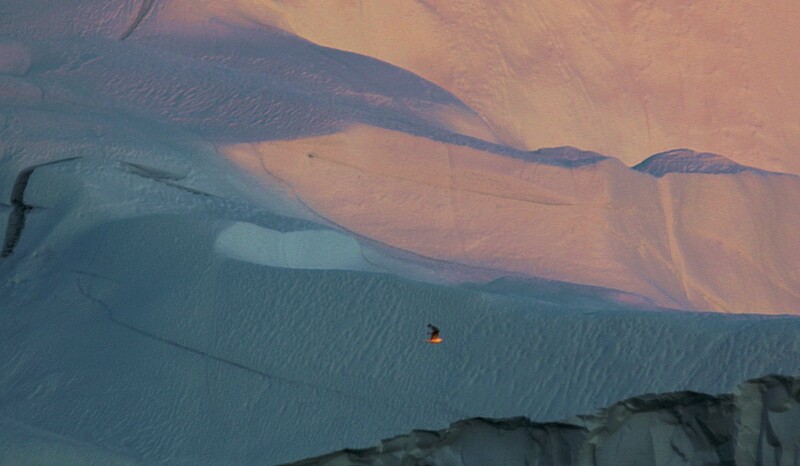 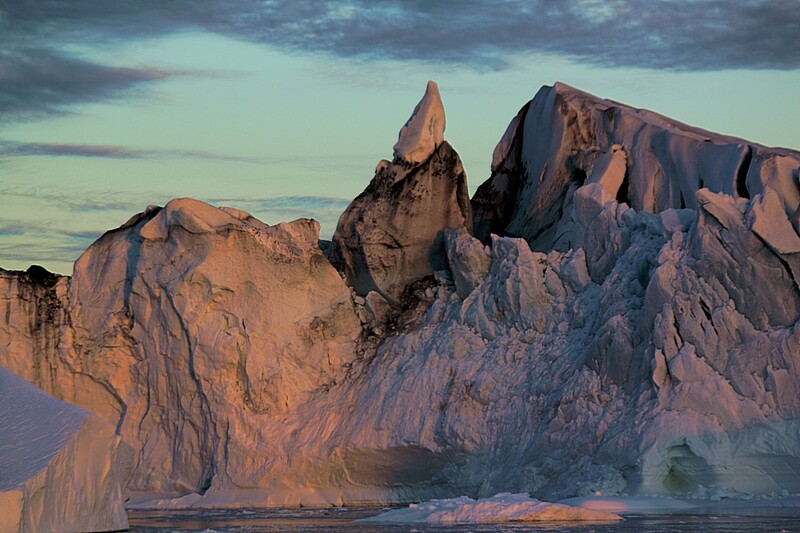 A jagged, craggy looking iceberg is an iceberg which has not turned over yet. 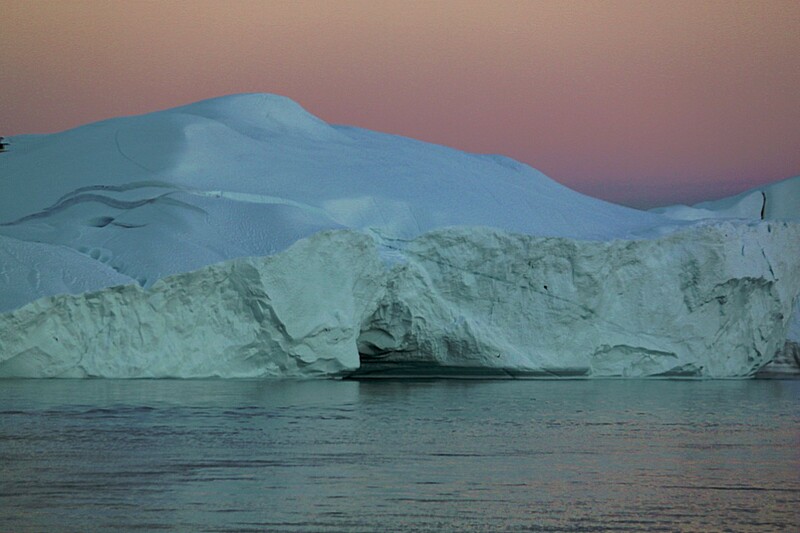 An iceberg which did turn looks smooth on its surface because the sea water currents smoothened its surface. 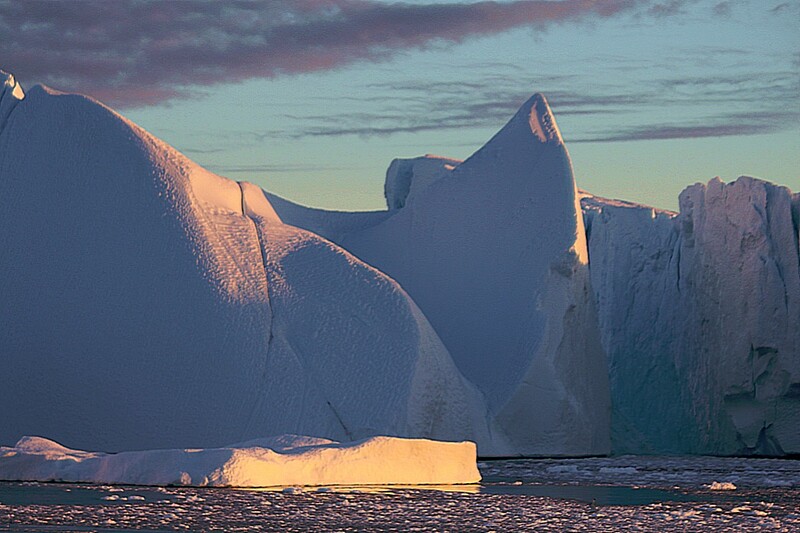 Filthy icebergs originate from the bottom or the edges of the inland ice/glacier and contain stones and sand caught in the ice. 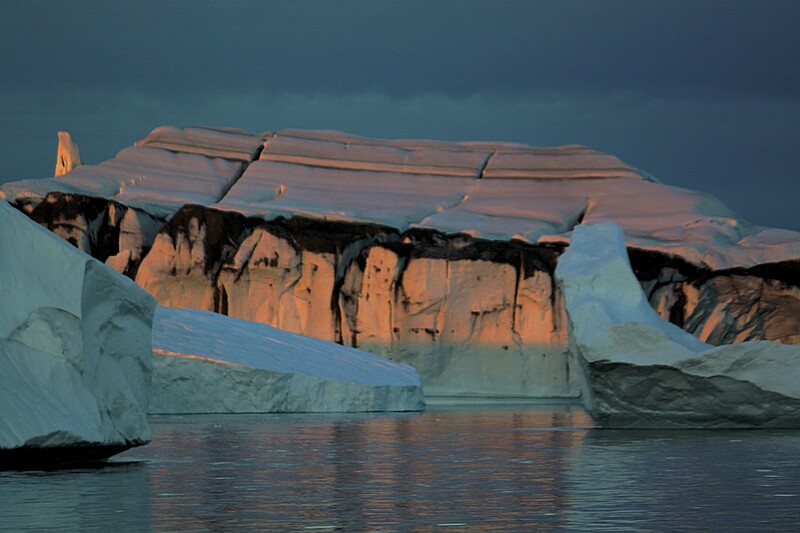 Because of the sea water melting the iceberg, most icebergs look craggy just above the water surface, where ice breaks off. 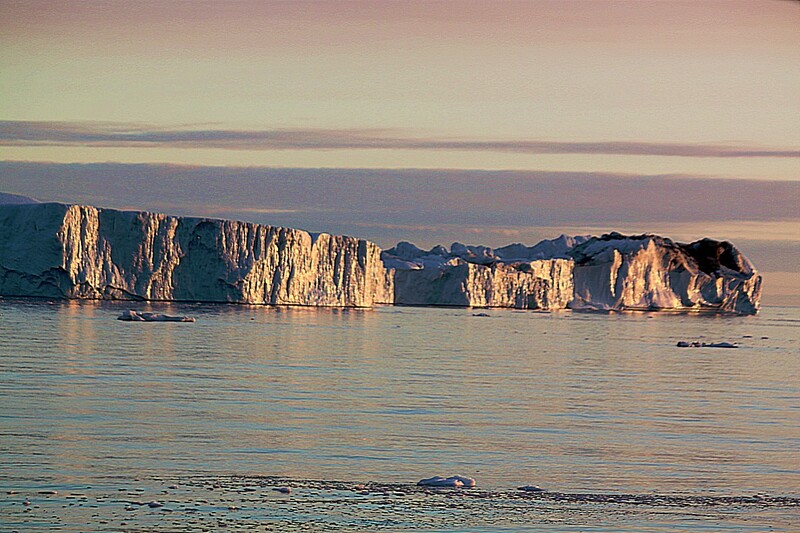 Enjoy these views like I did, purely because of their awesome beauty!!! 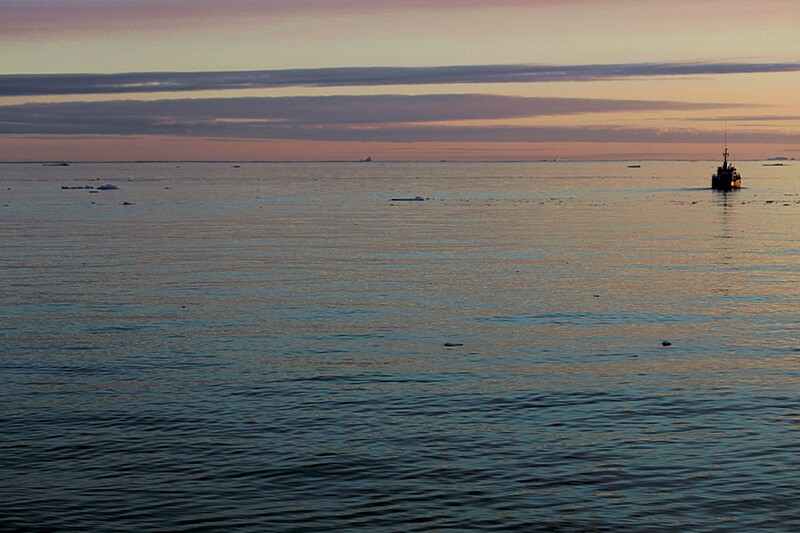 “Let the whole world be as I am. 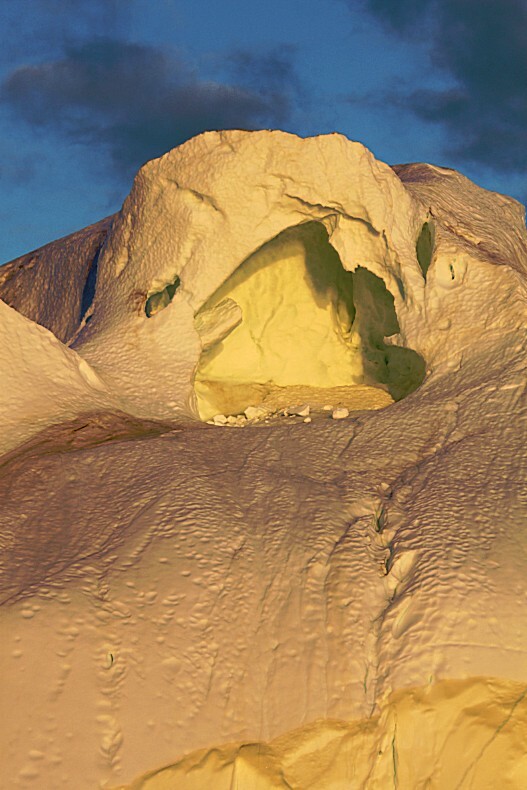 From: The Snow Queen by H.C. Andersen. 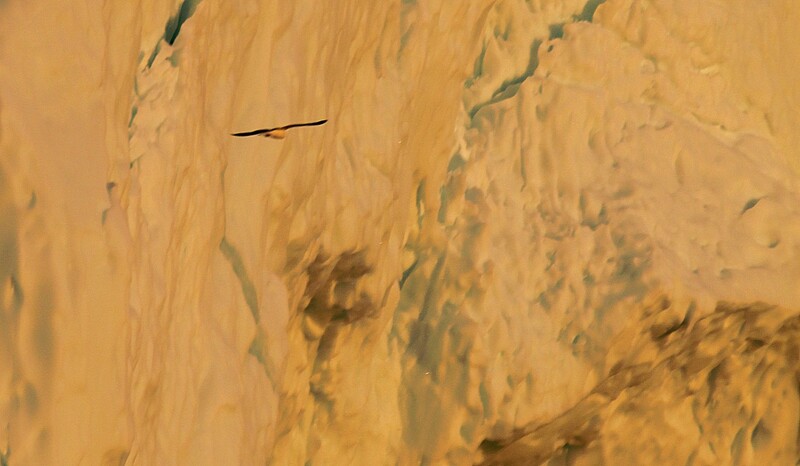 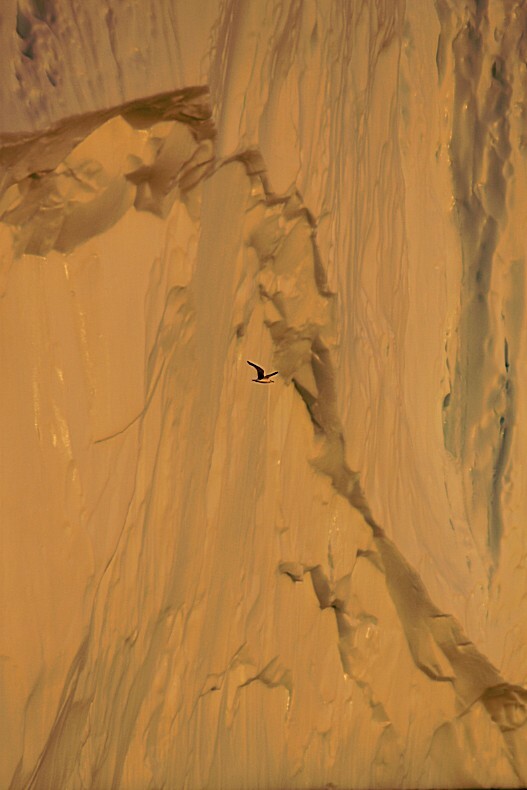 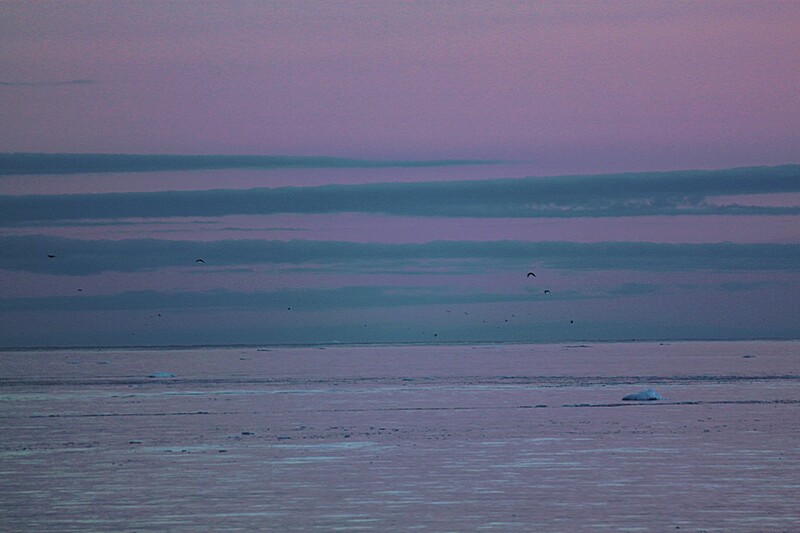 There were lots of seabirds circling the empty icebergs void of any lifeform and still this is not so extraordinary if you know how rich with fish these cold waters are. 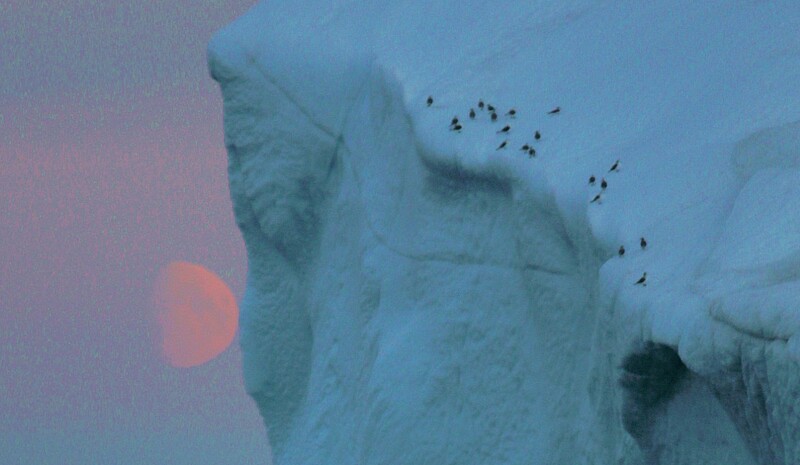 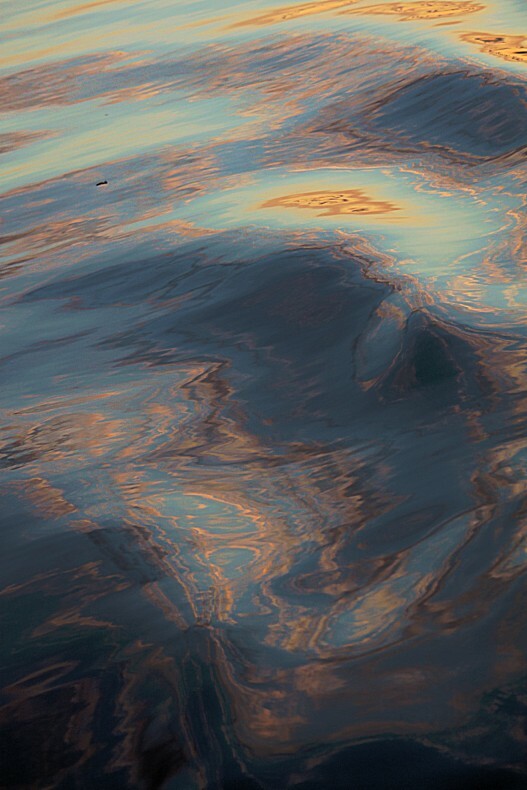 That’s why these large flocks of birds, but also seal colonies and whale families roam these waters. 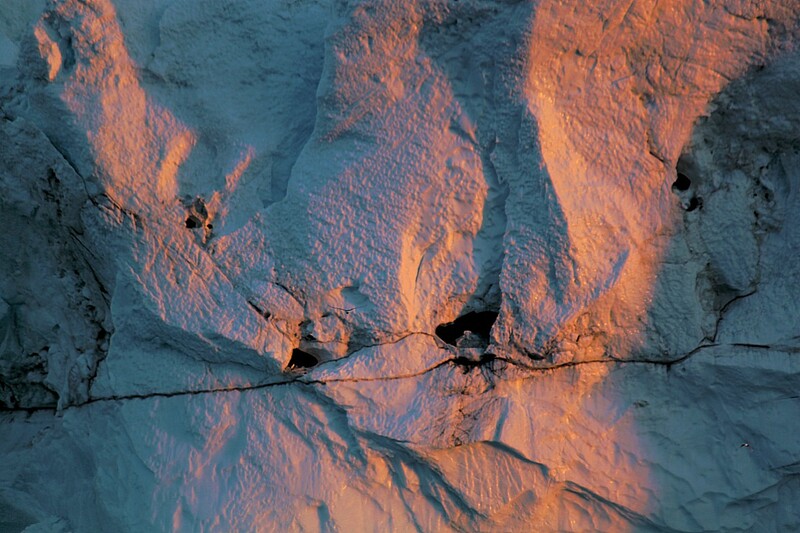 The food chain is very abundantly filled in these areas. 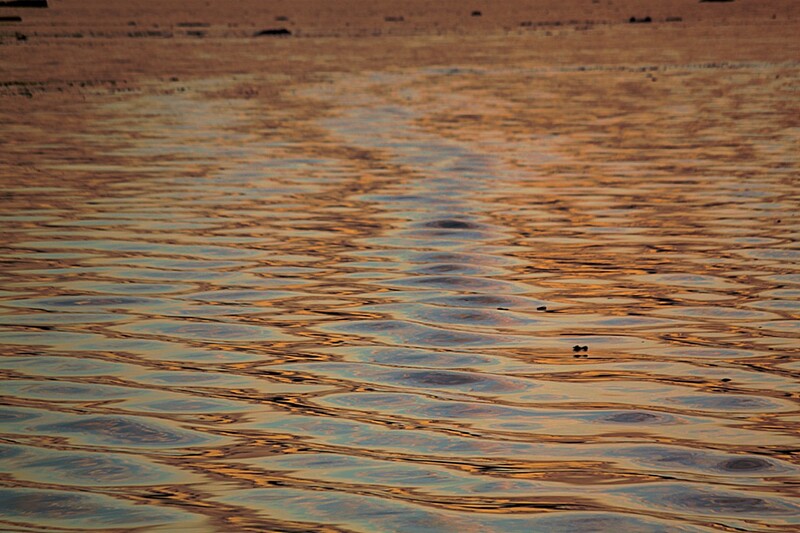 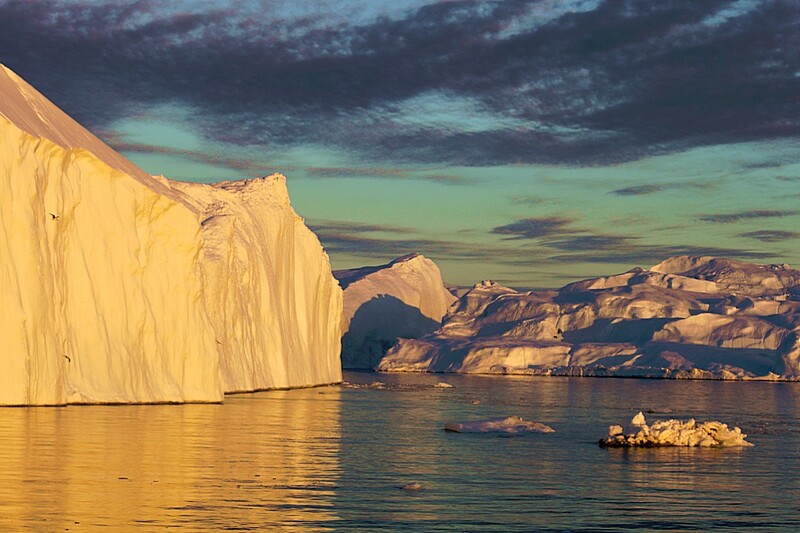 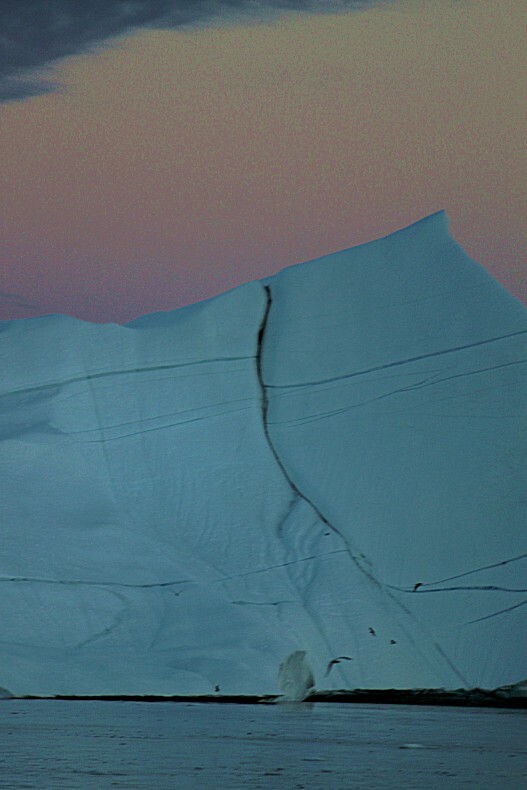 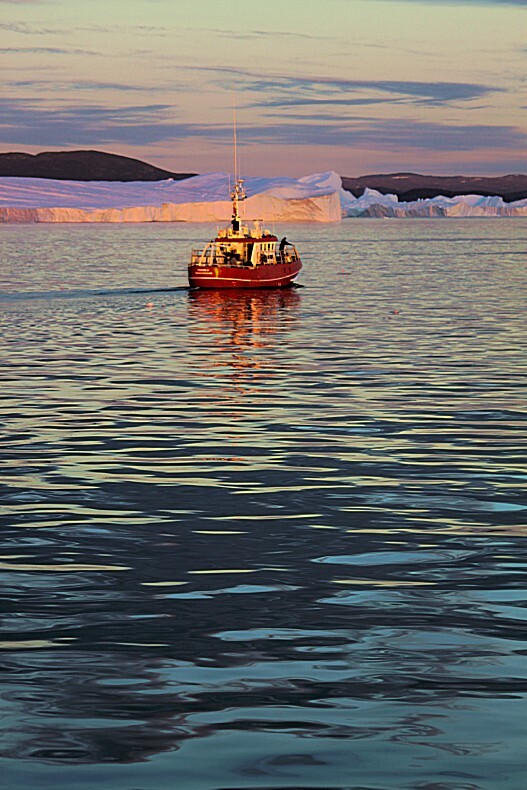 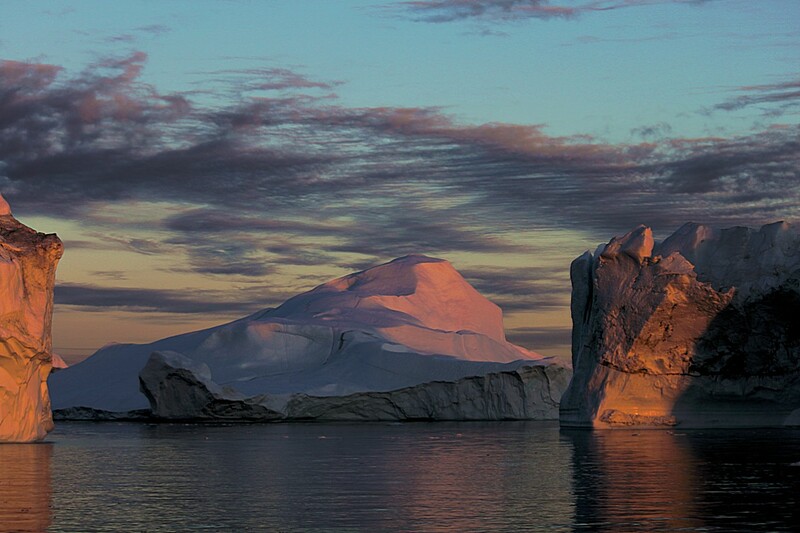 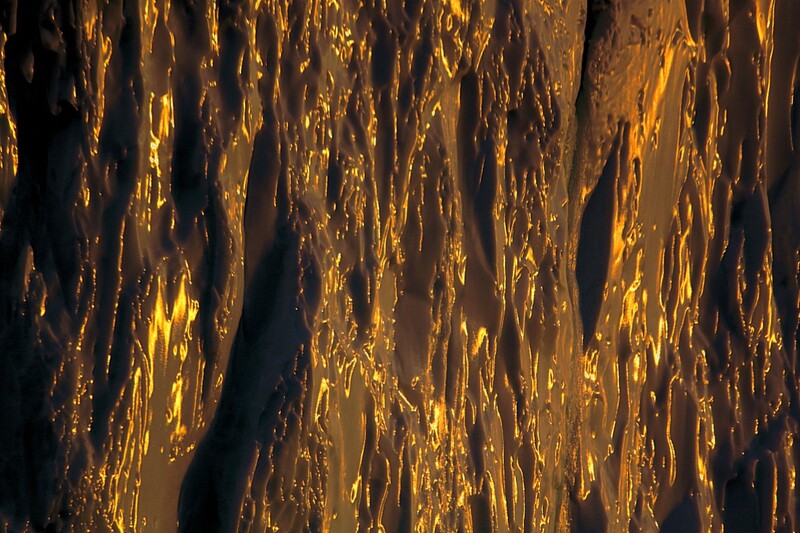 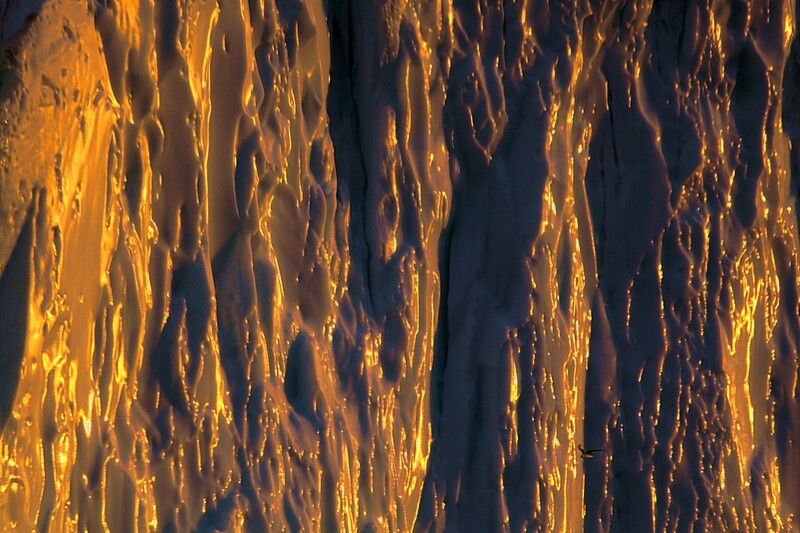 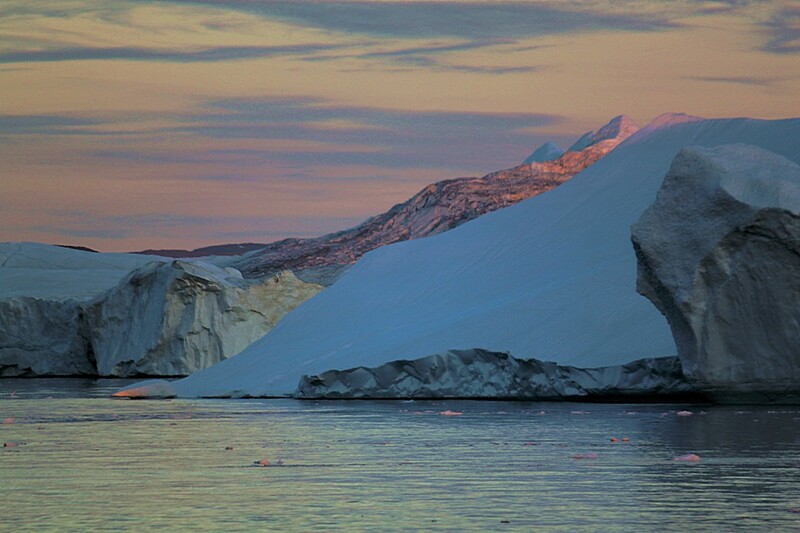 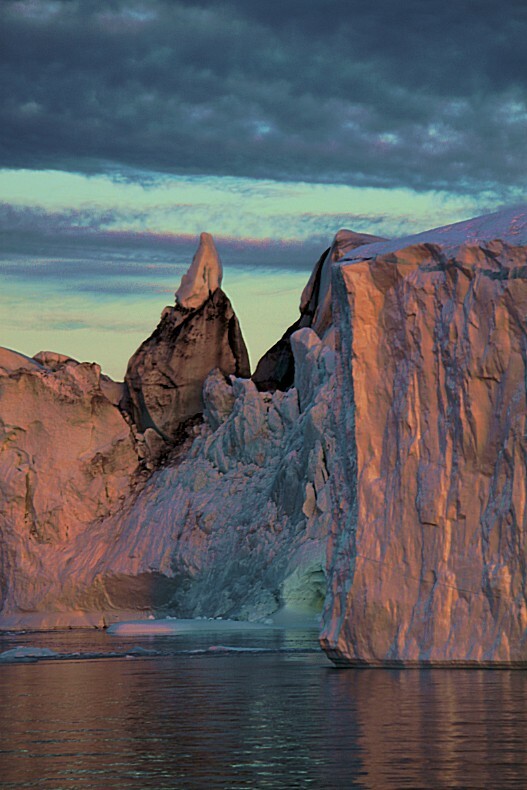 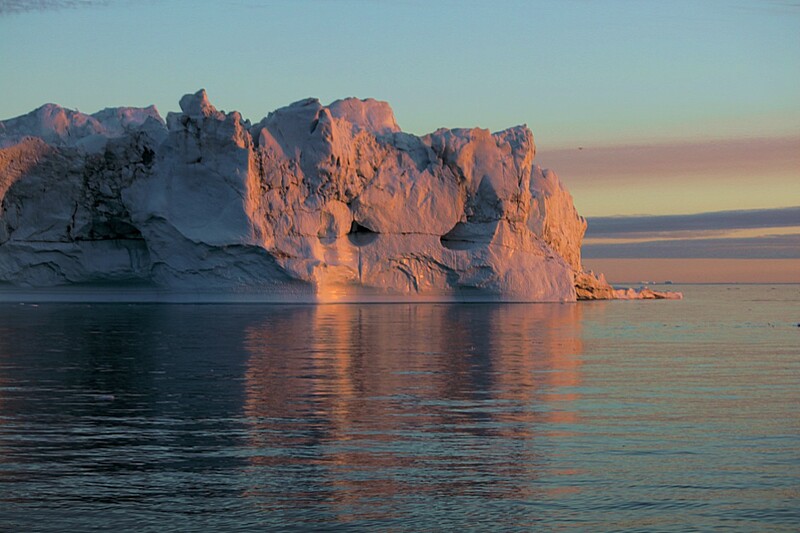 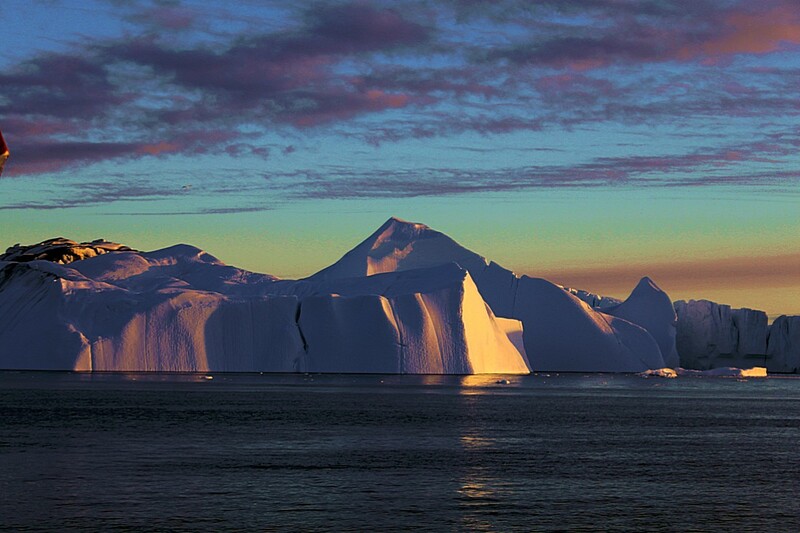 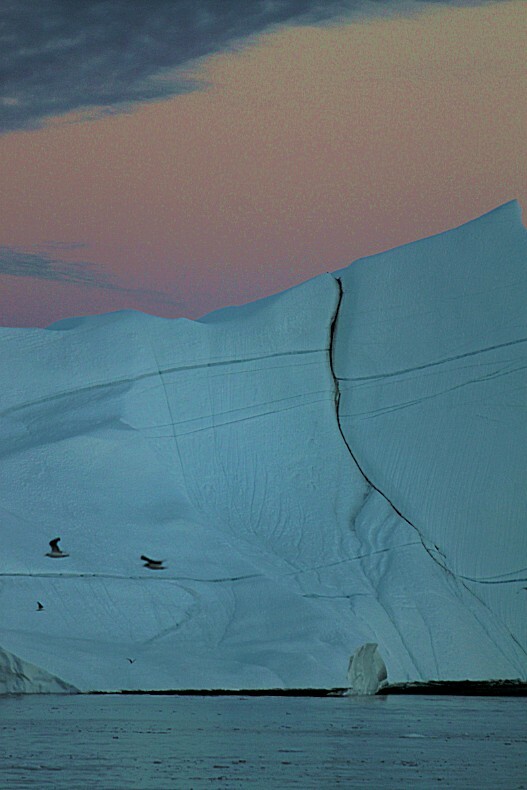 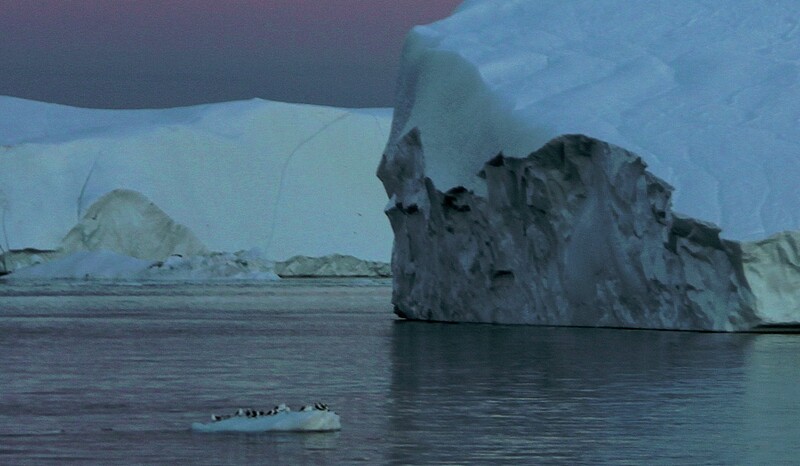 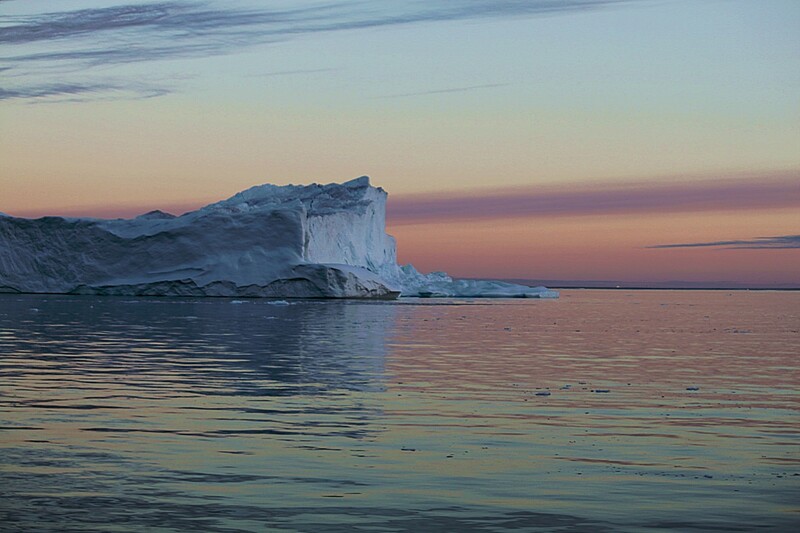 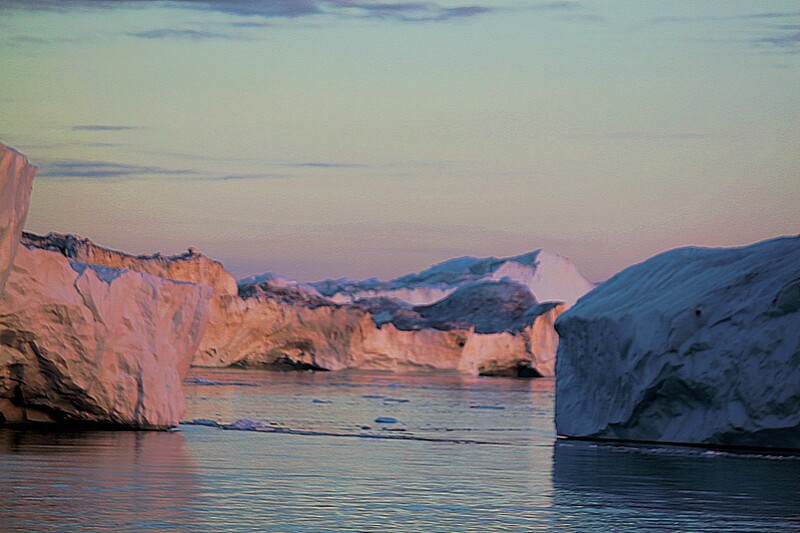 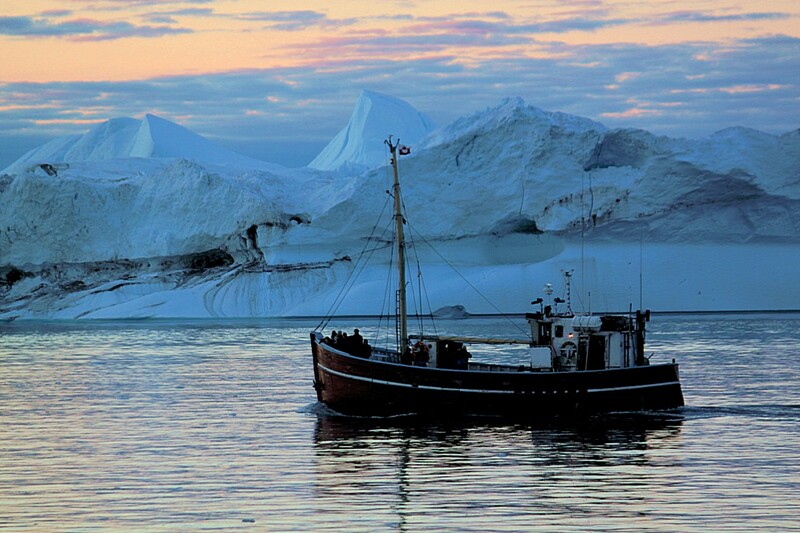 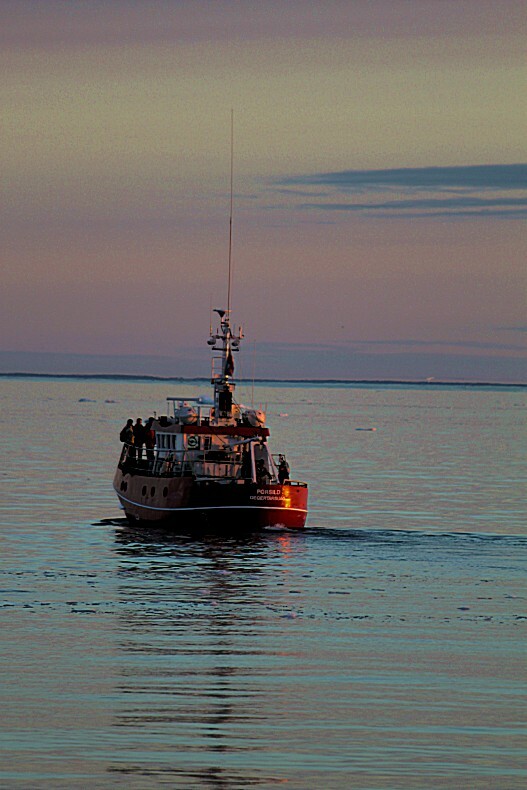 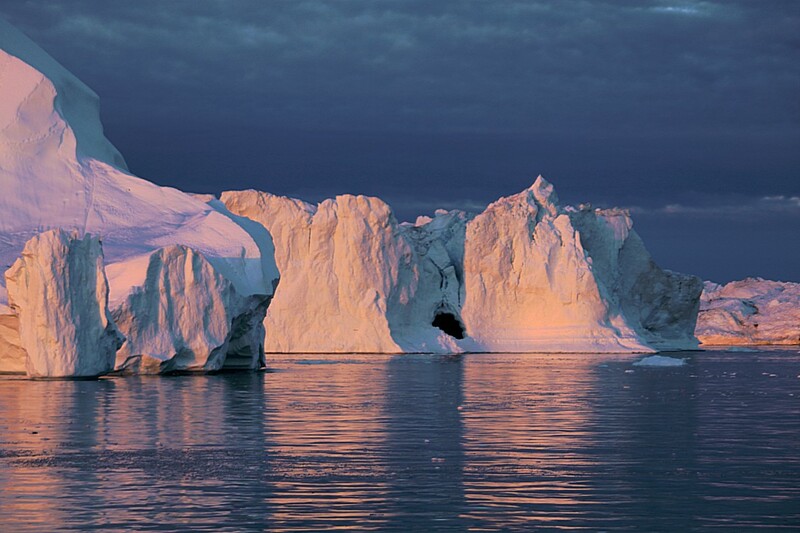 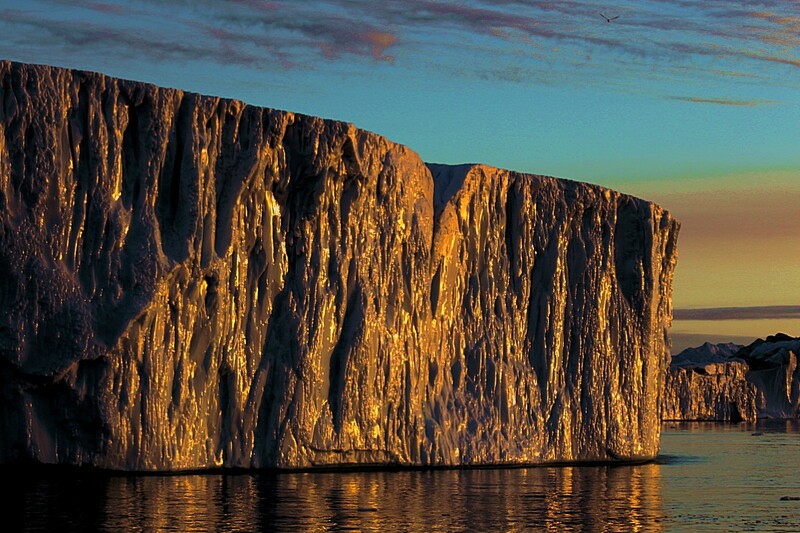 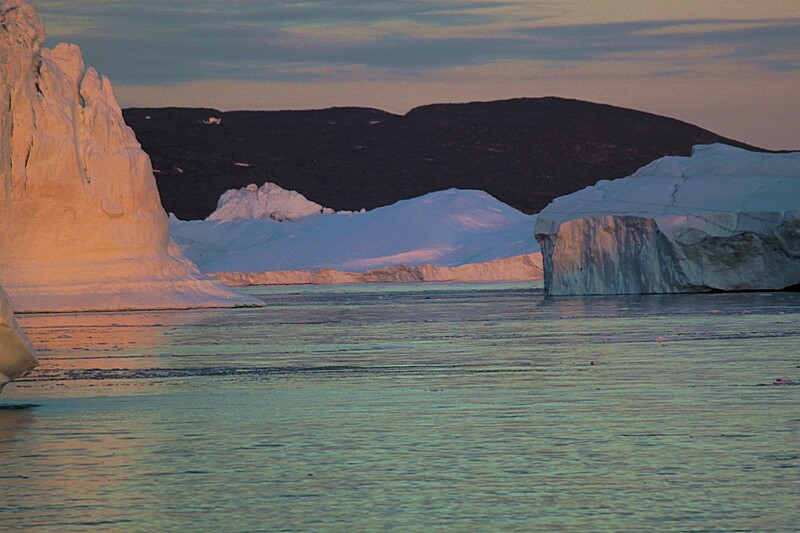 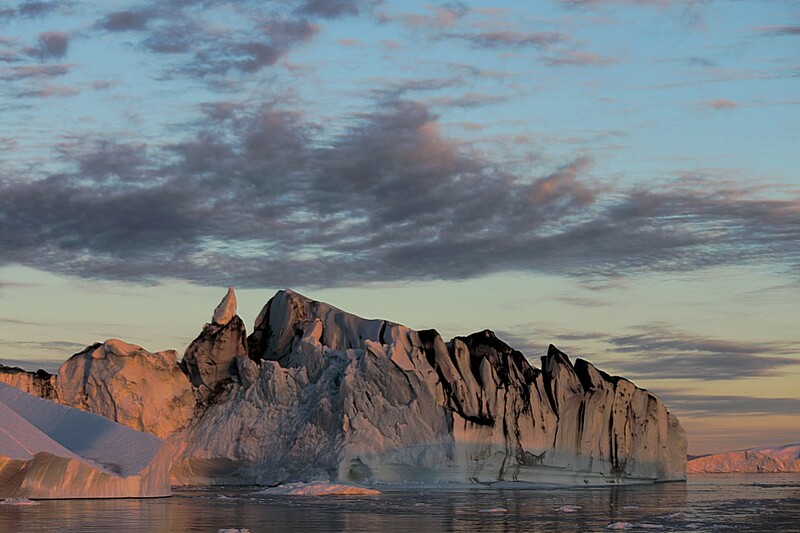 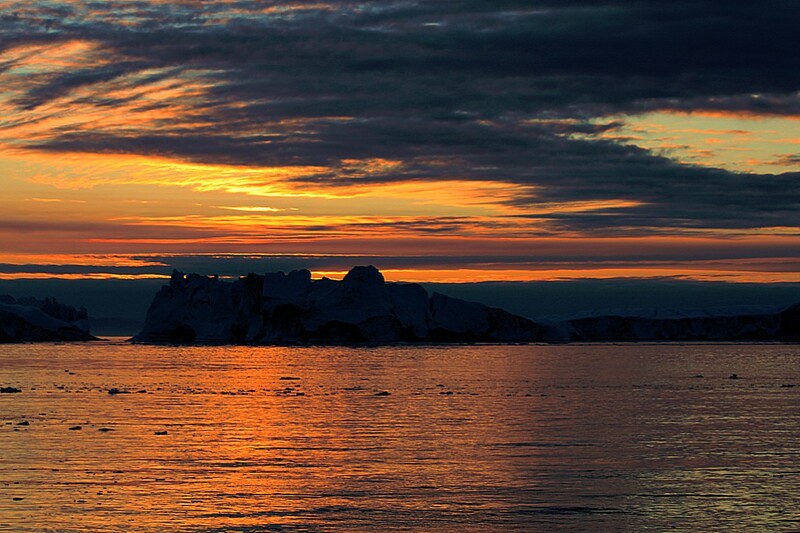 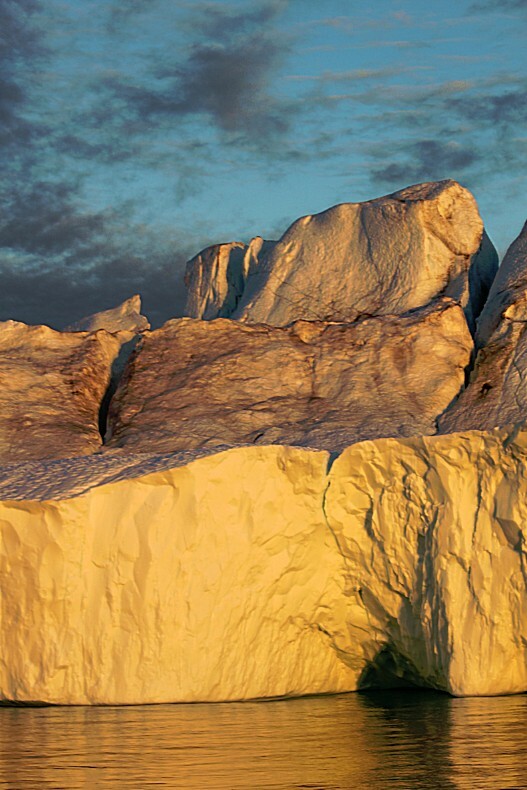 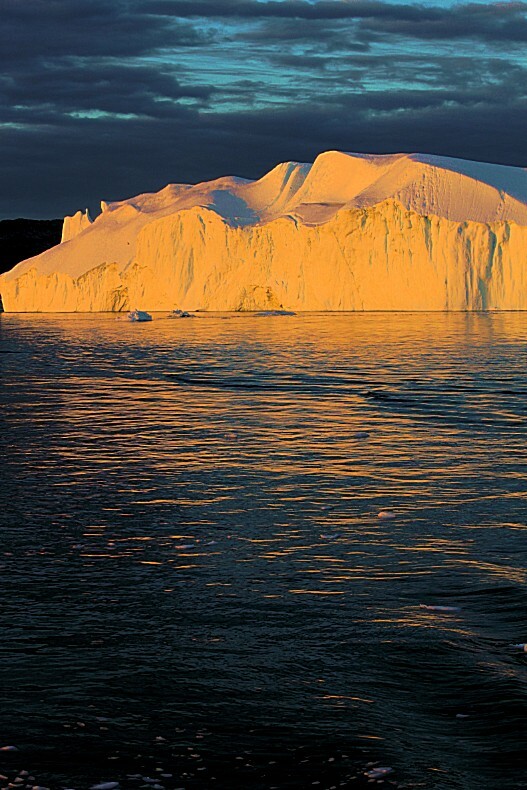 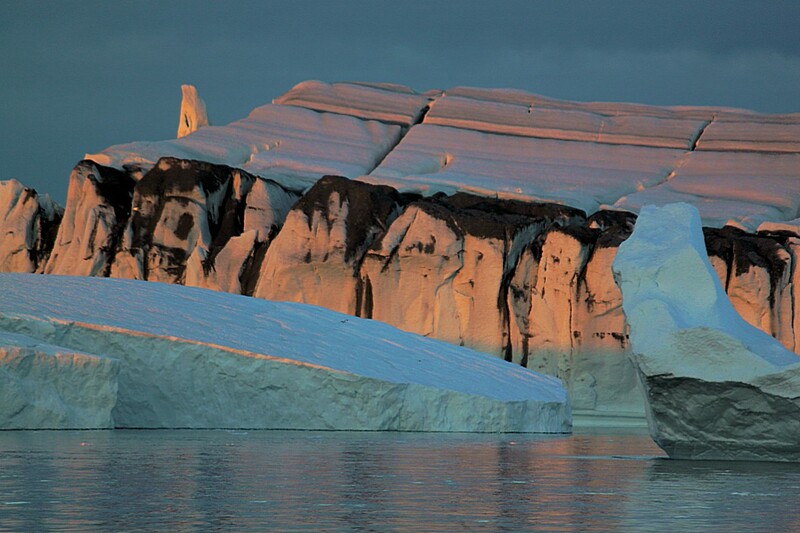 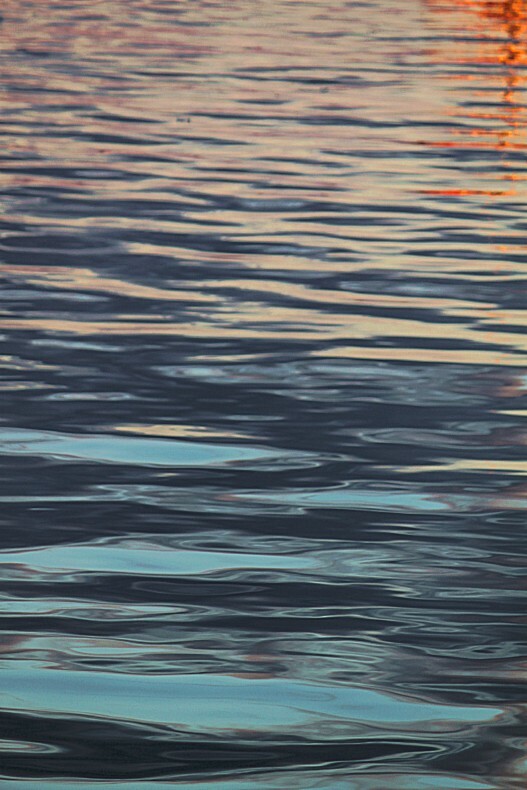 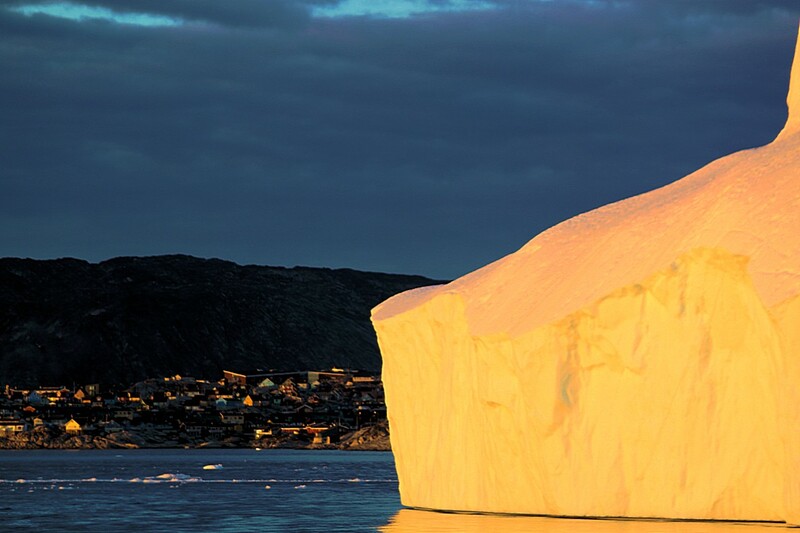 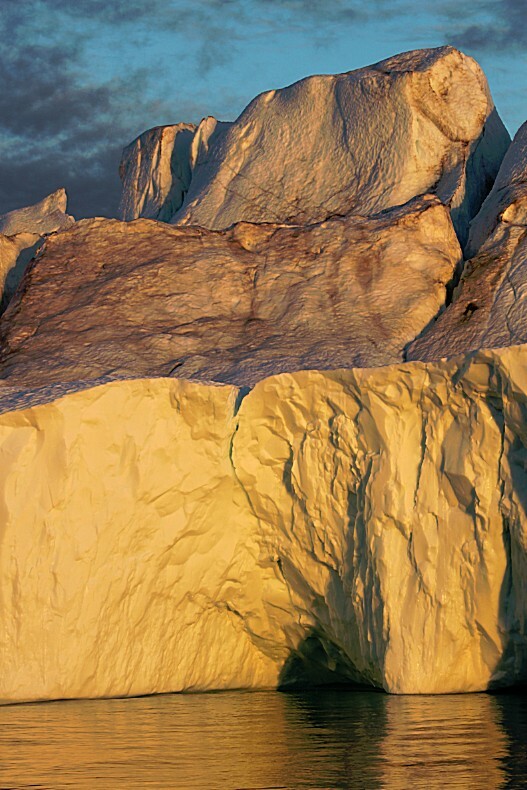 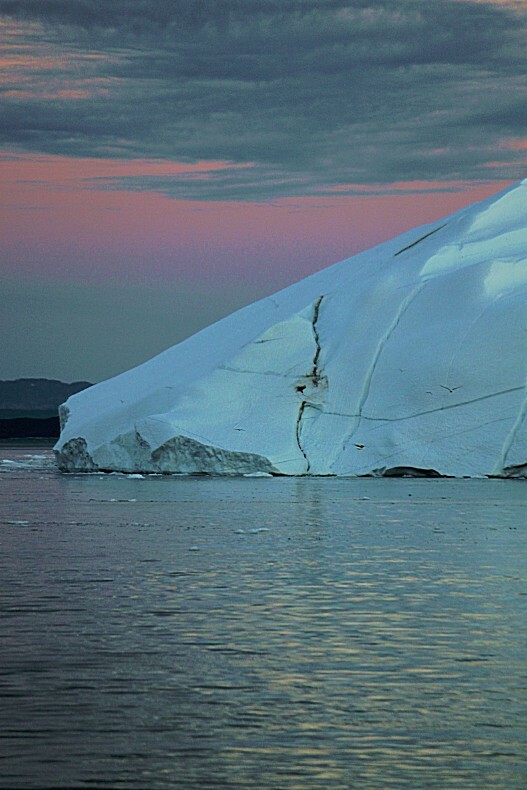 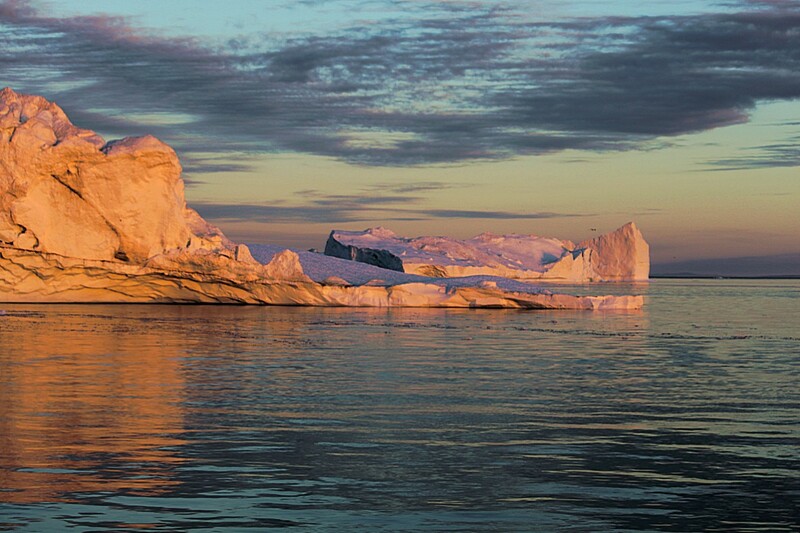 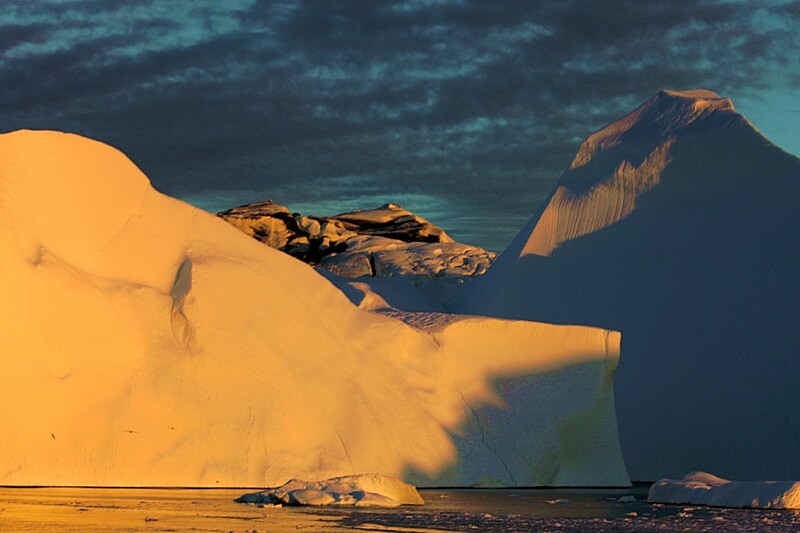 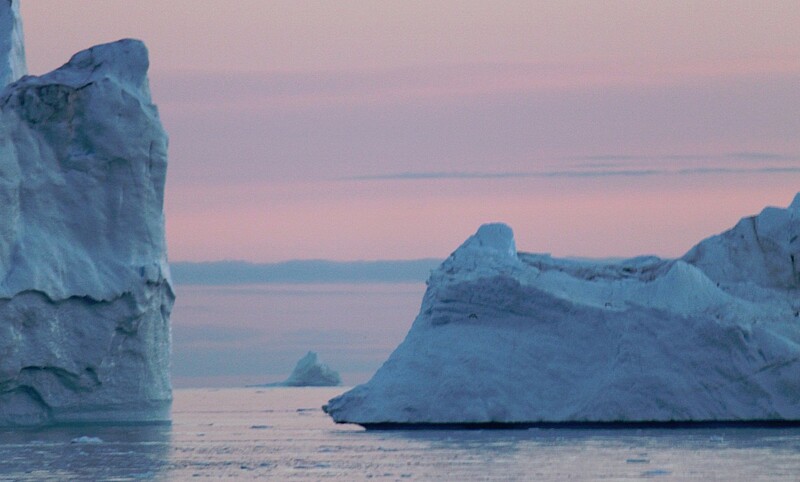 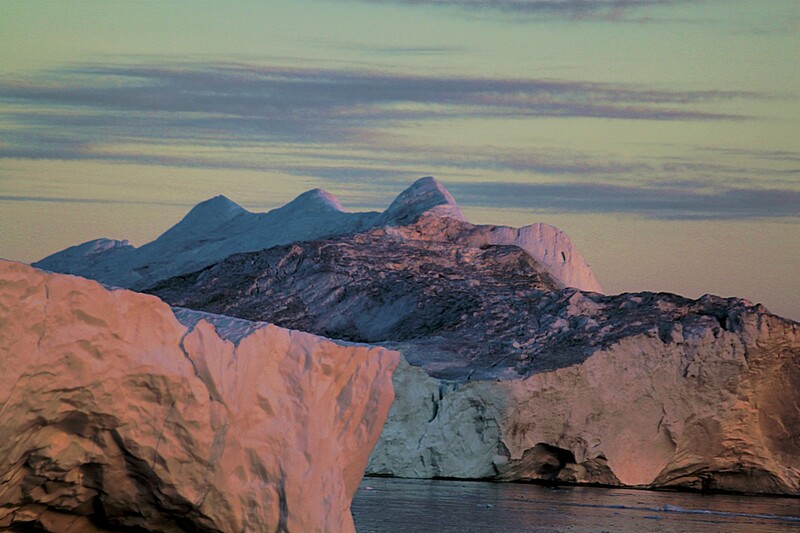 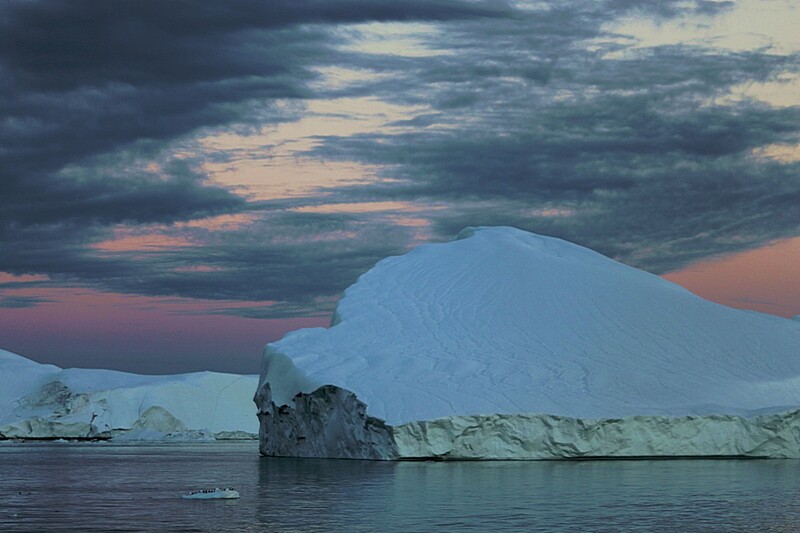 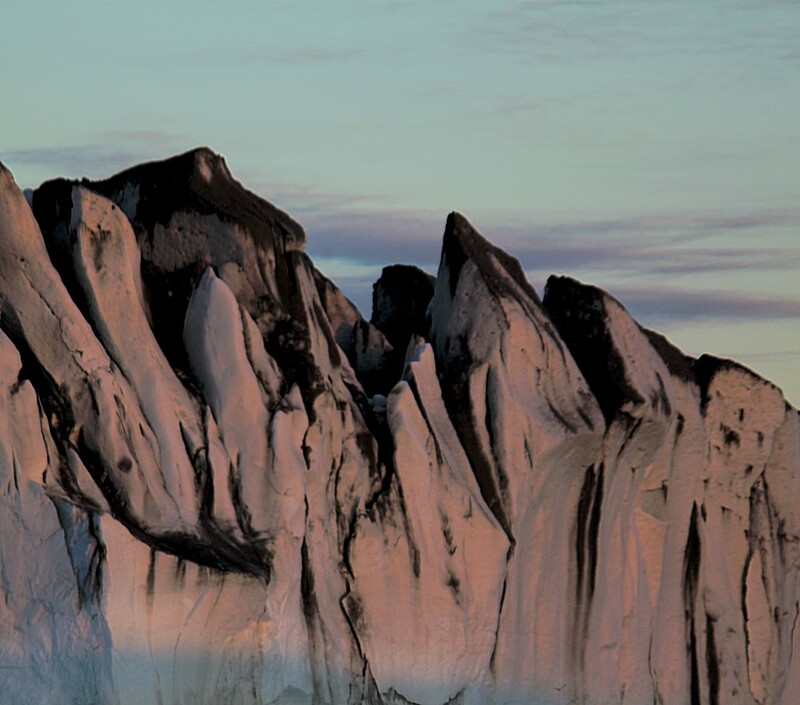 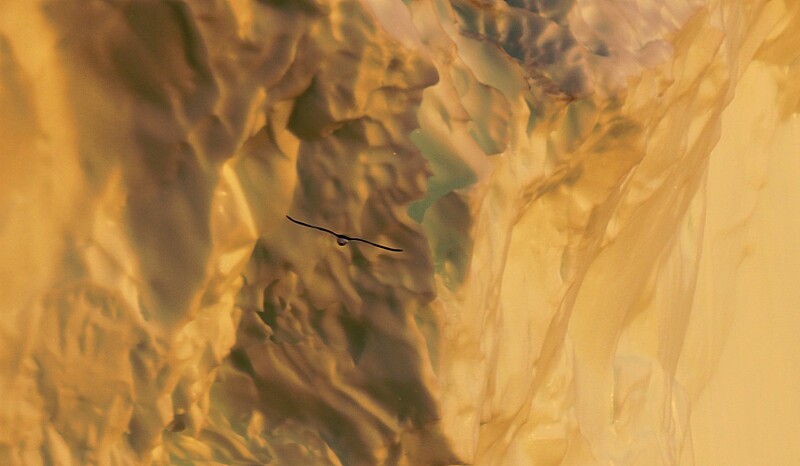 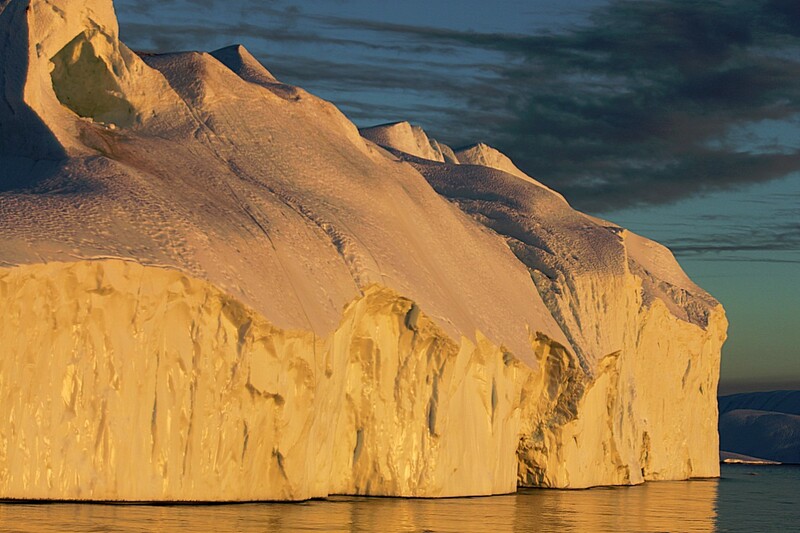 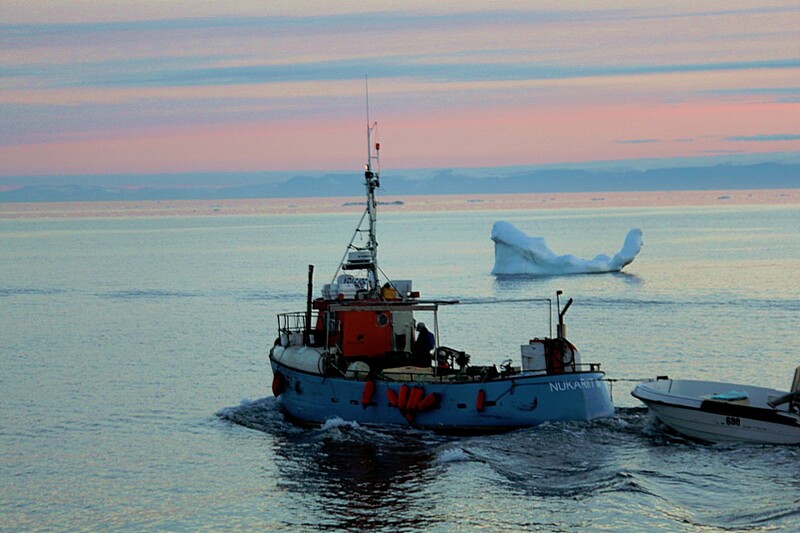 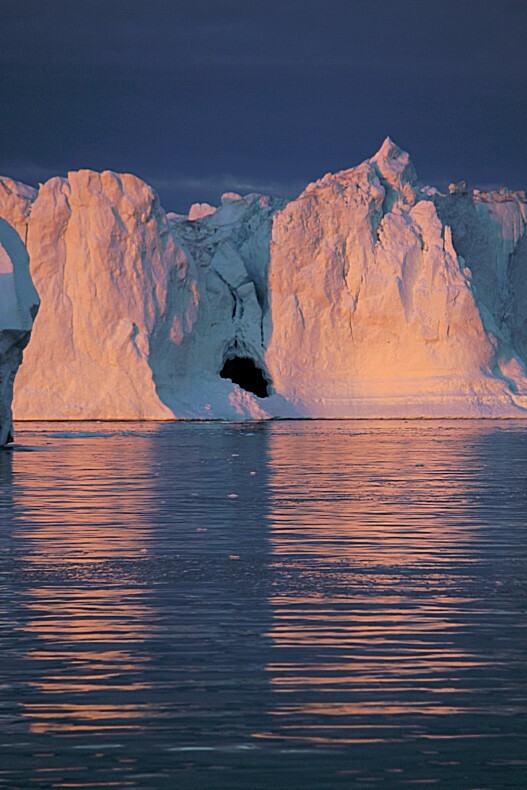 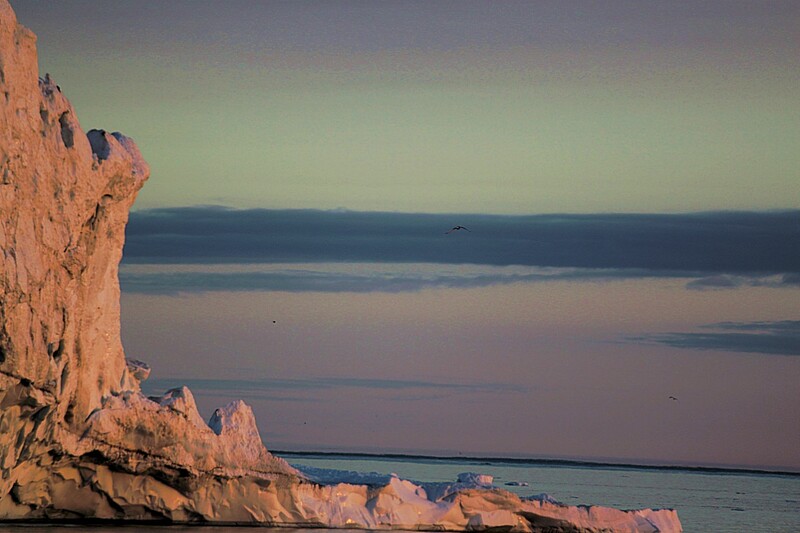 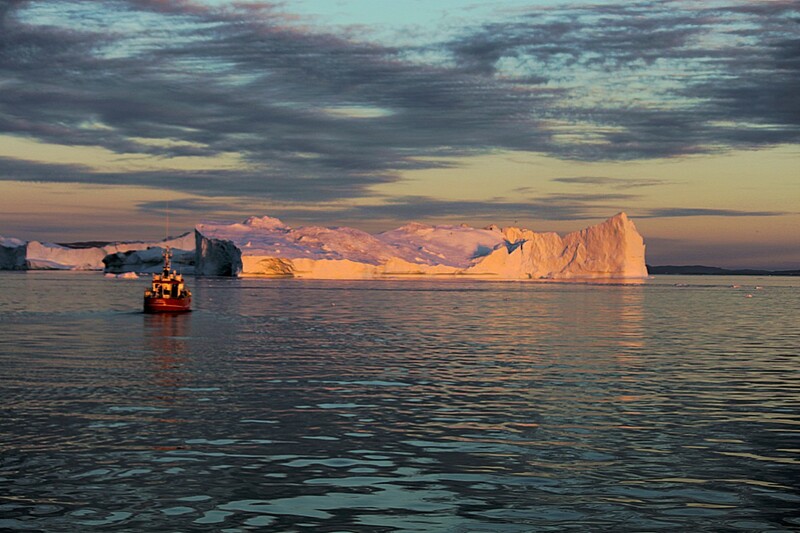 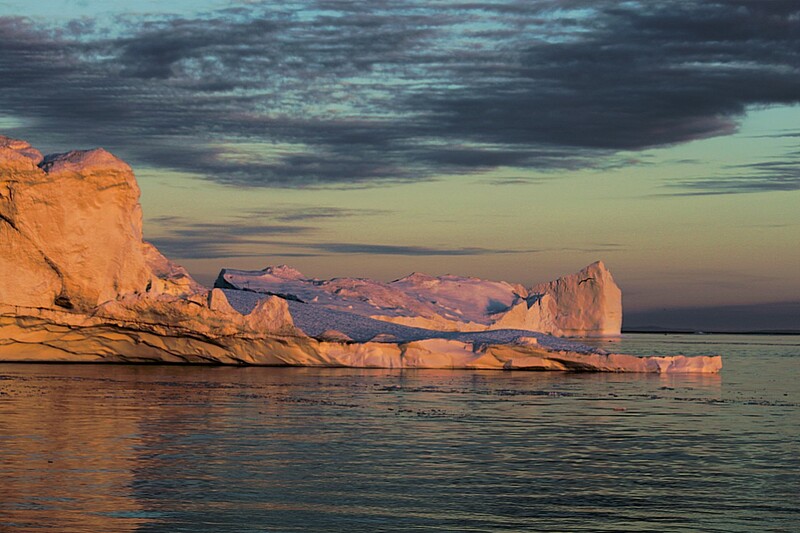 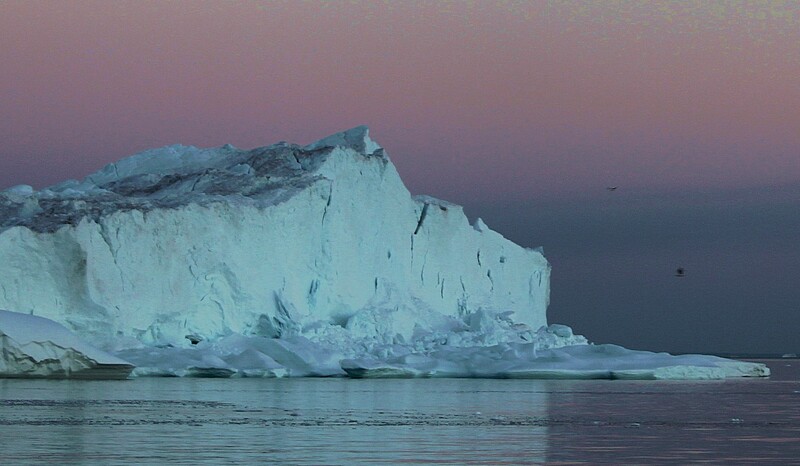 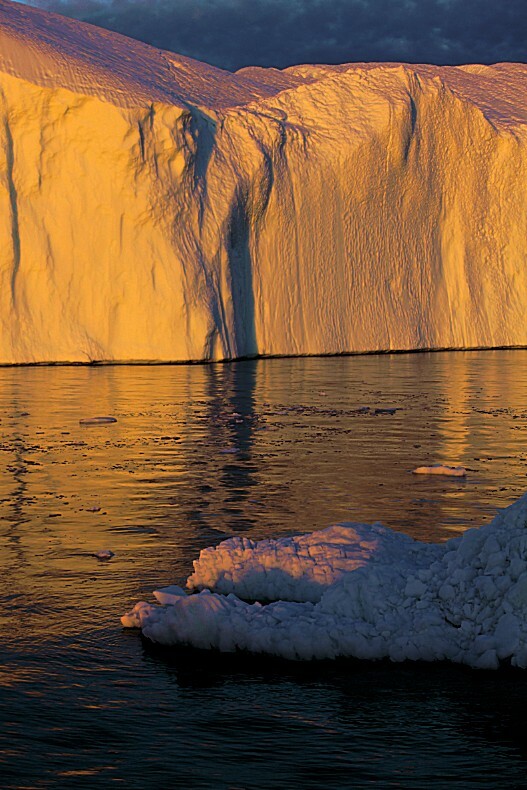 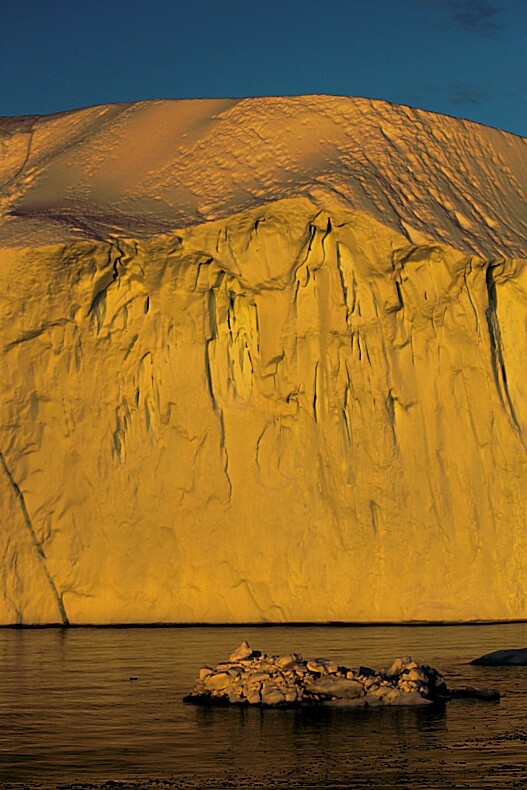 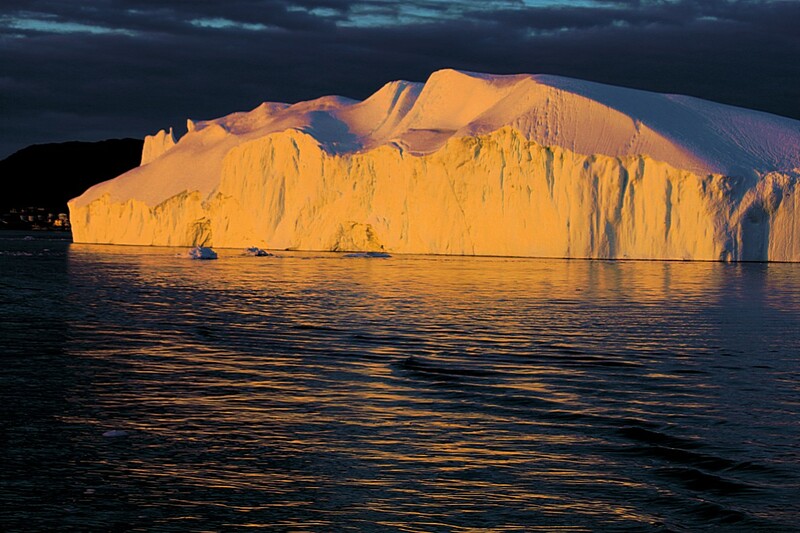 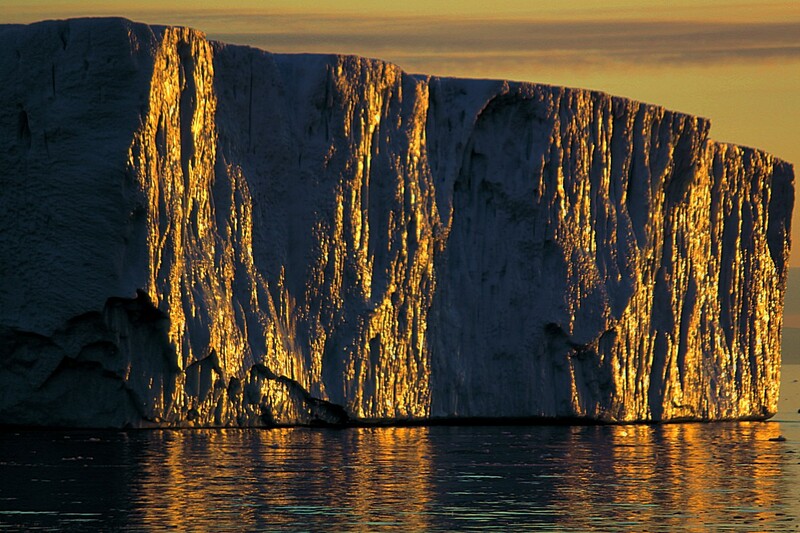 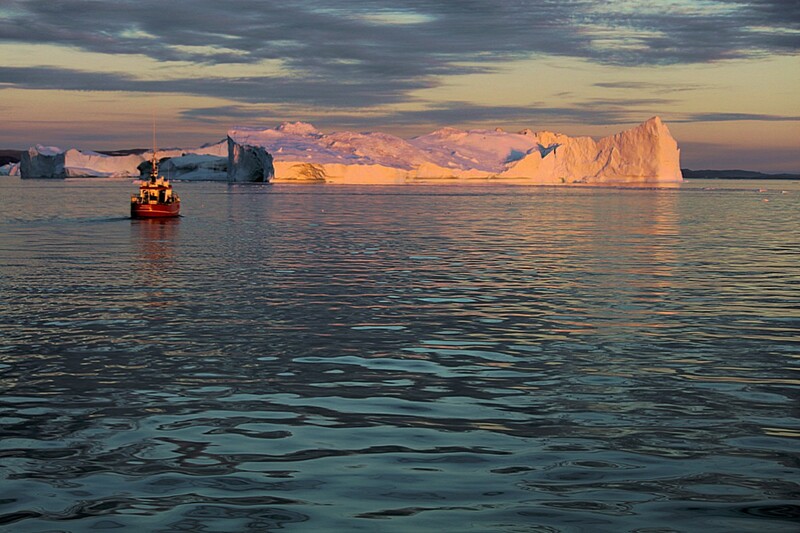 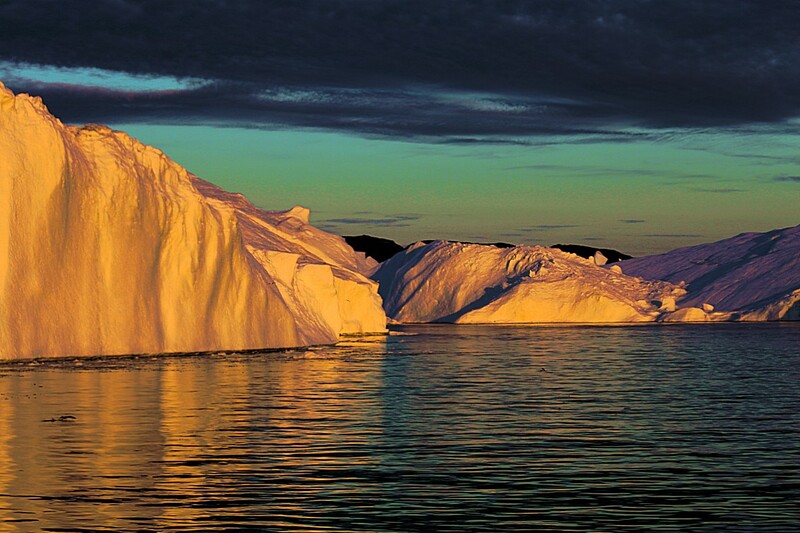 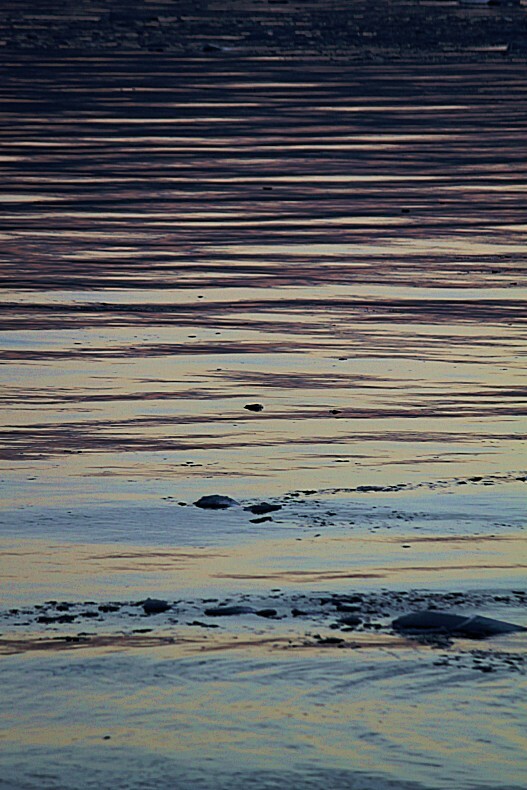 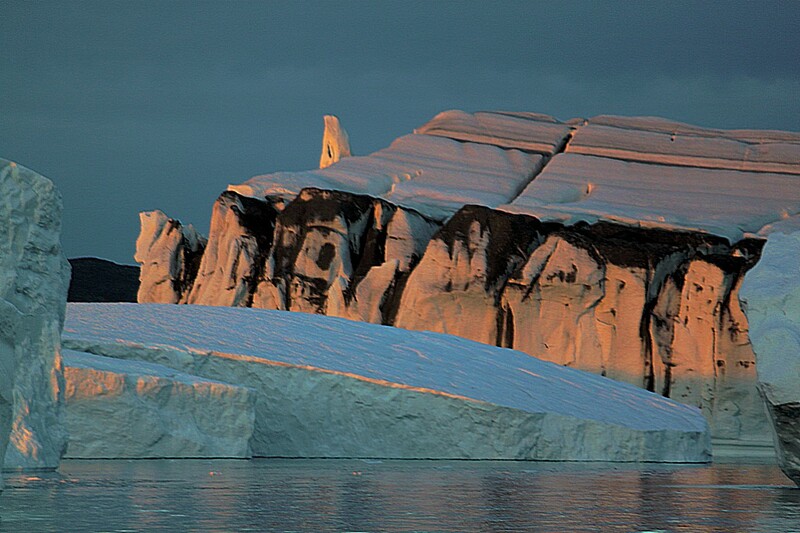 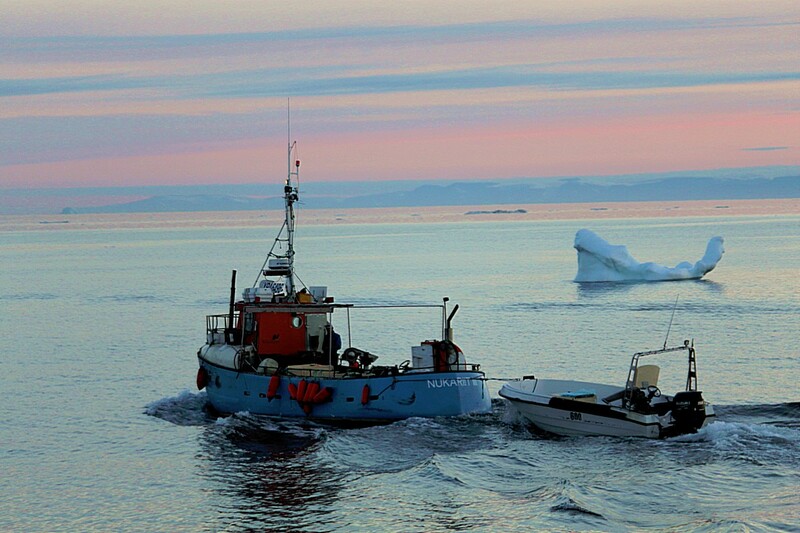 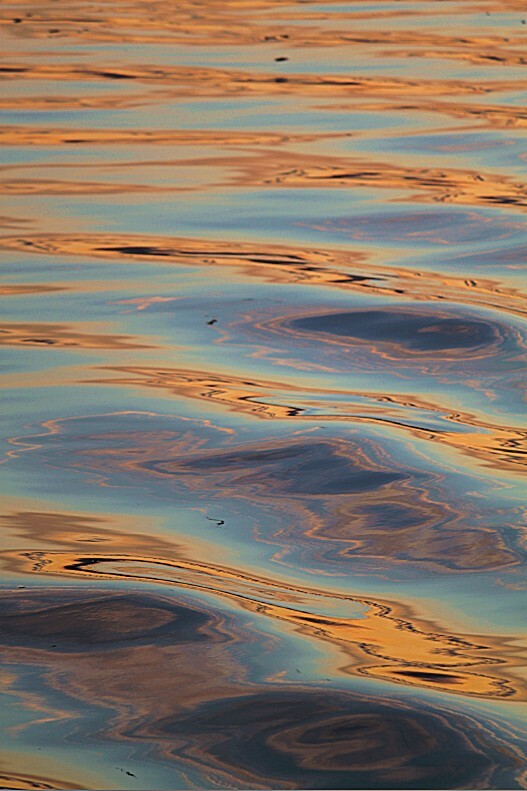 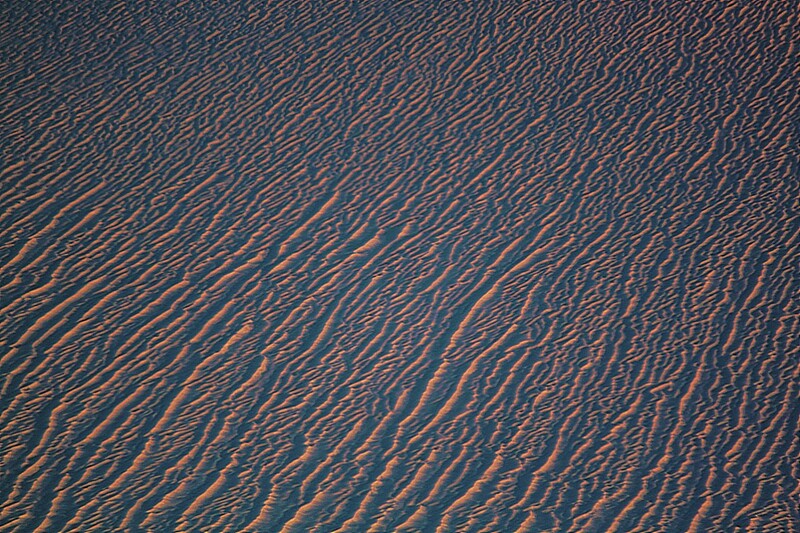 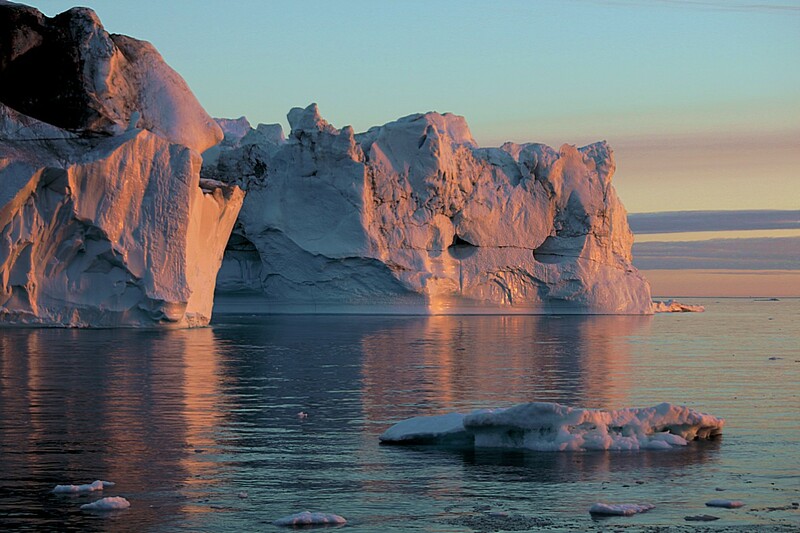 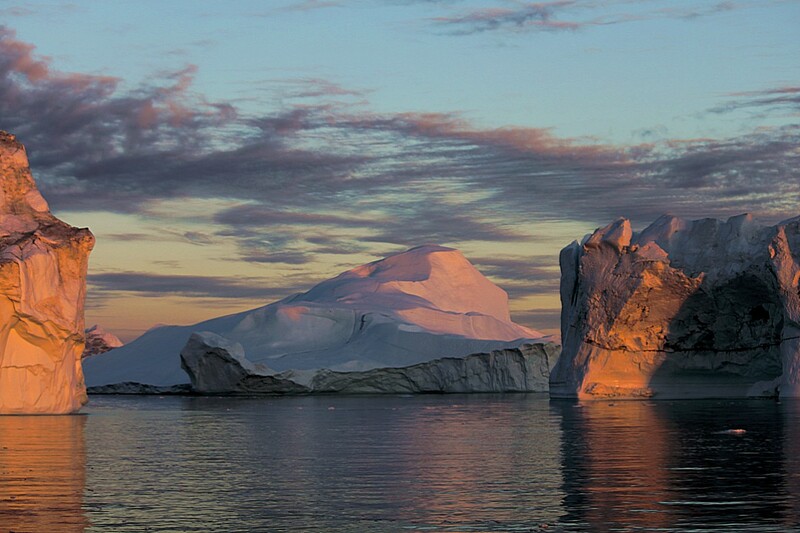 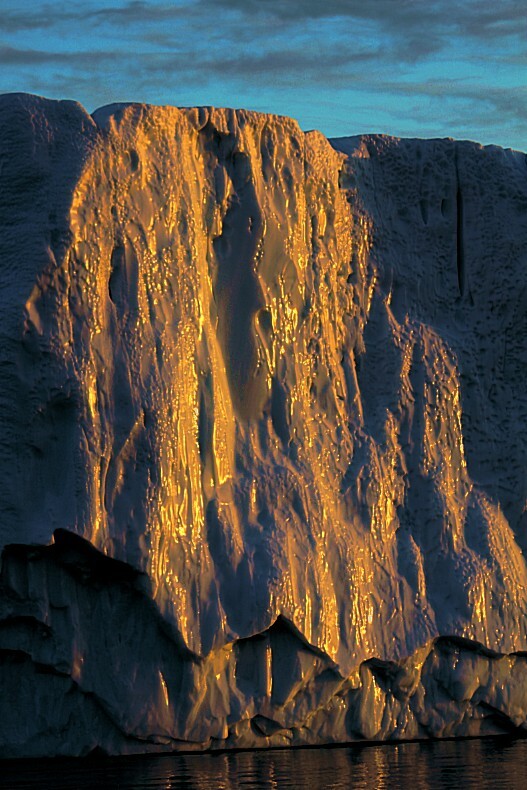 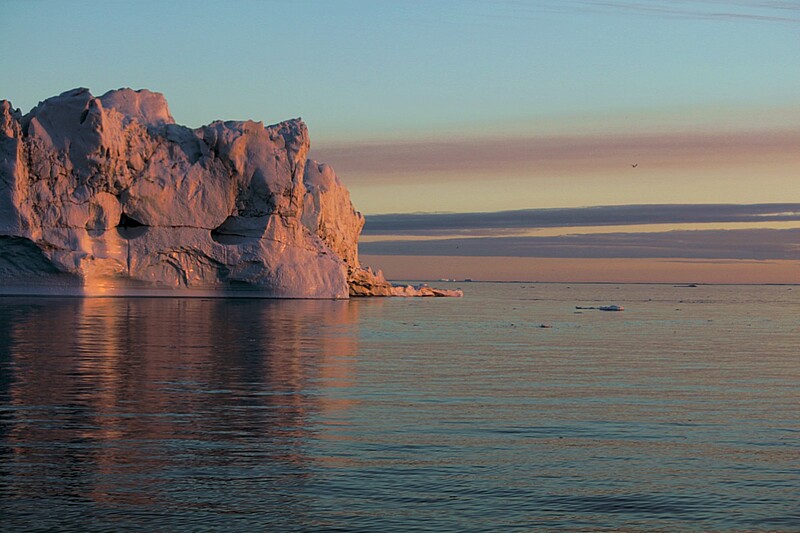 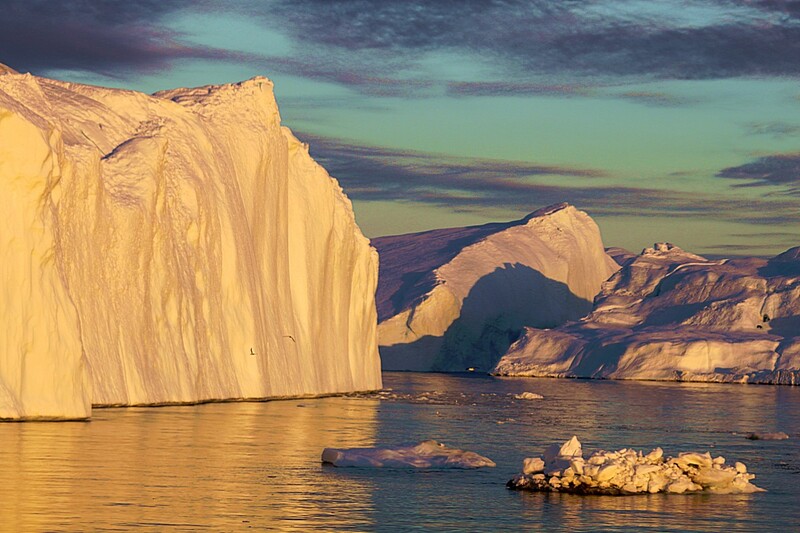 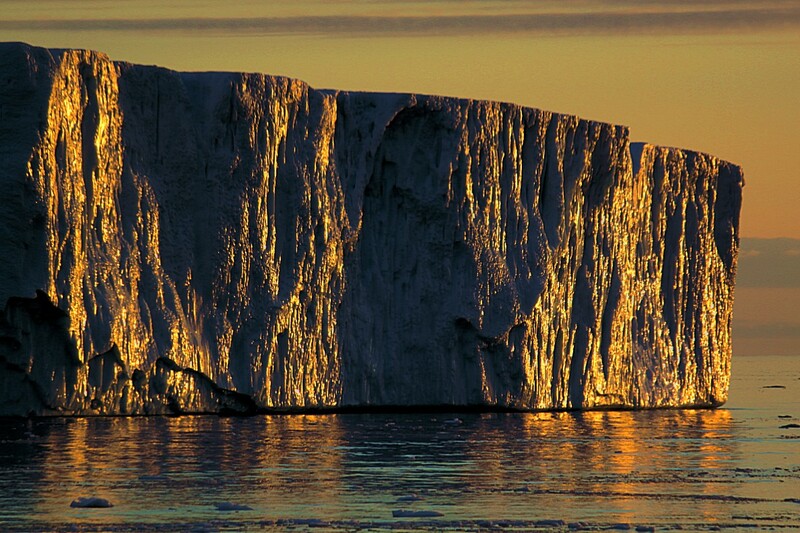 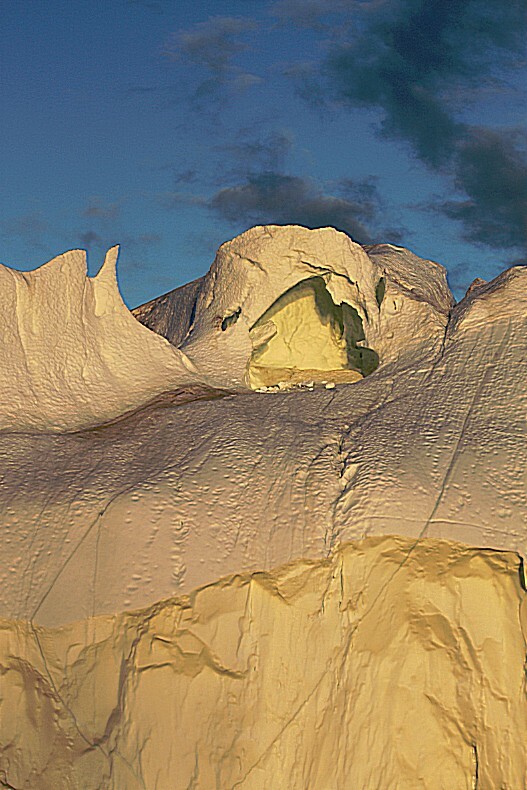 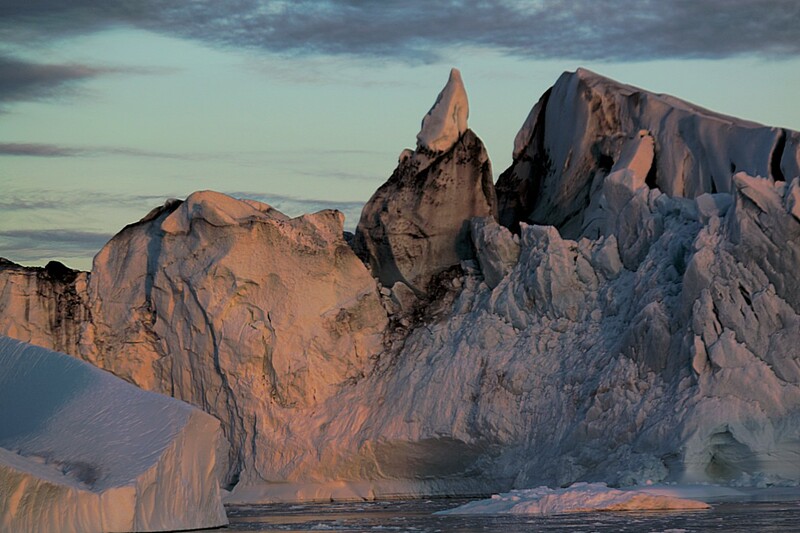 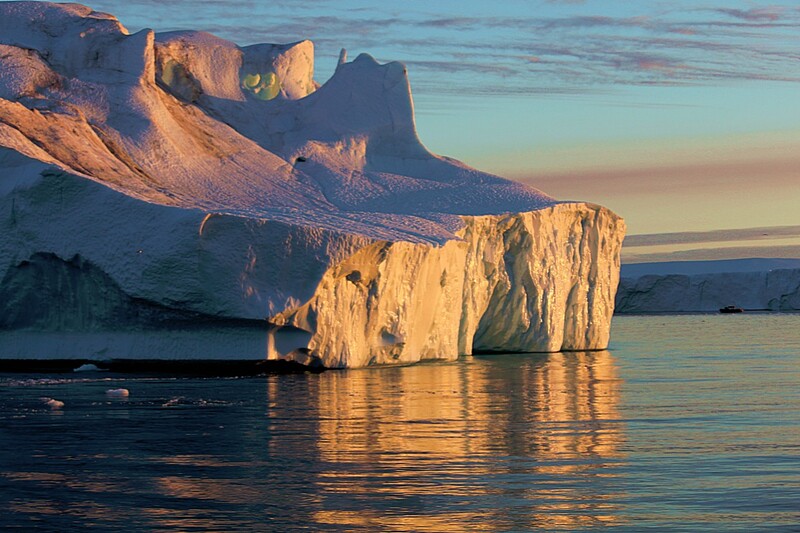 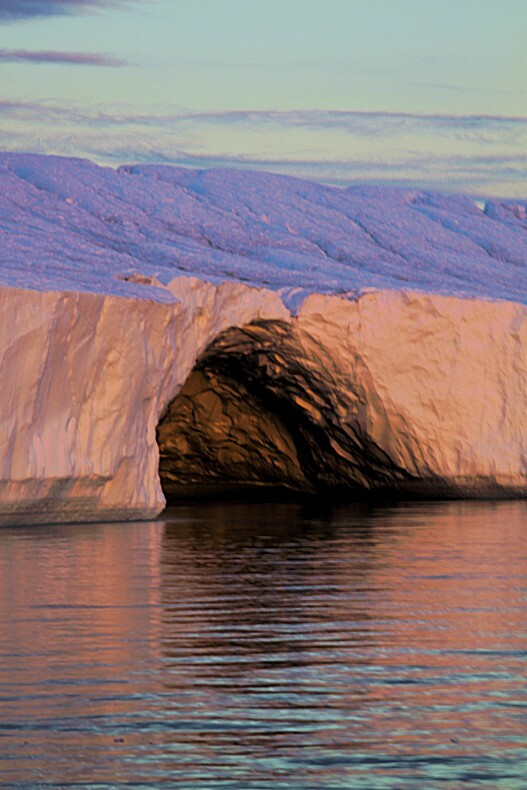 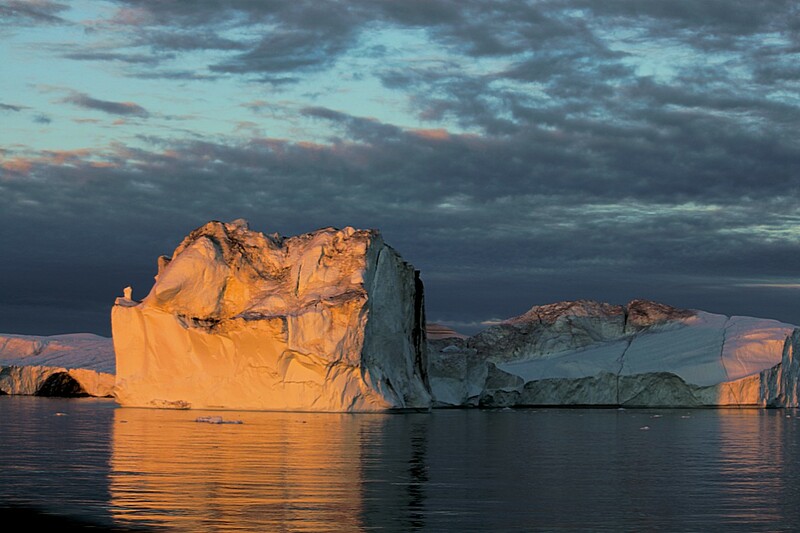 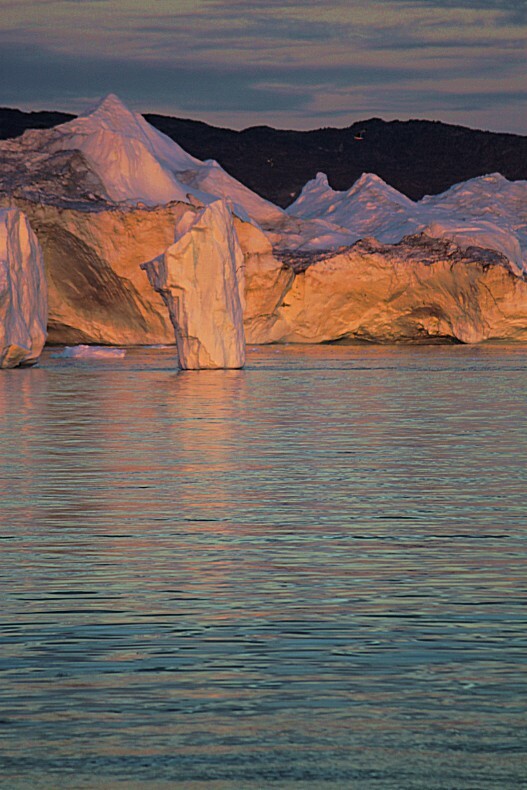 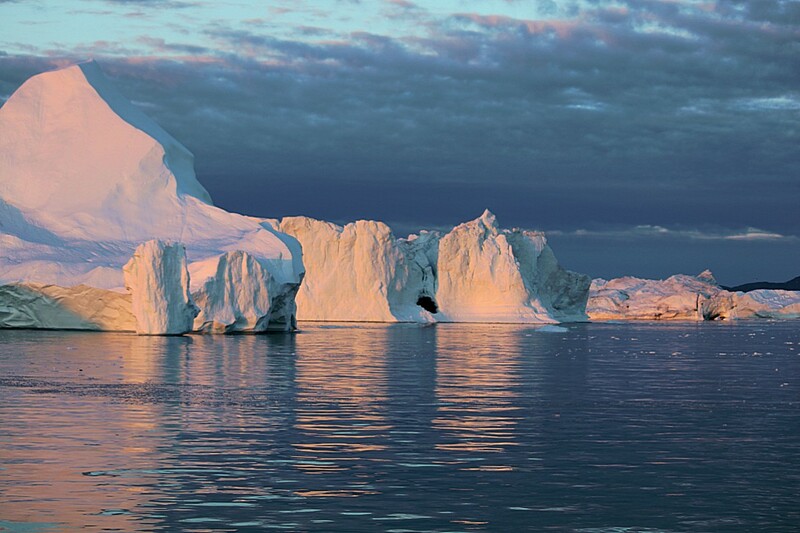 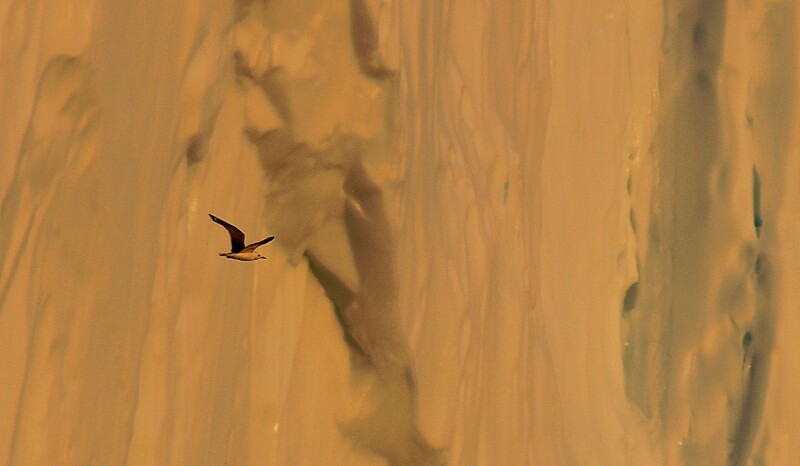 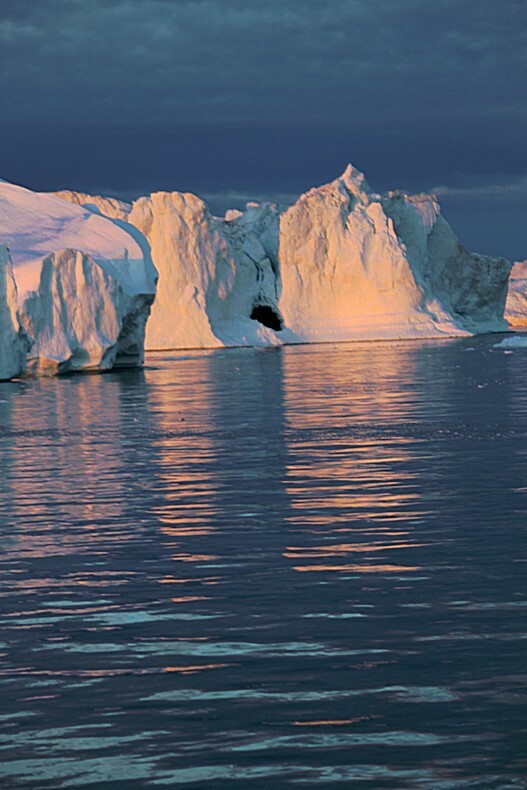 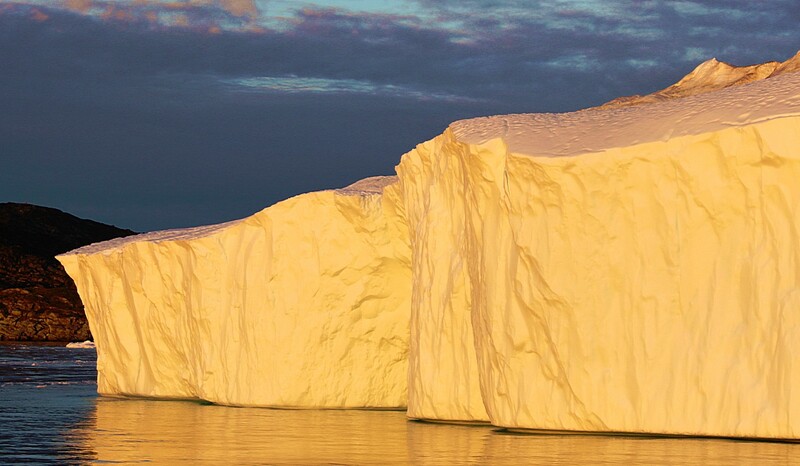 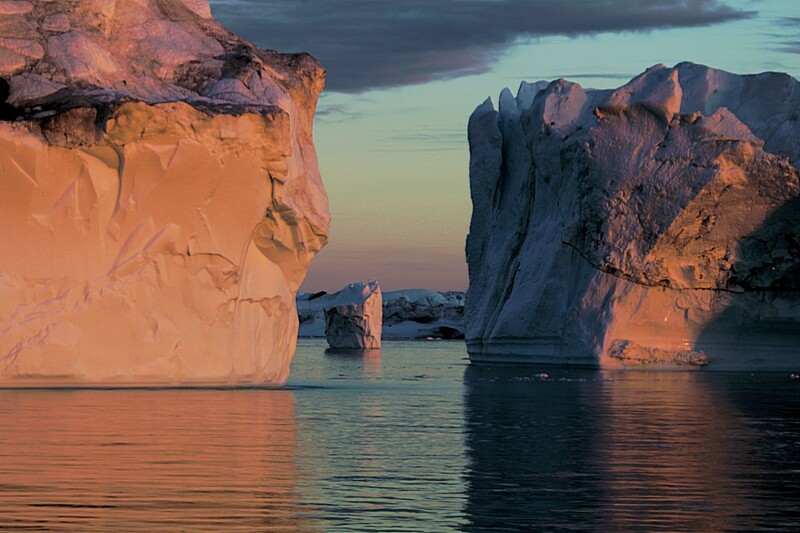 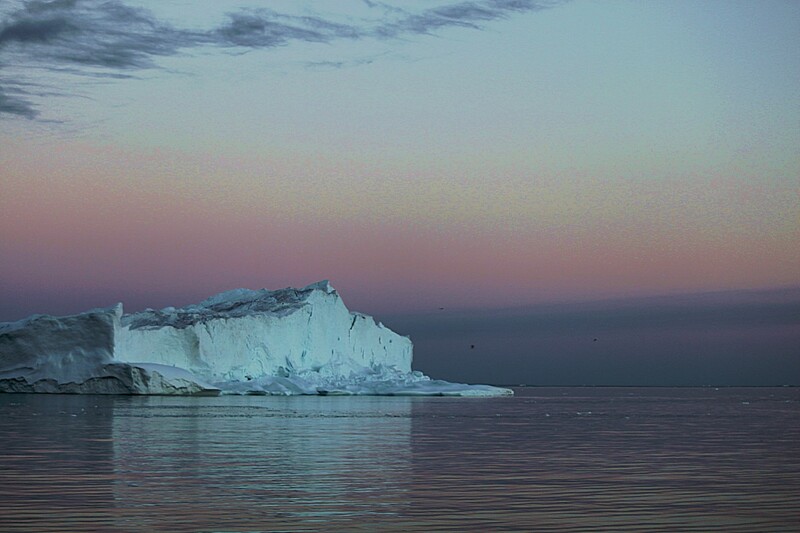 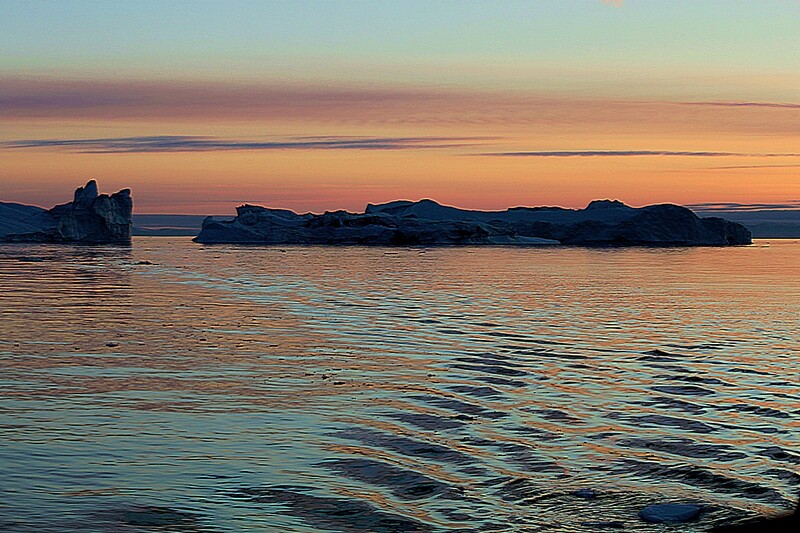 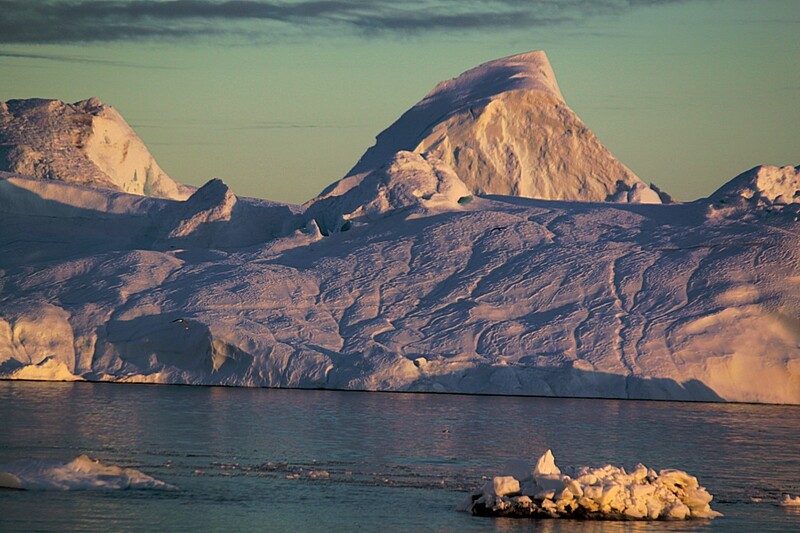 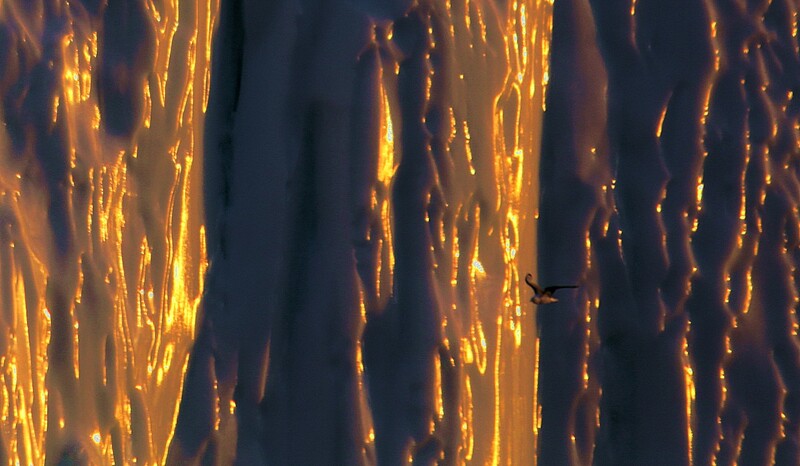 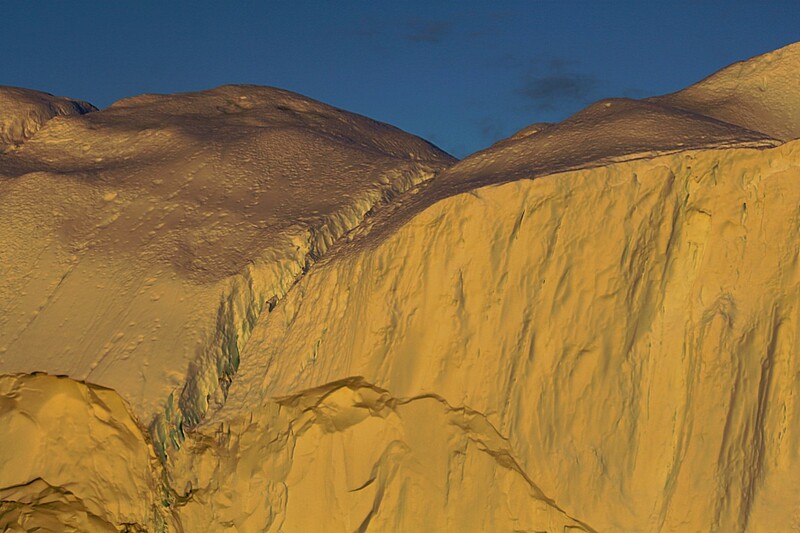 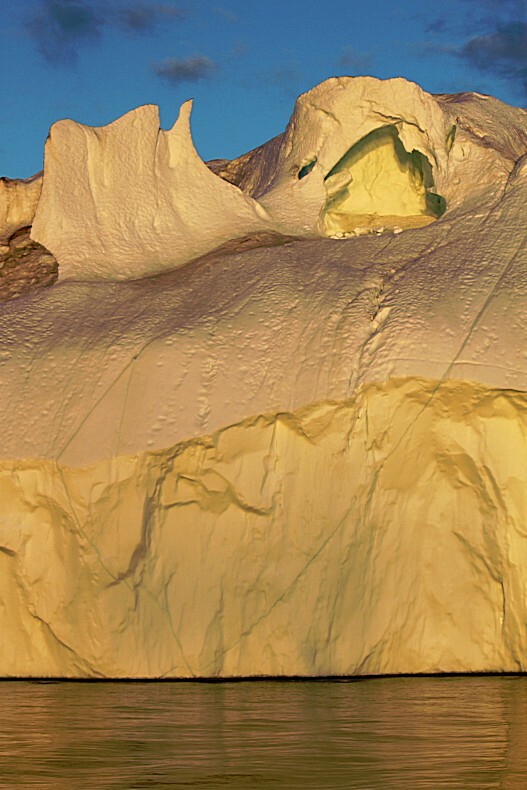 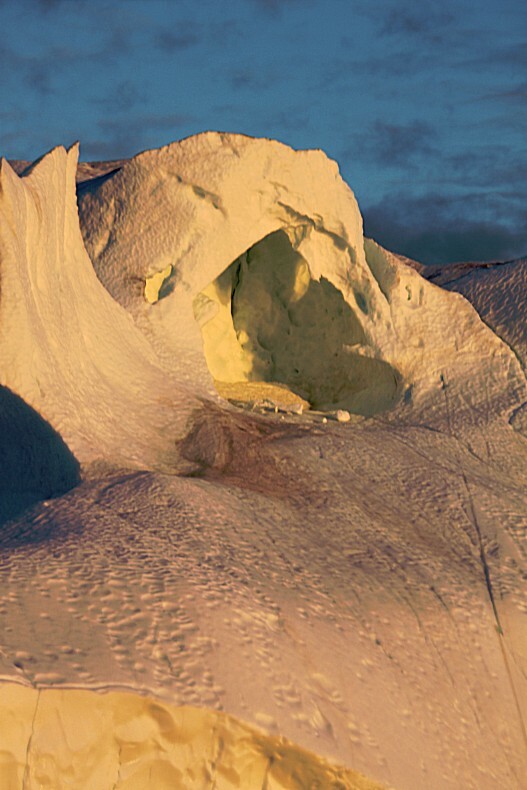 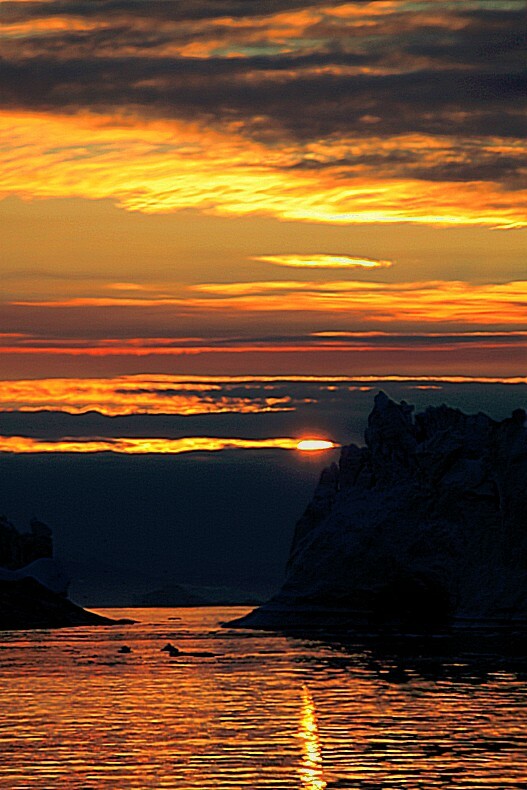 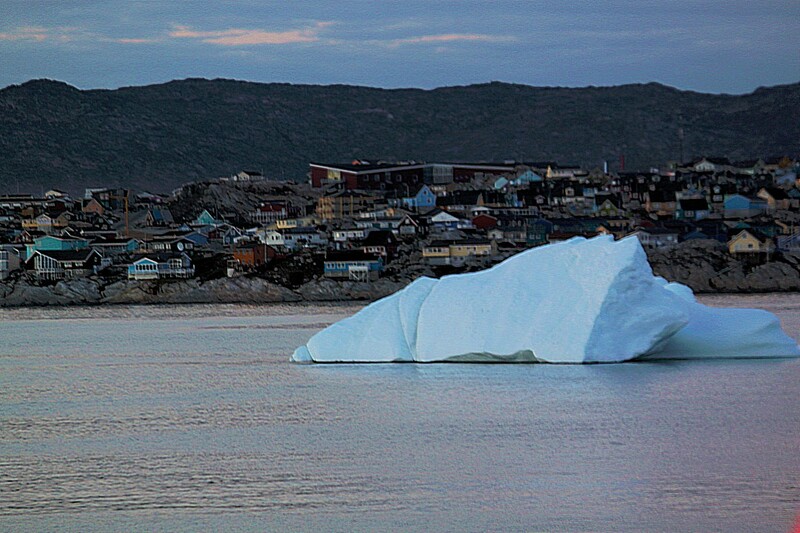 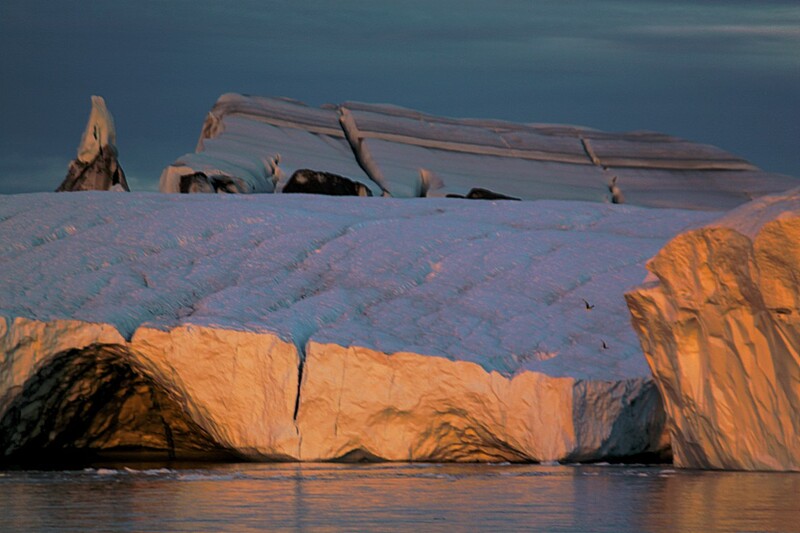 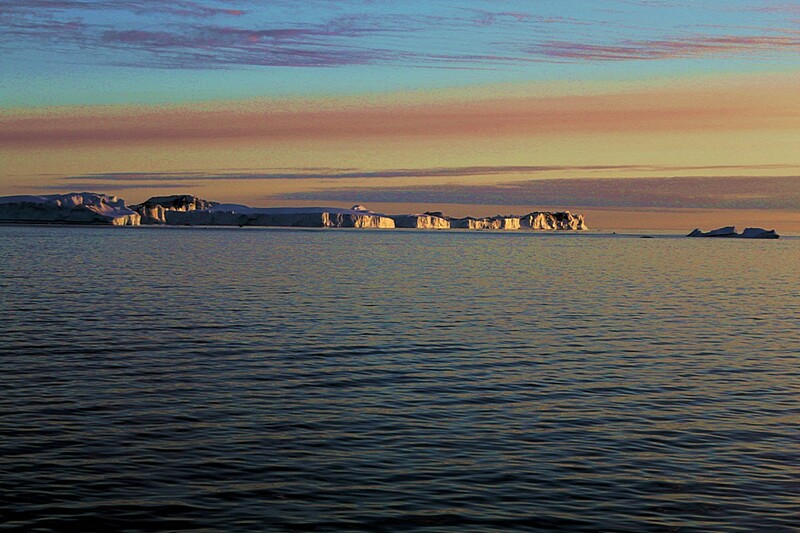 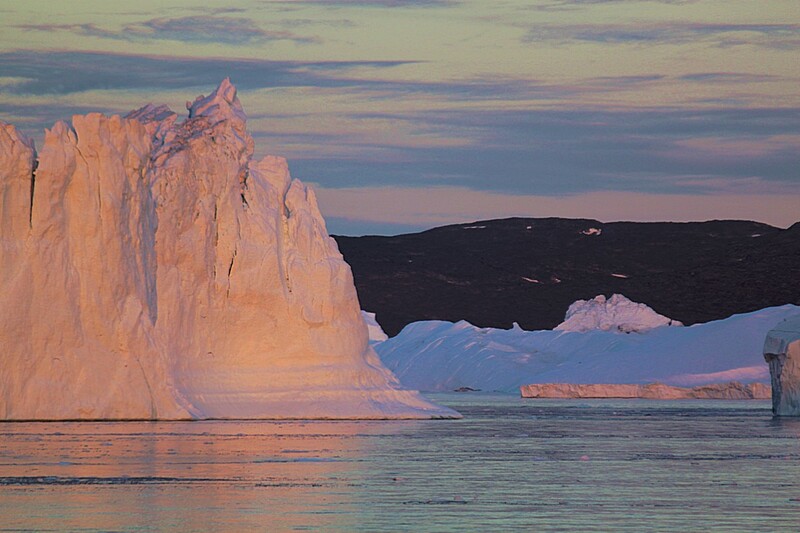 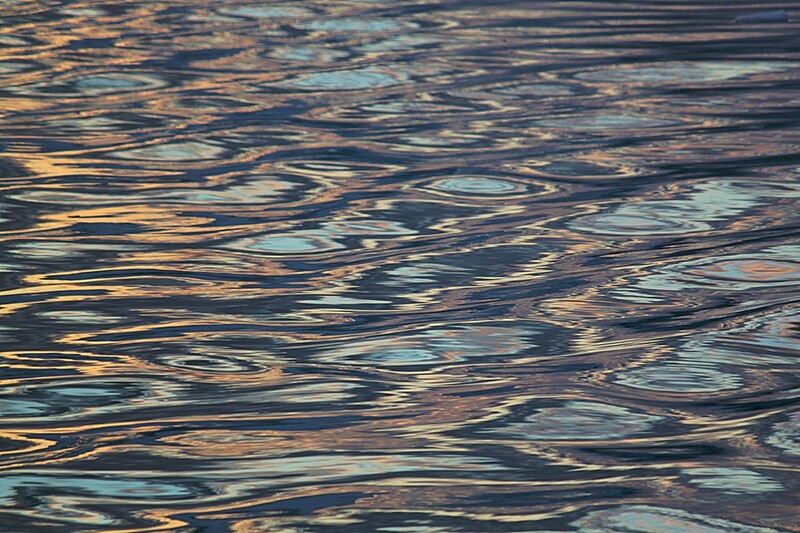 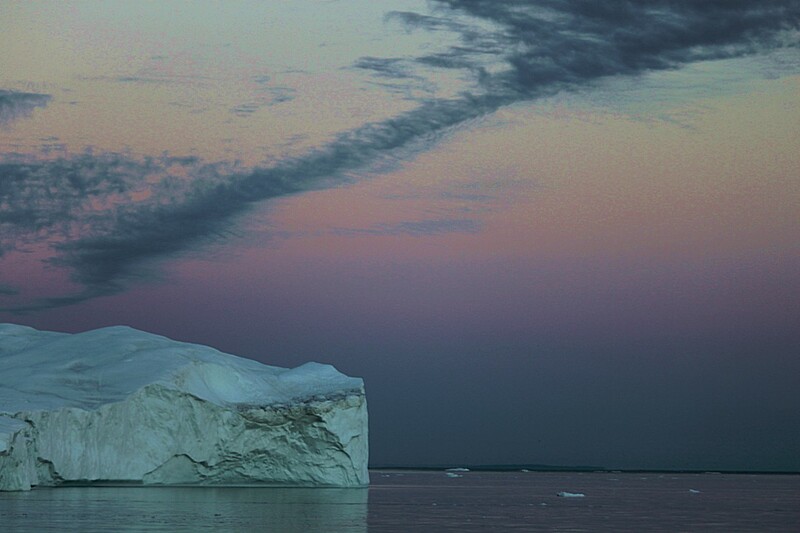 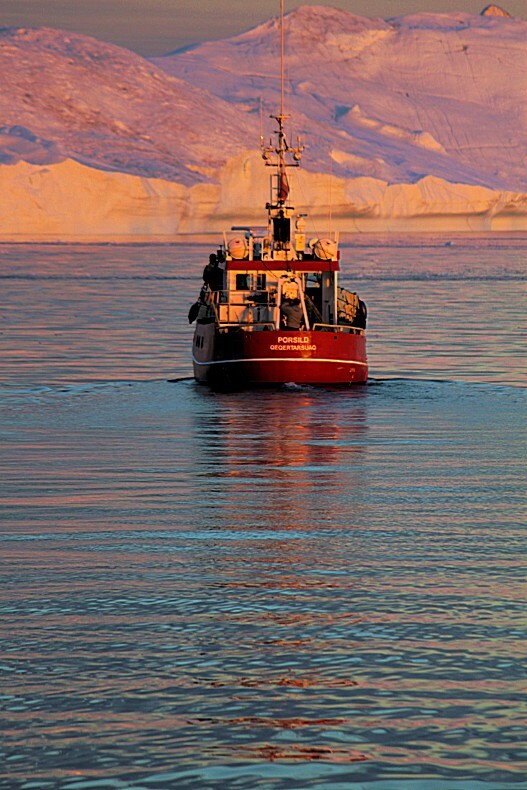 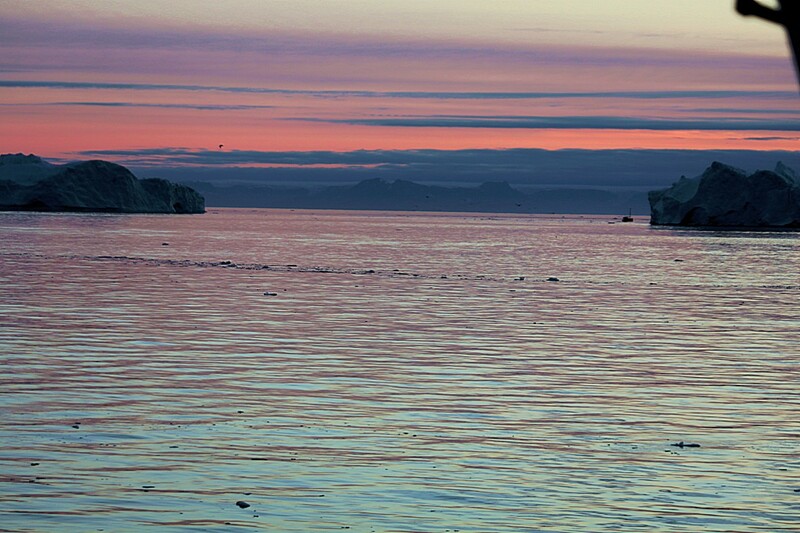 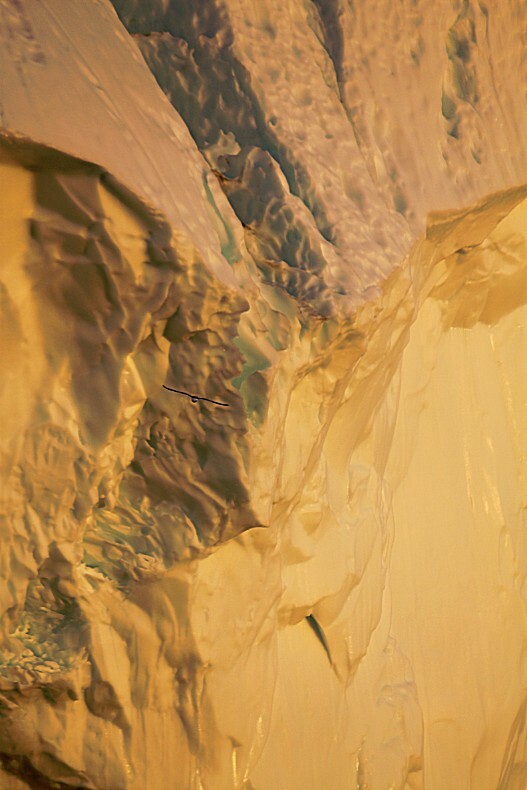 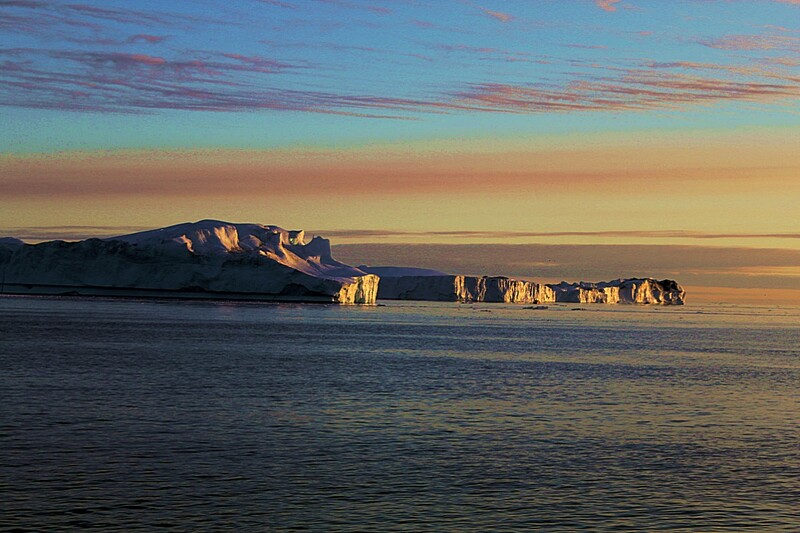 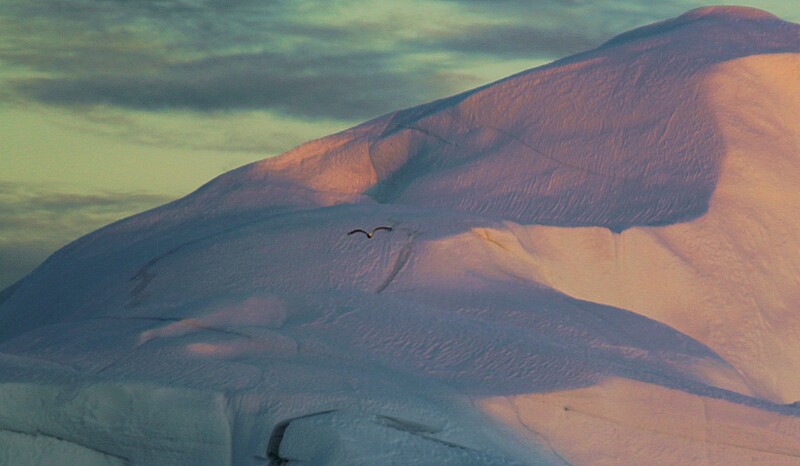 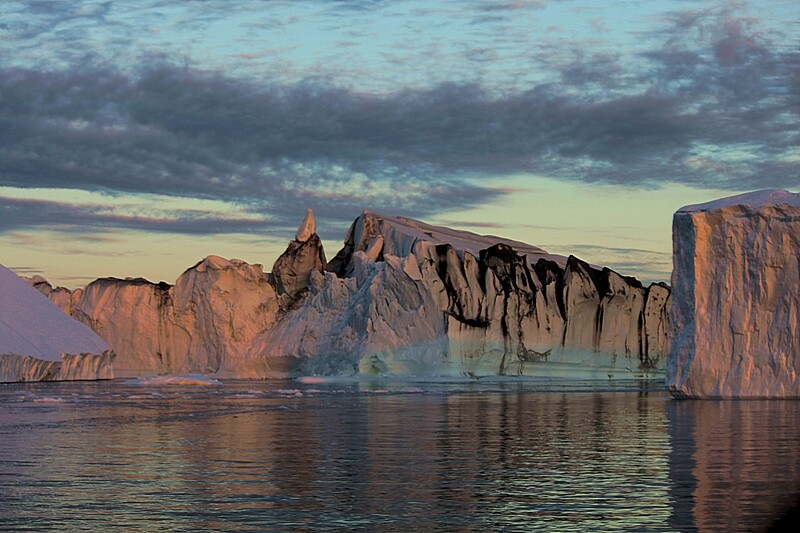 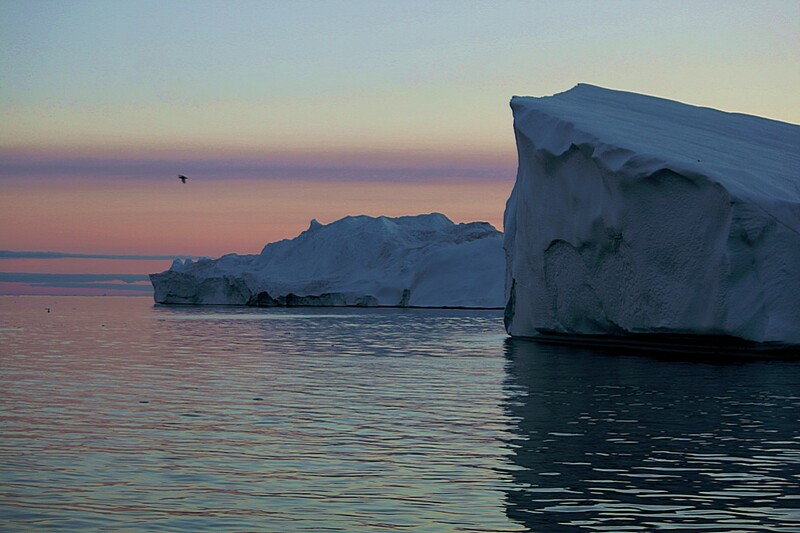 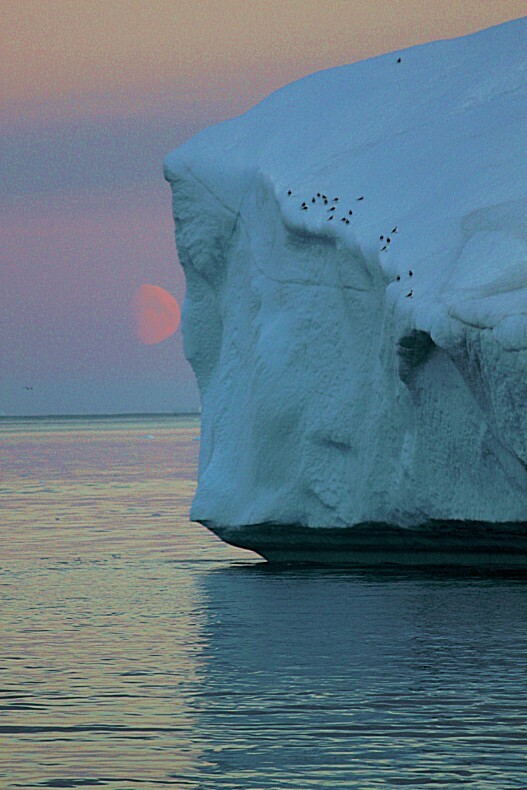 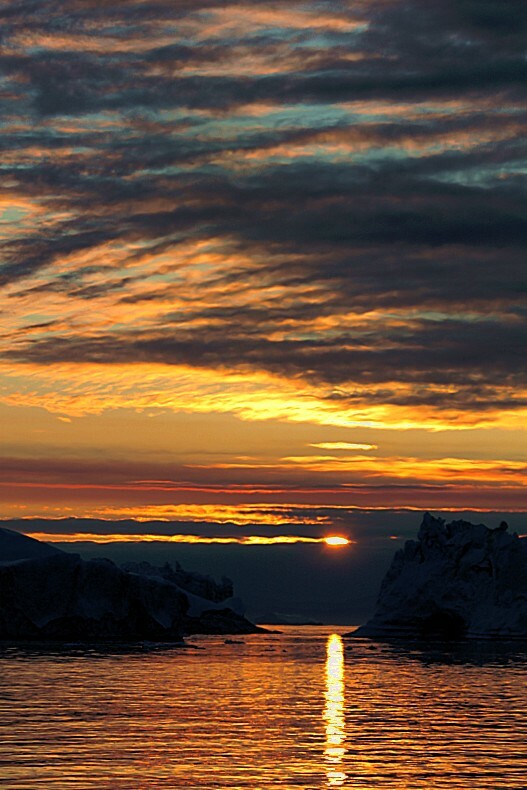 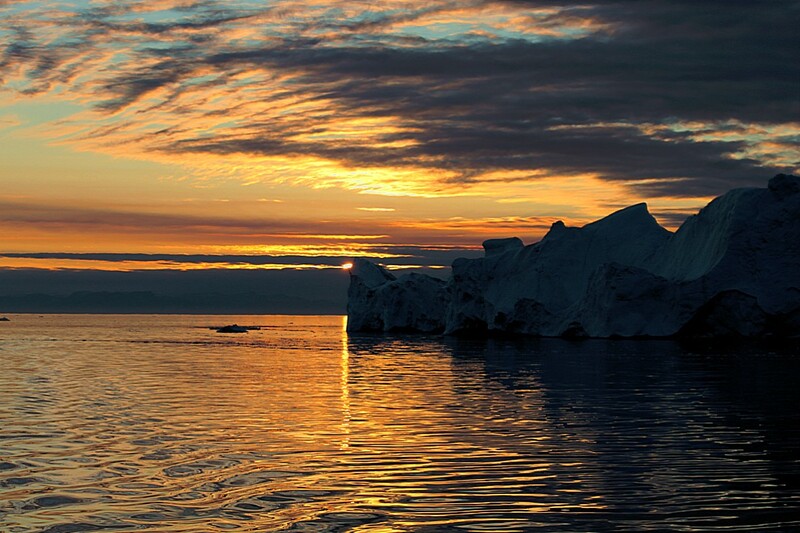 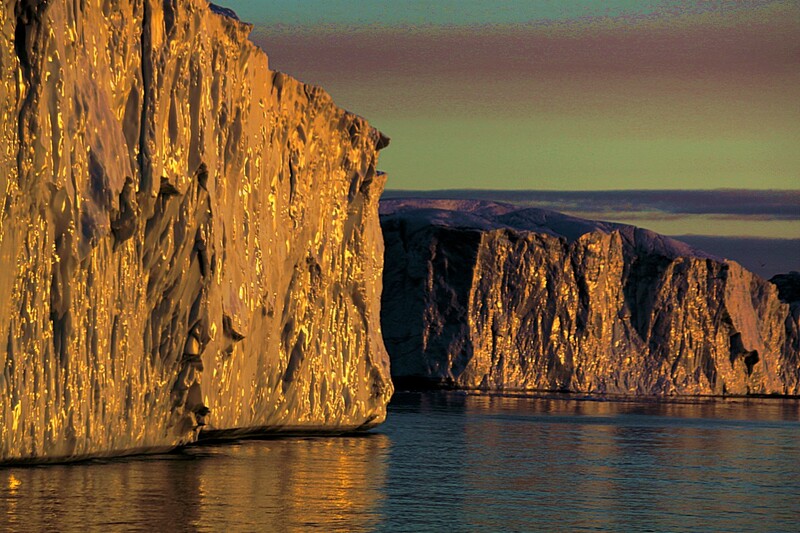 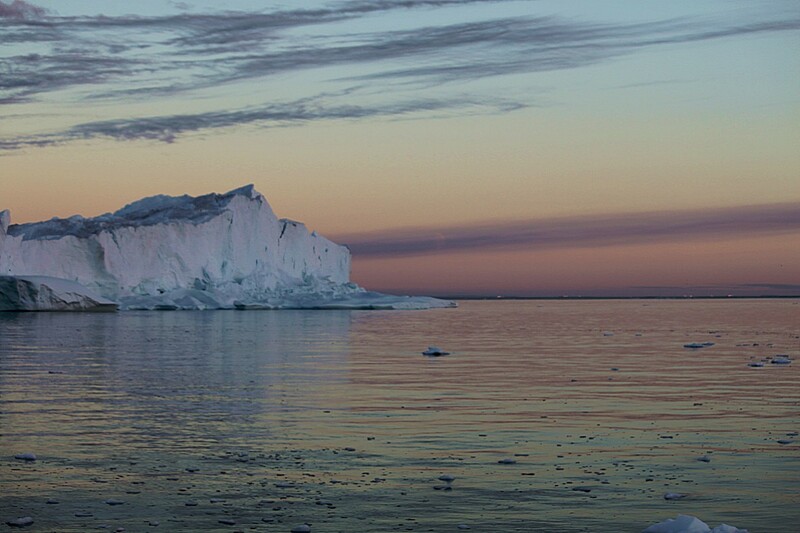 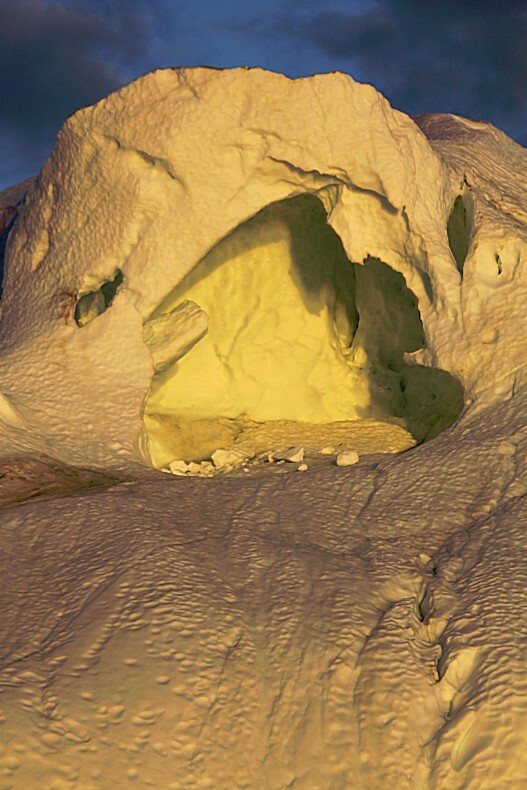 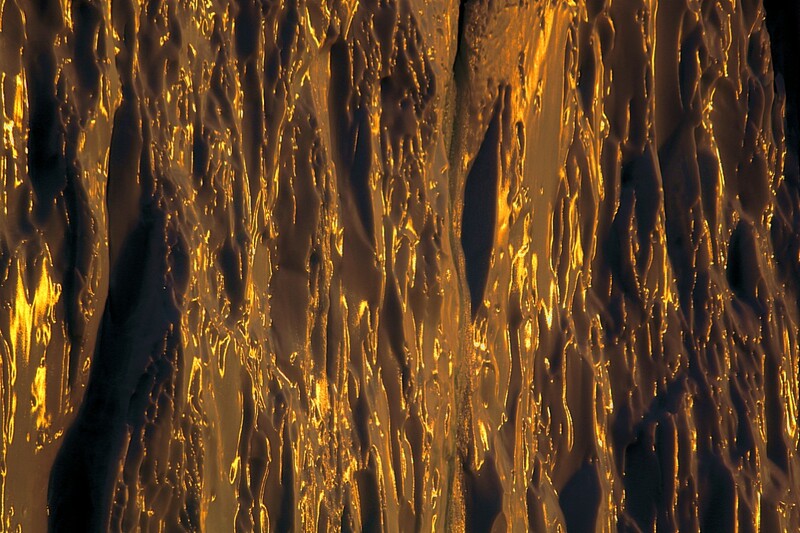 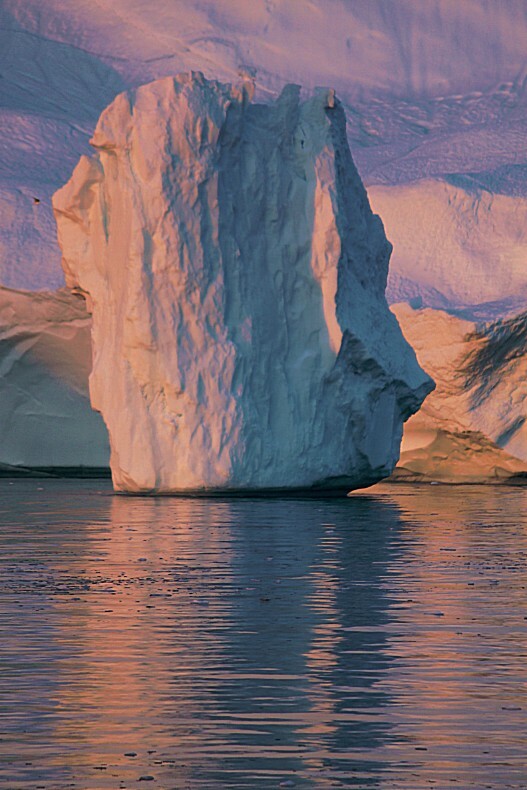 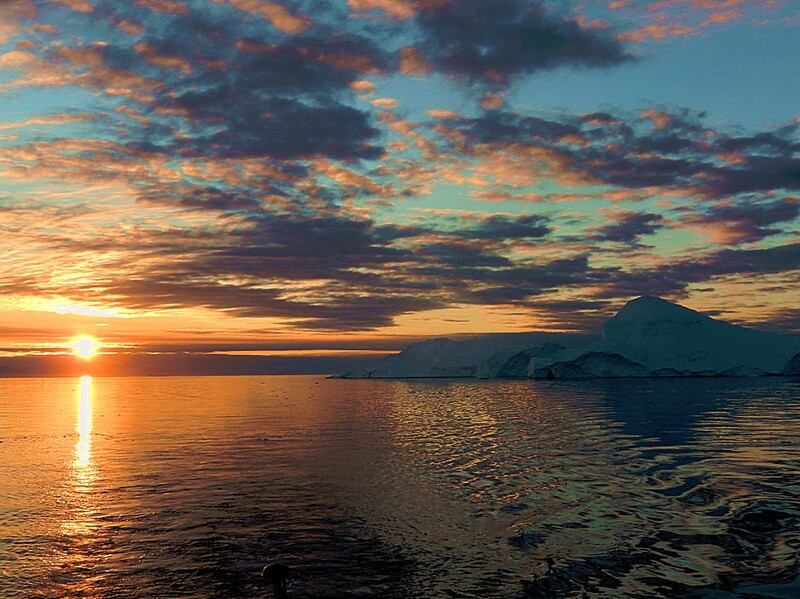 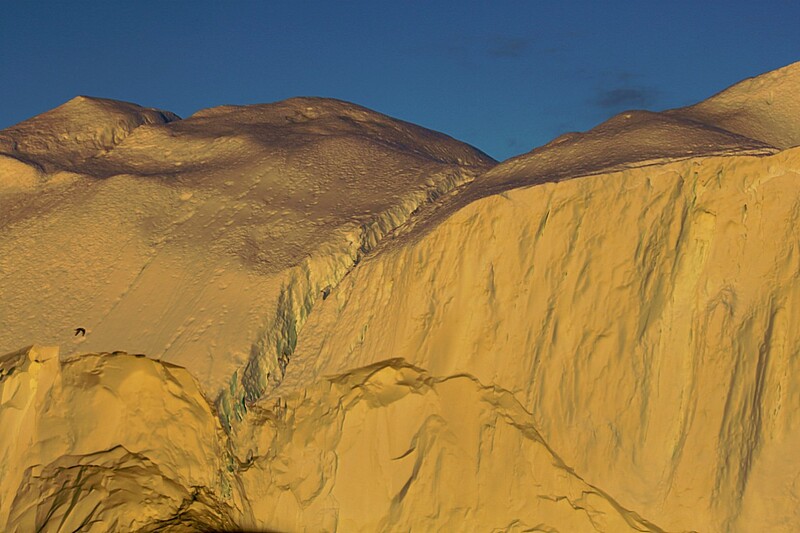 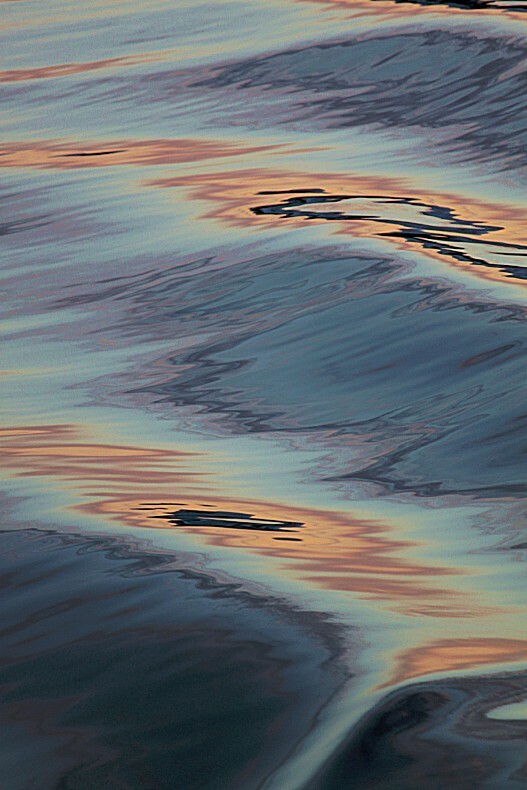 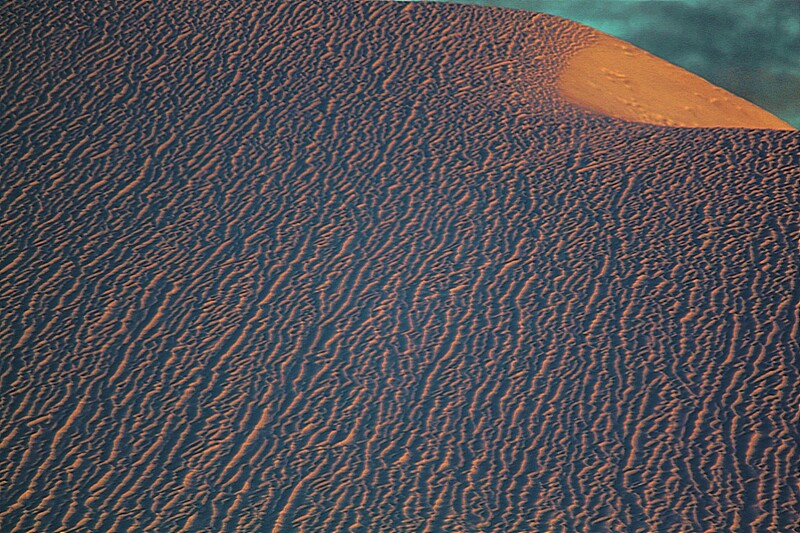 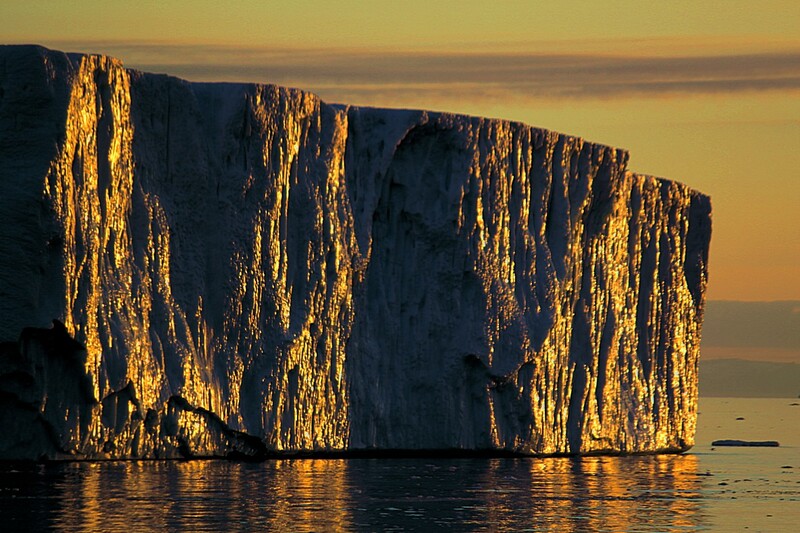 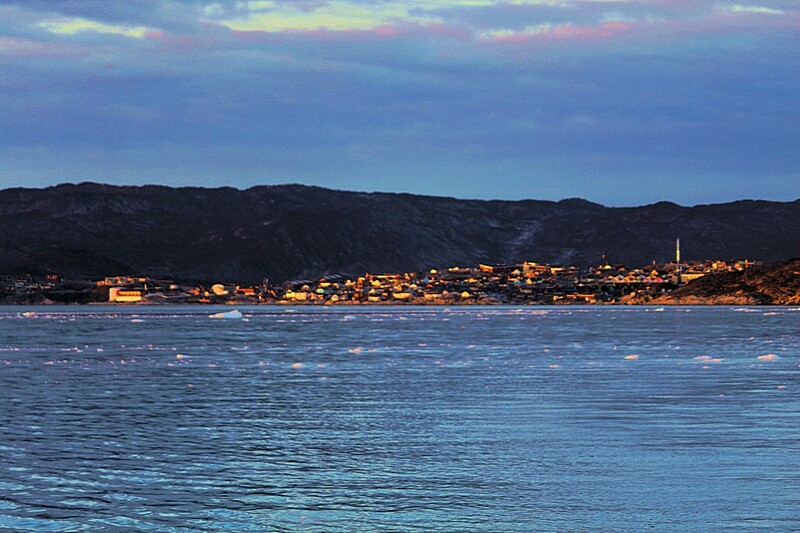 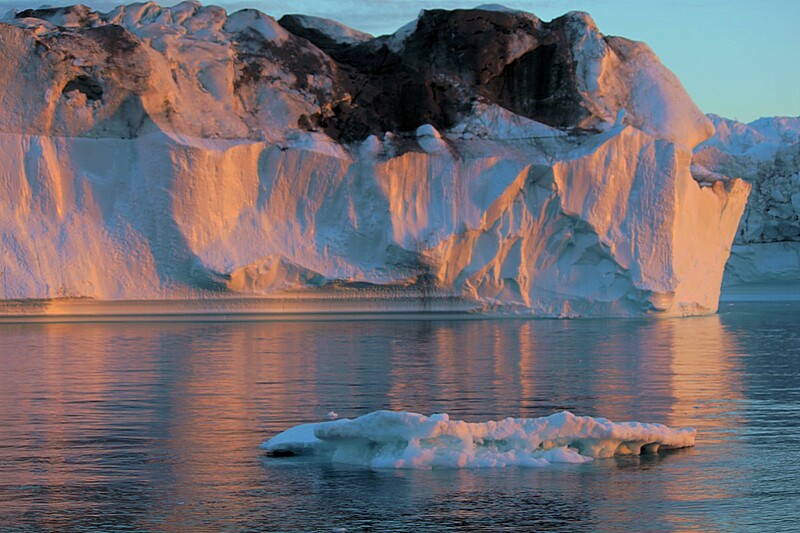 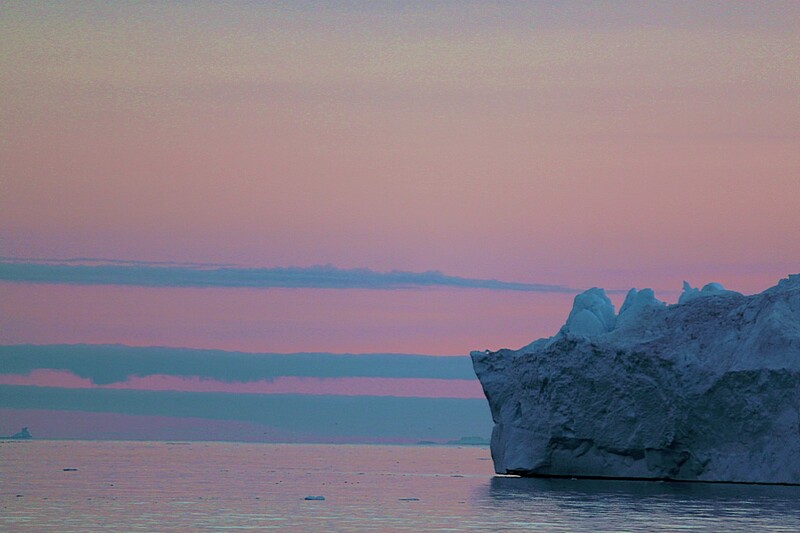 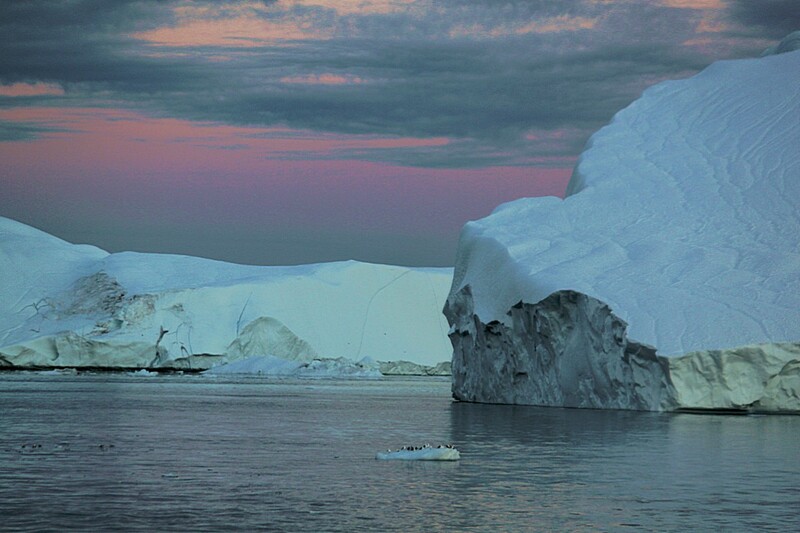 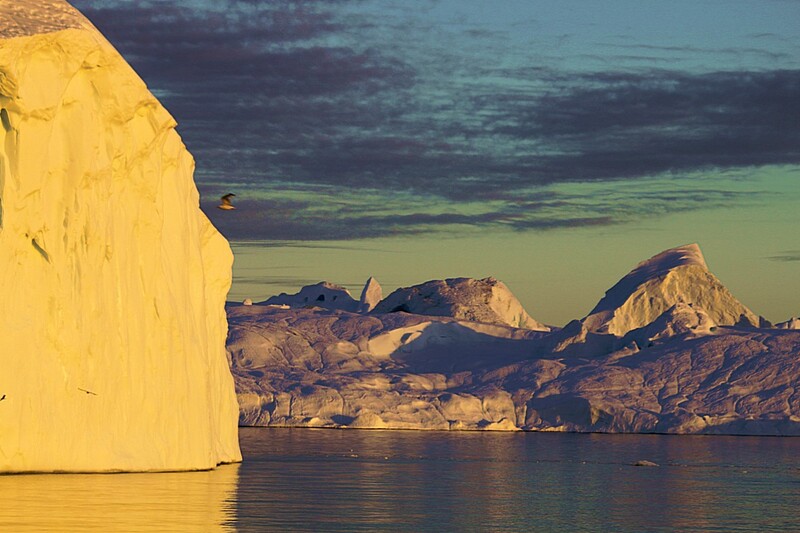 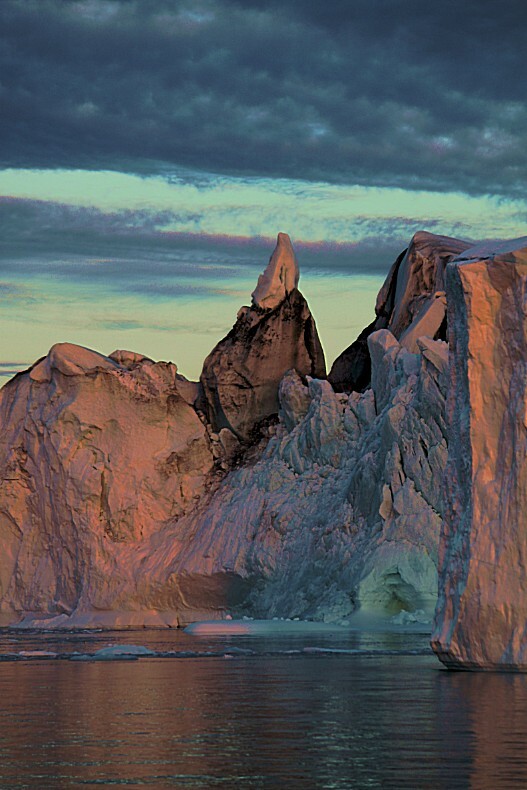 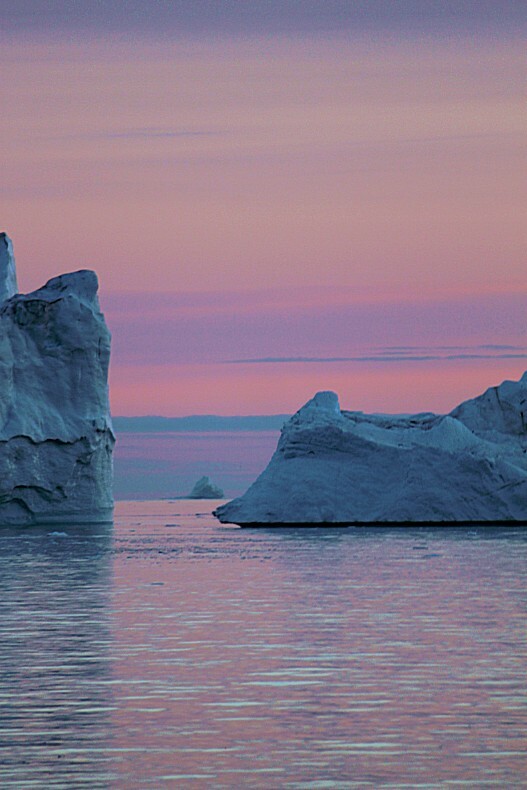 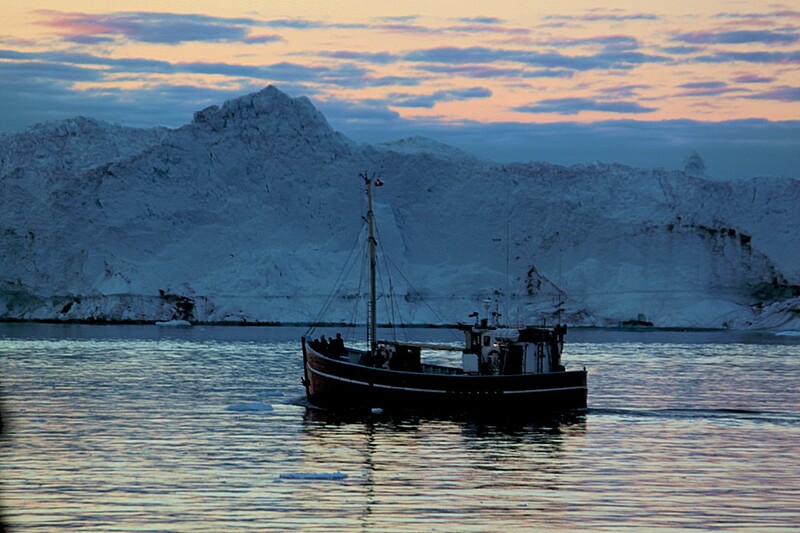 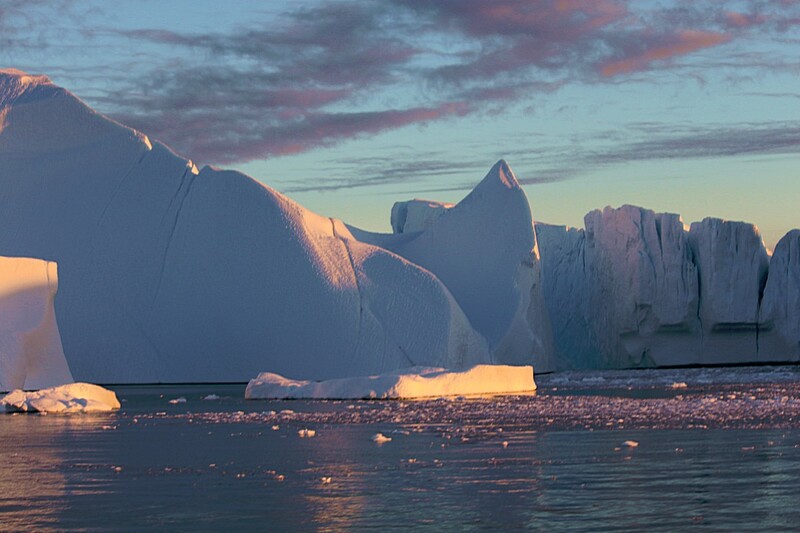 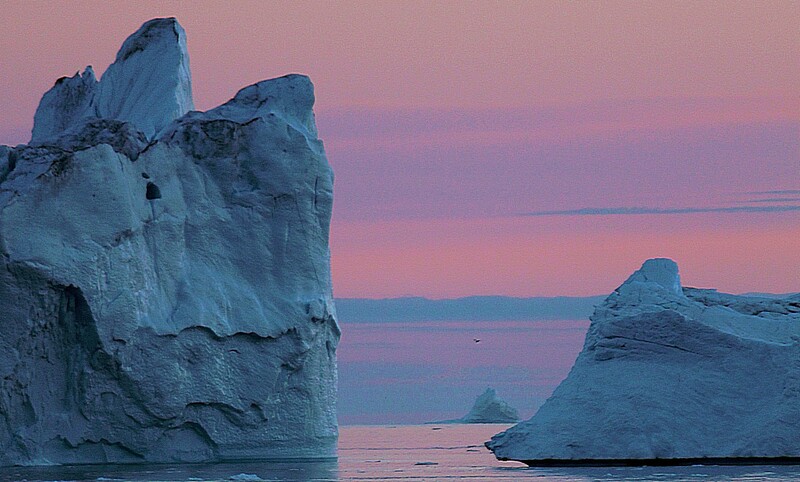 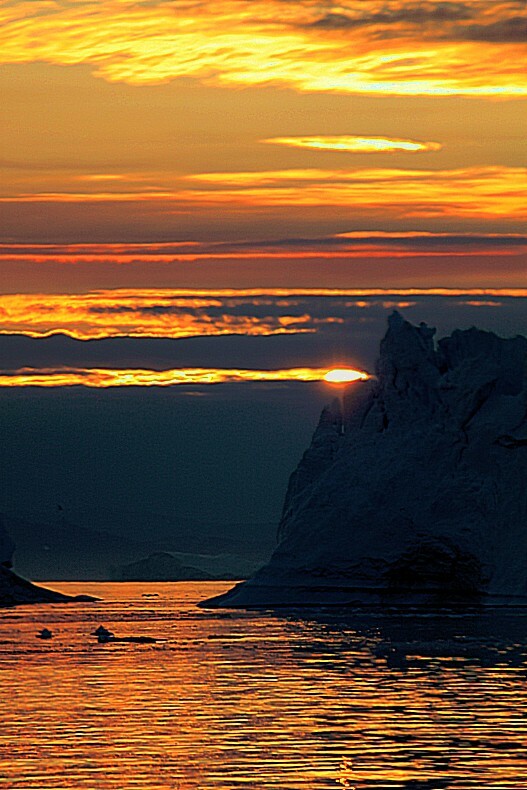 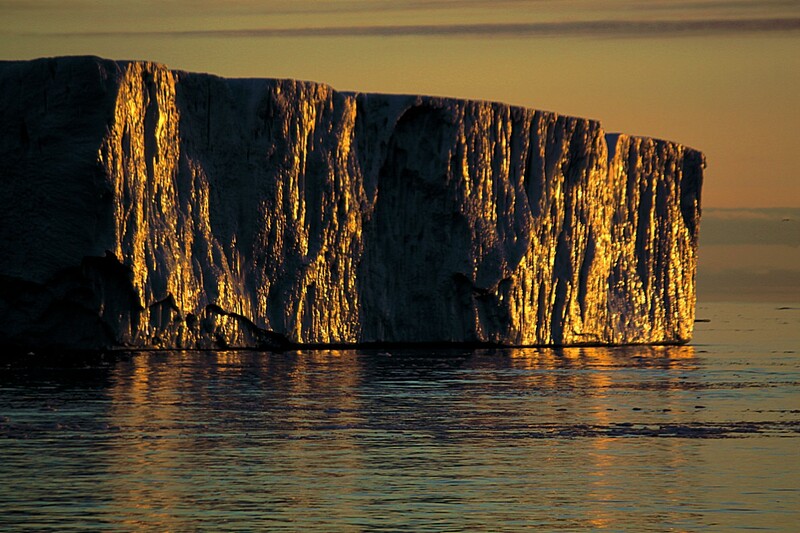 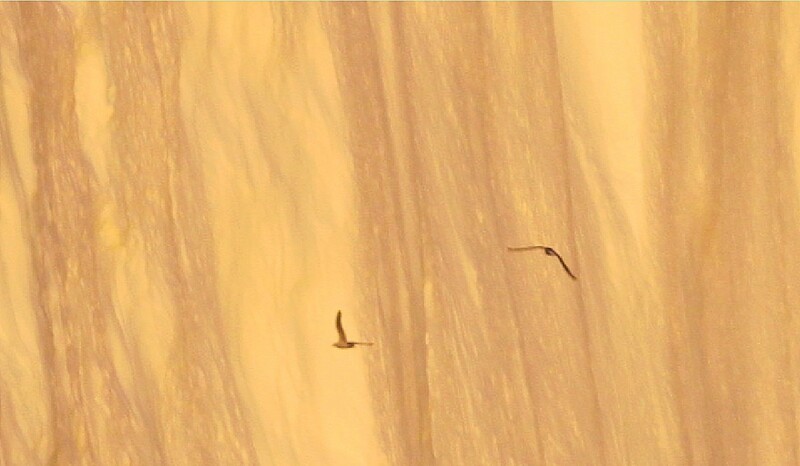 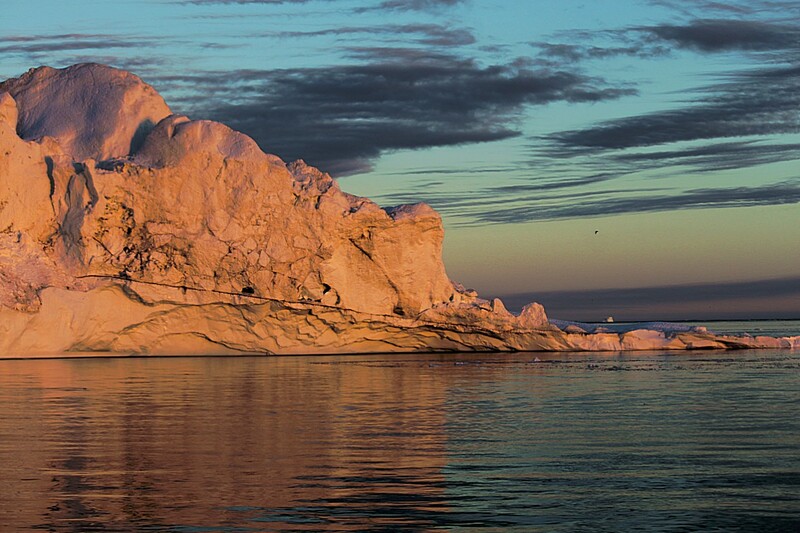 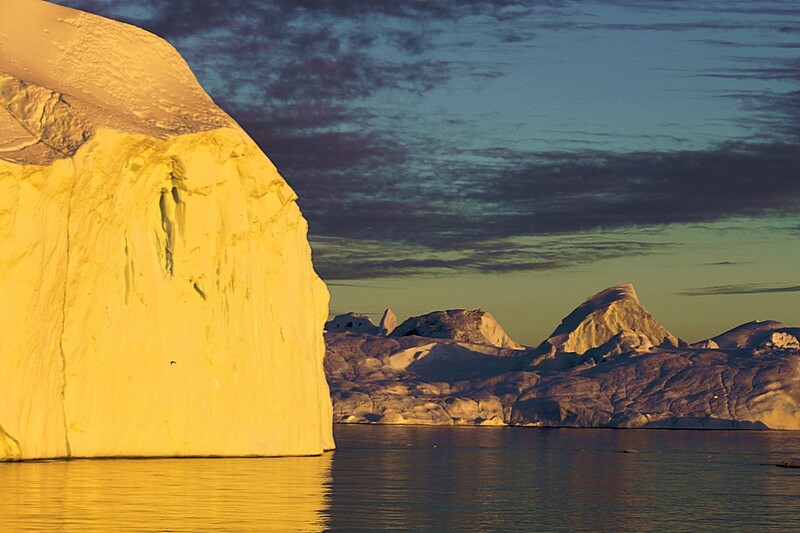 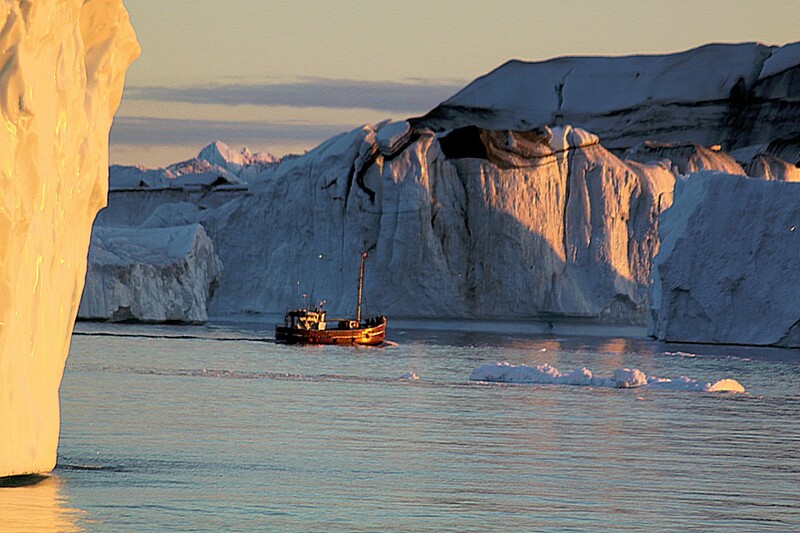 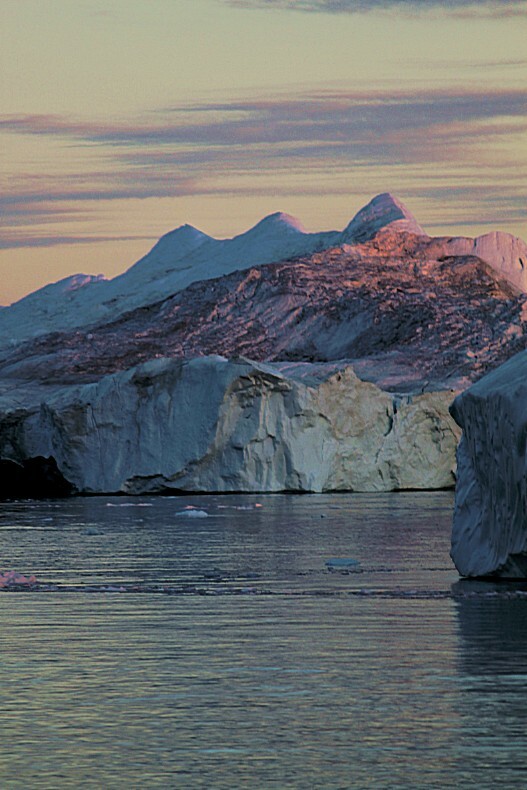 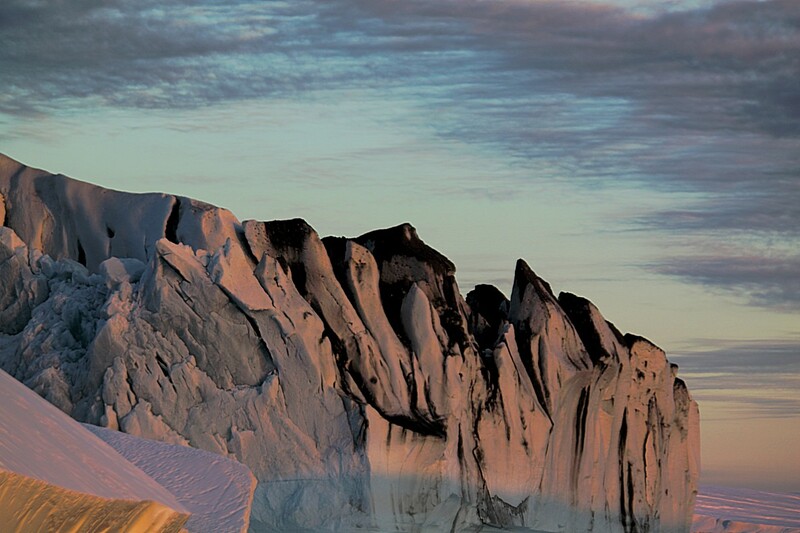 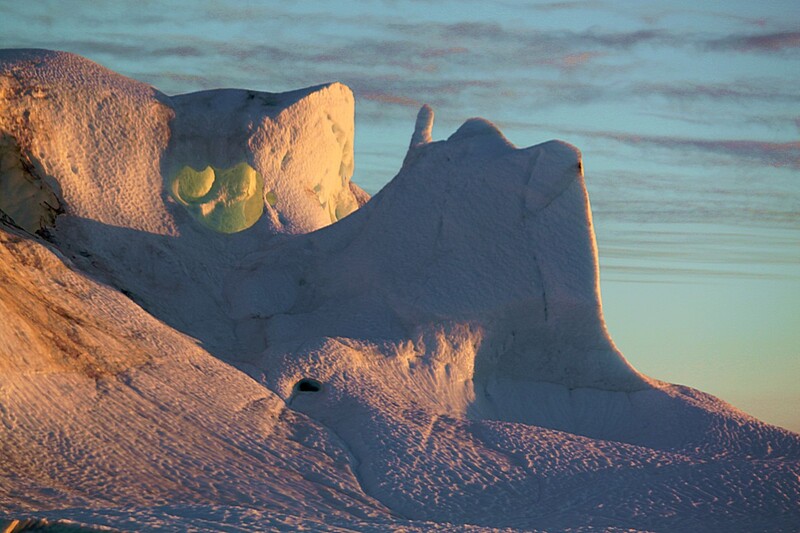 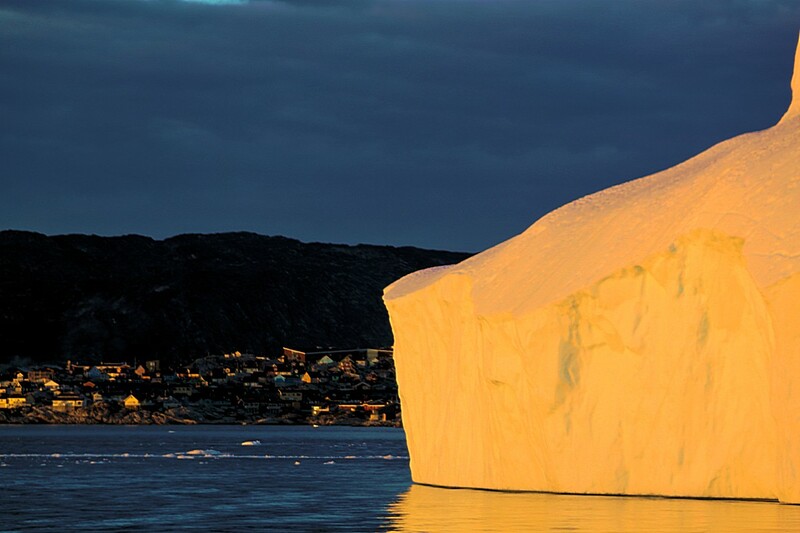 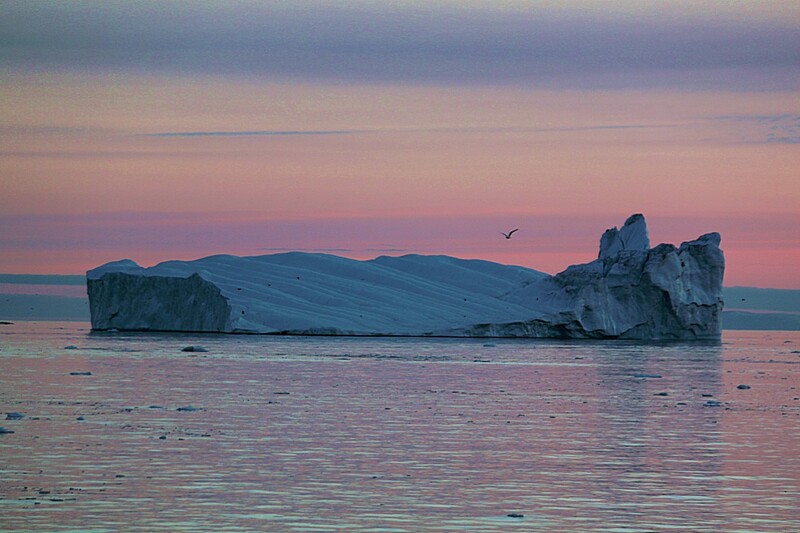 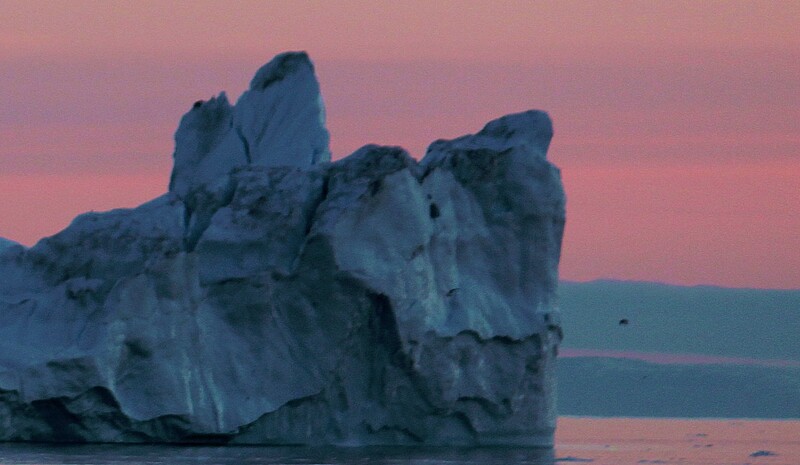 …and as the sun was setting even more, some of the icebergs started to glow like…. 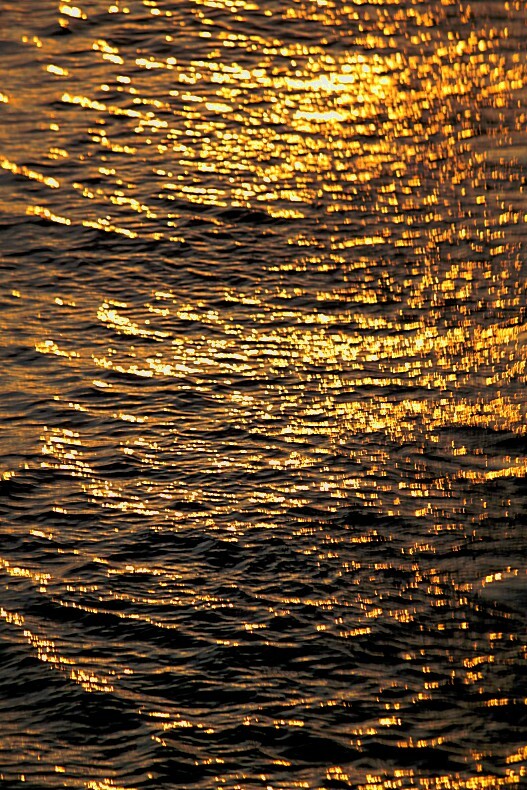 like…like gold!!! 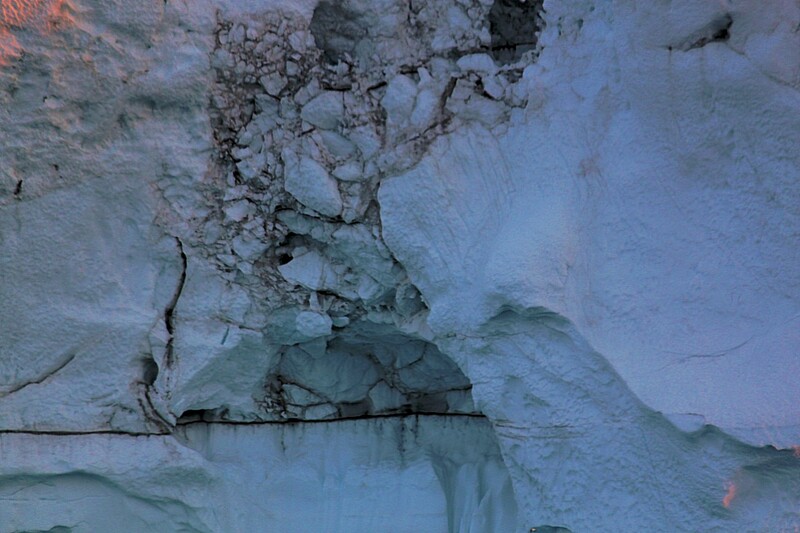 The following pictures show icebergs originated from the verge of the glacier and the inland ice. 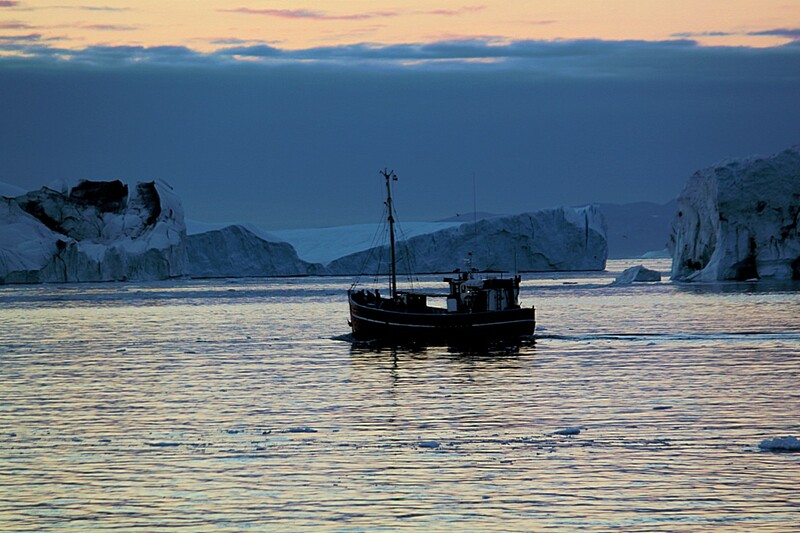 These pieces of ice have been scraping stones and sand from the rocky bottom and this is part of the proces, explaining how fjords are shaped. 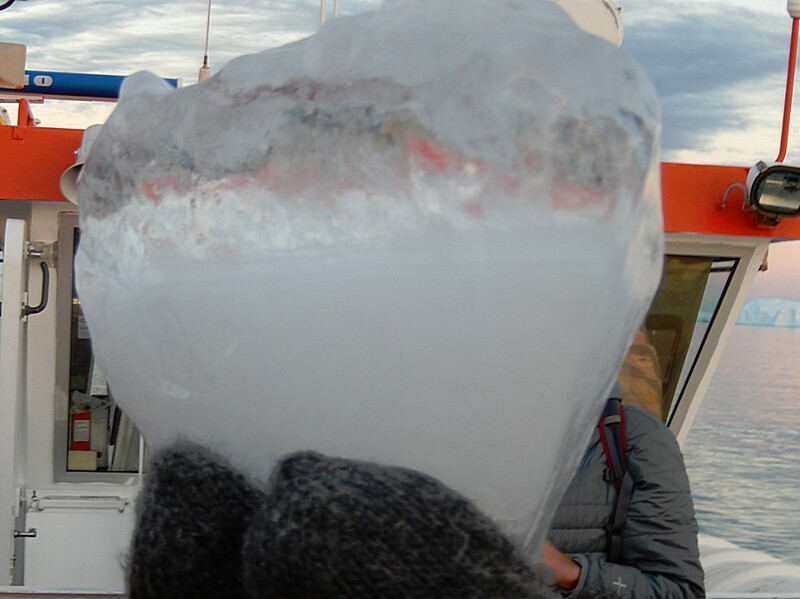 This piece of ice from Disco Bay shows a clear top and a white bottom. 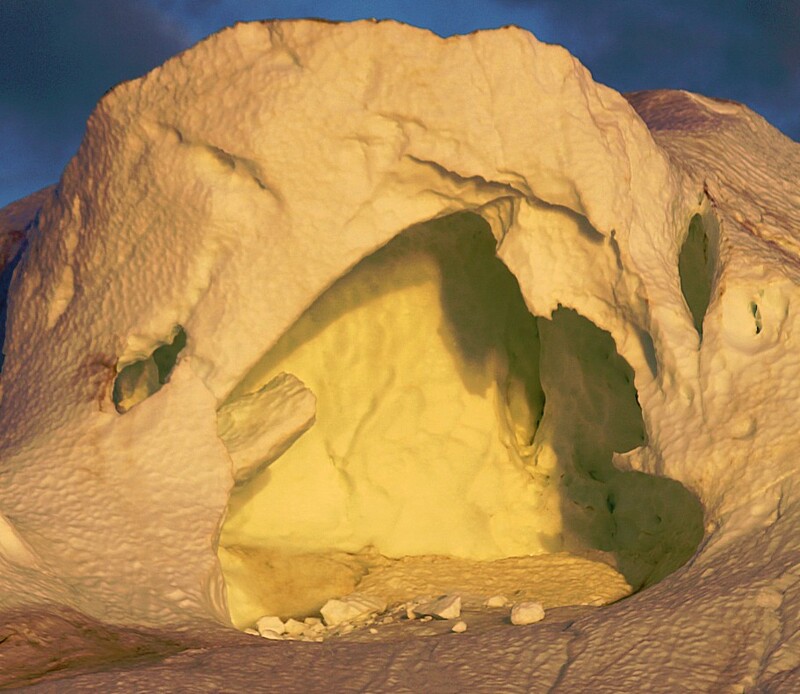 White ice is containing lots of tiny air pockets/bubbles,and its origin is from inland ice where snow layers were compressed into ice. 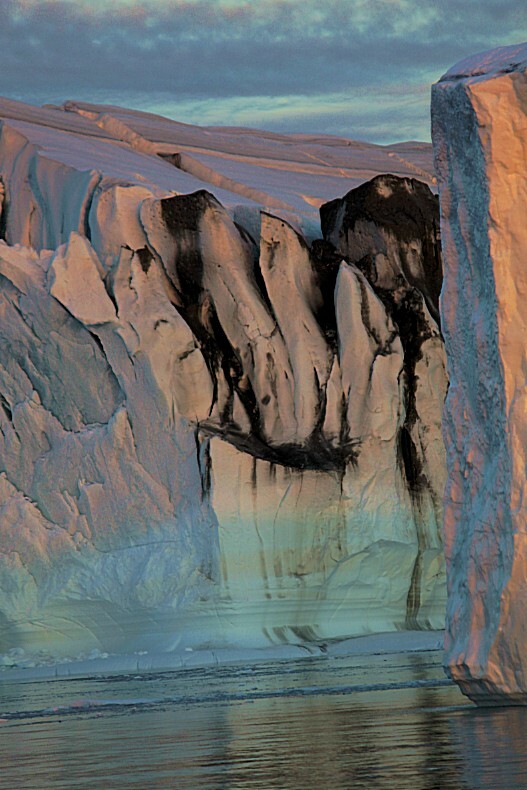 Black ice however is very clear and you can see through. 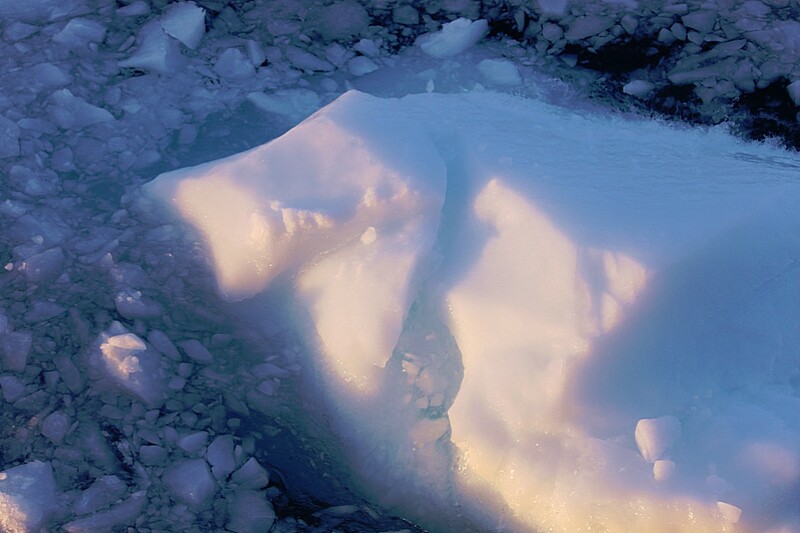 I consists of pure, clear frozen water (without air pockets). 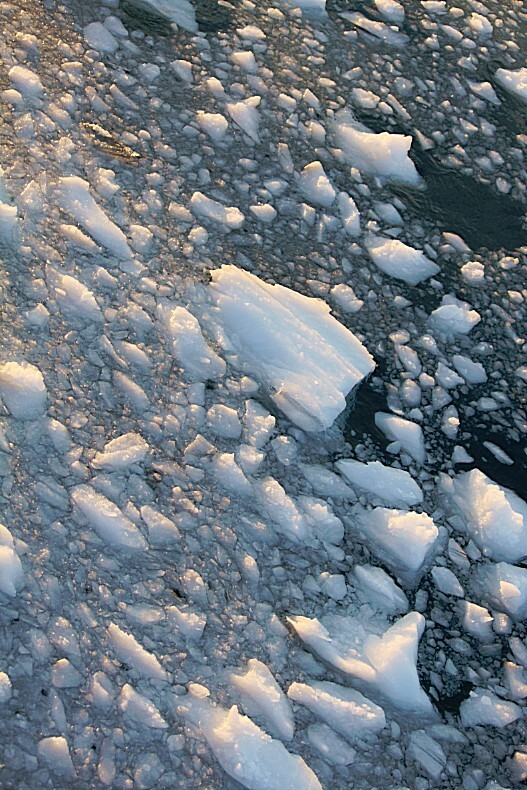 It is actually sea ice and these two kinds of ice can combine. 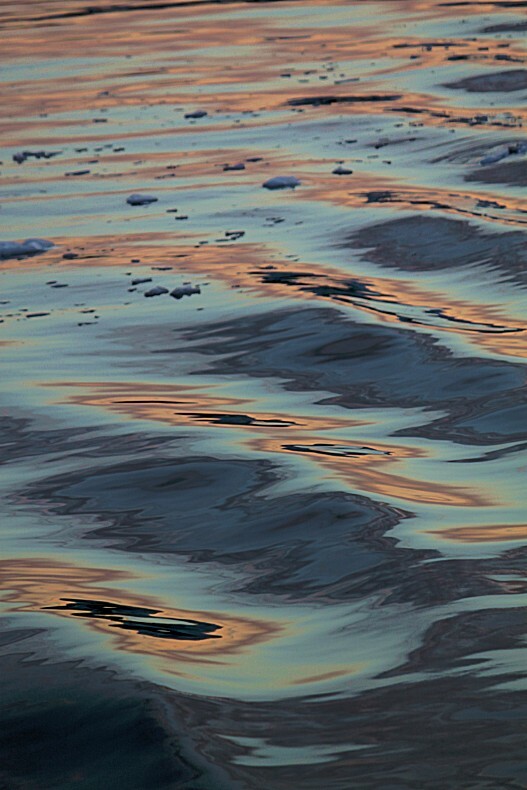 The origin of the name black ice is easily illustrated when you put the black ice in the sea. 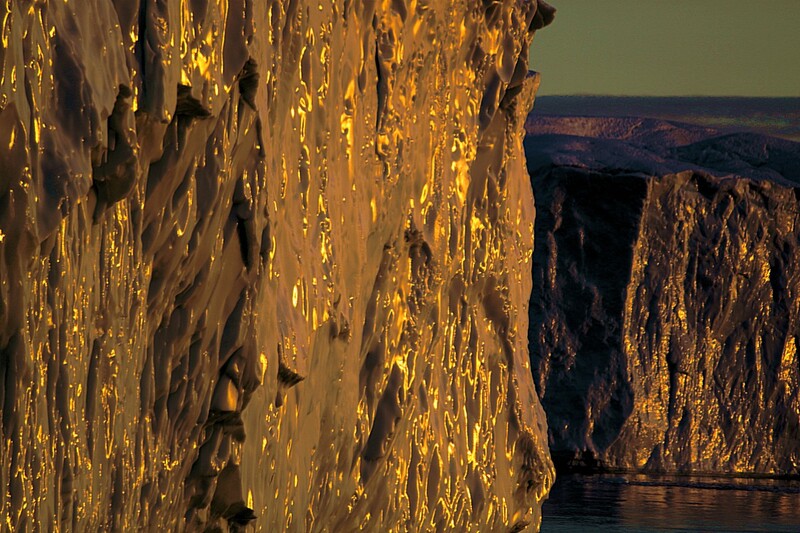 Then the ice becomes dark and nearly invisible to human eyes. 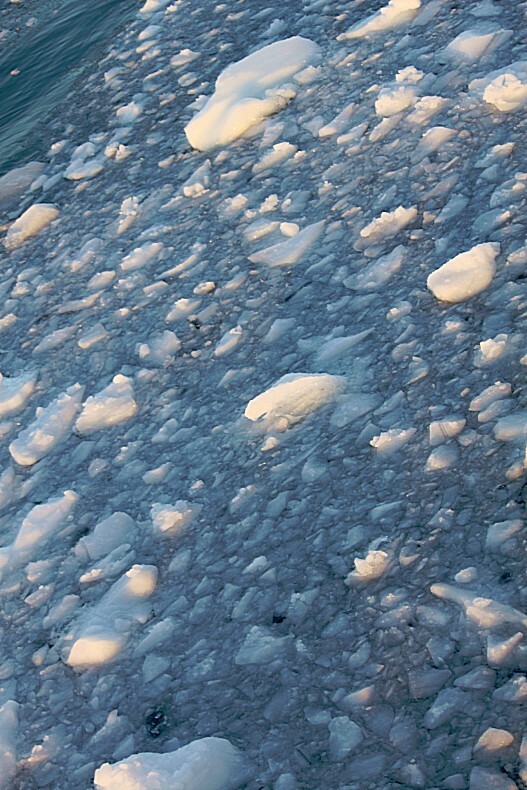 The white ice stays quite well visible in sea water. 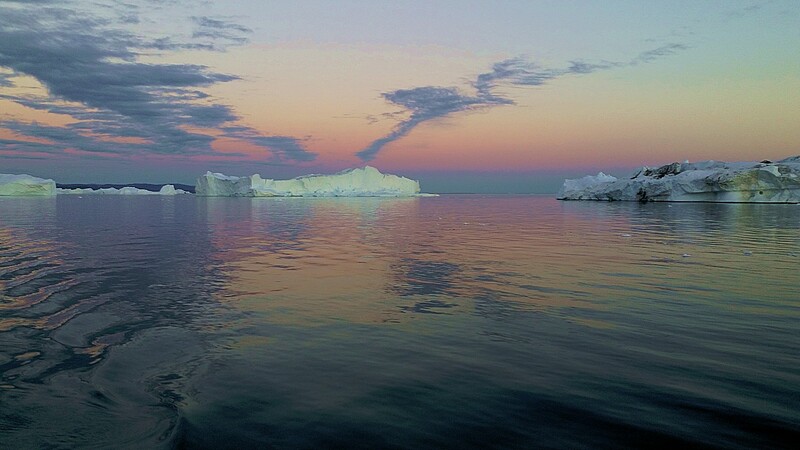 Then we returned to Ilulissat where we arrived at around 00.30 and then I returned to Hotel Arctic where drank a beer and went to my room for some beautiful dreams ;-).